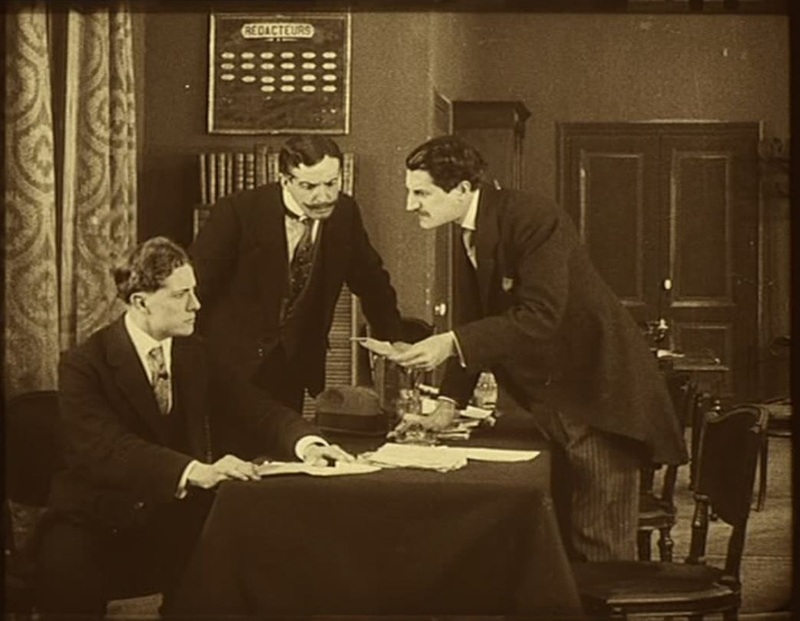 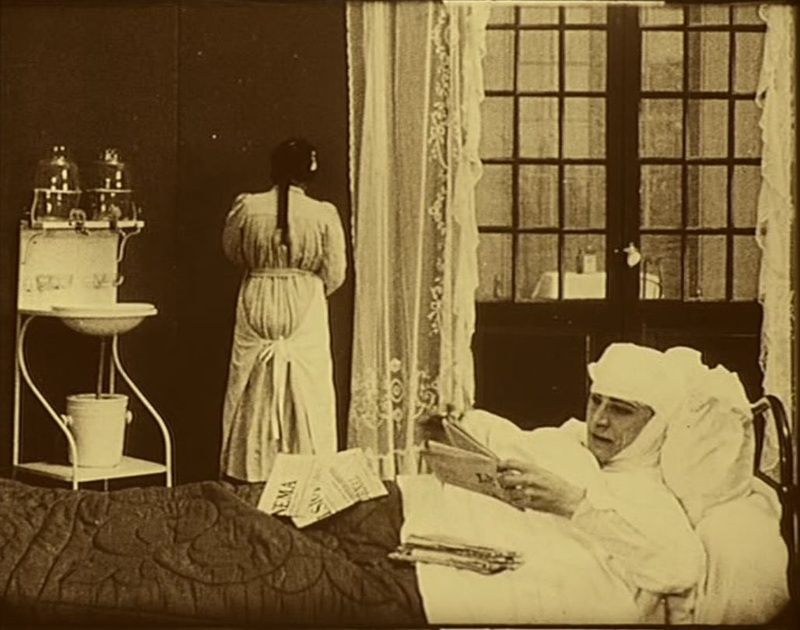 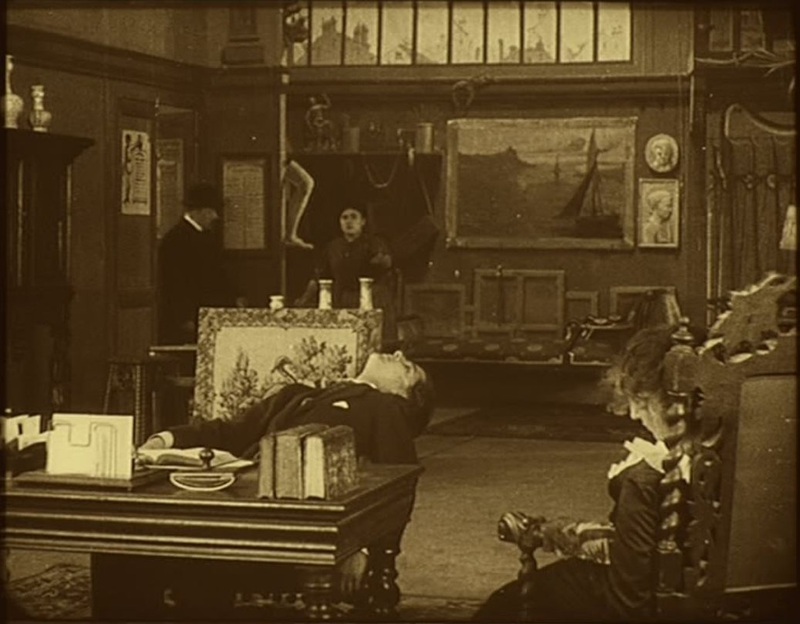 The opening prologue shows Fandor in a hospital room, recovering from the explosion in which Juve was killed, apparently. 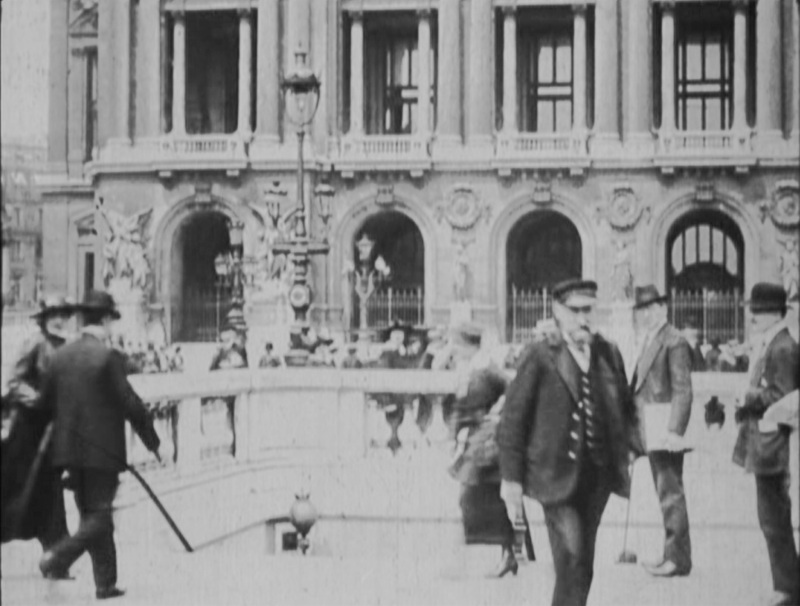 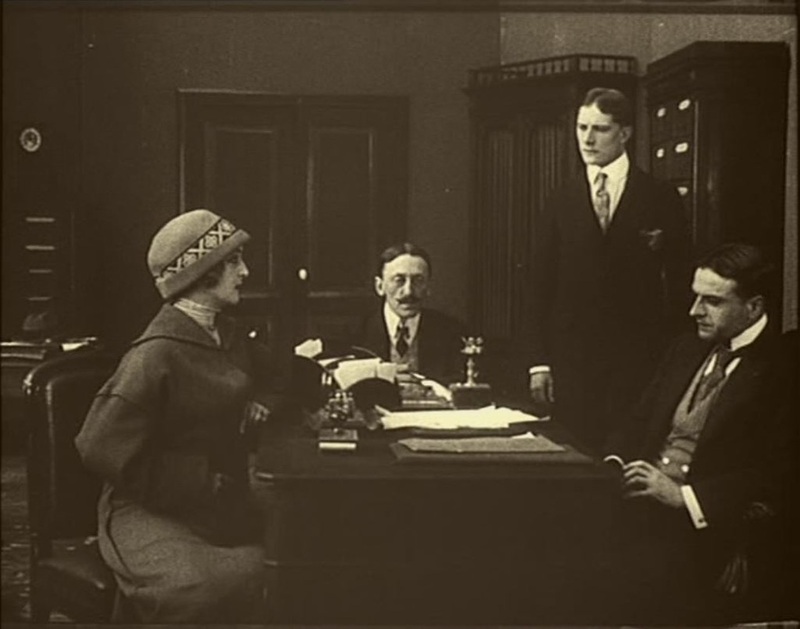 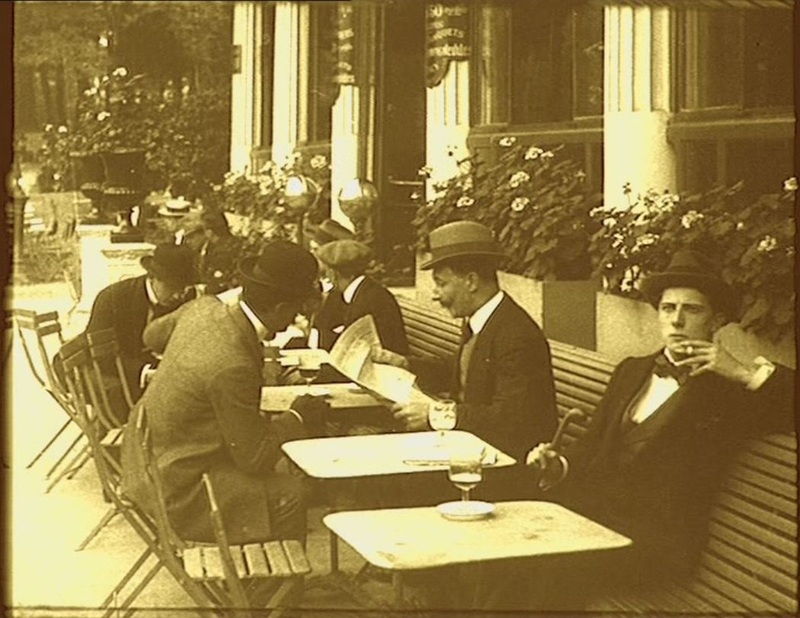 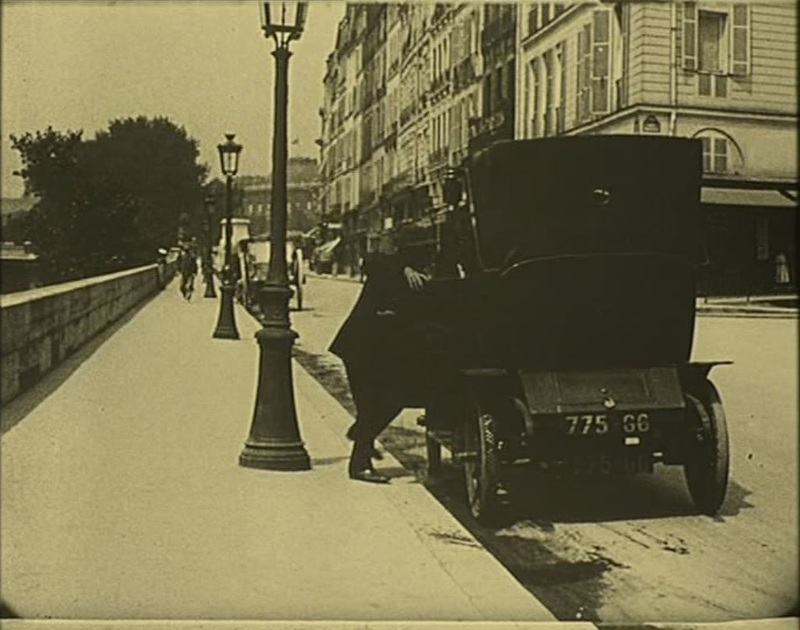 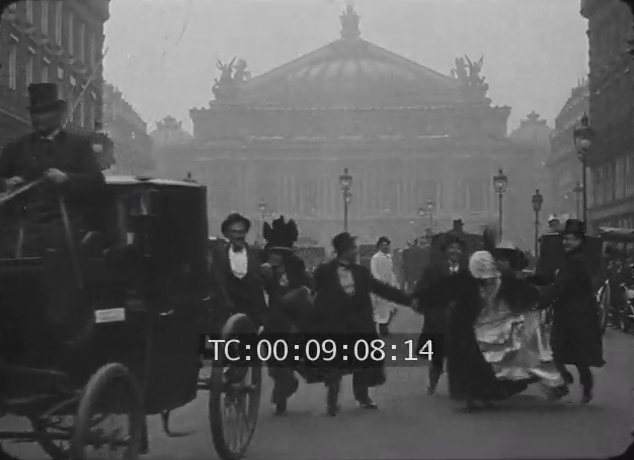 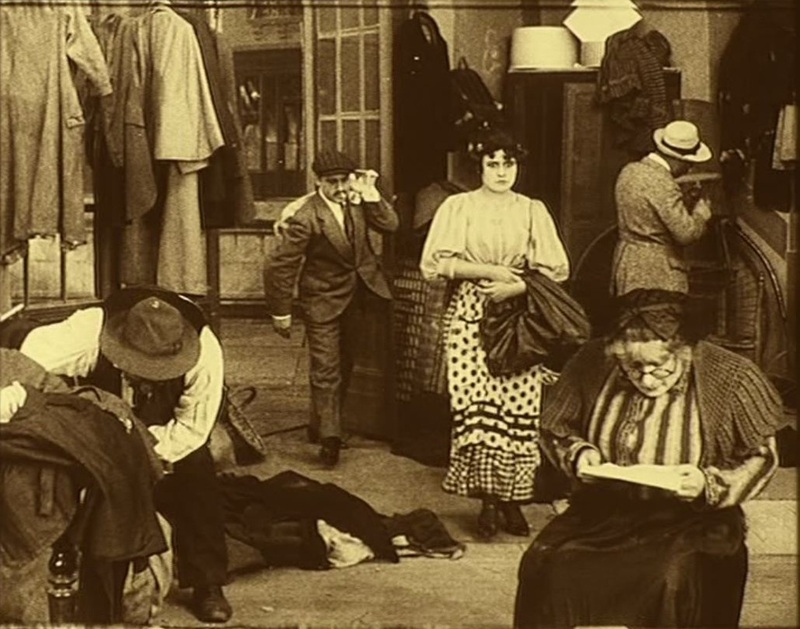 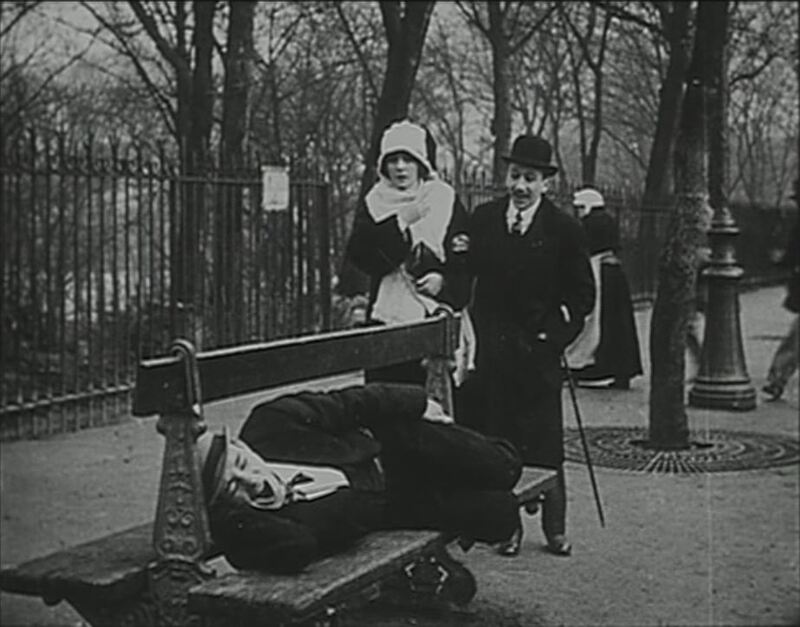 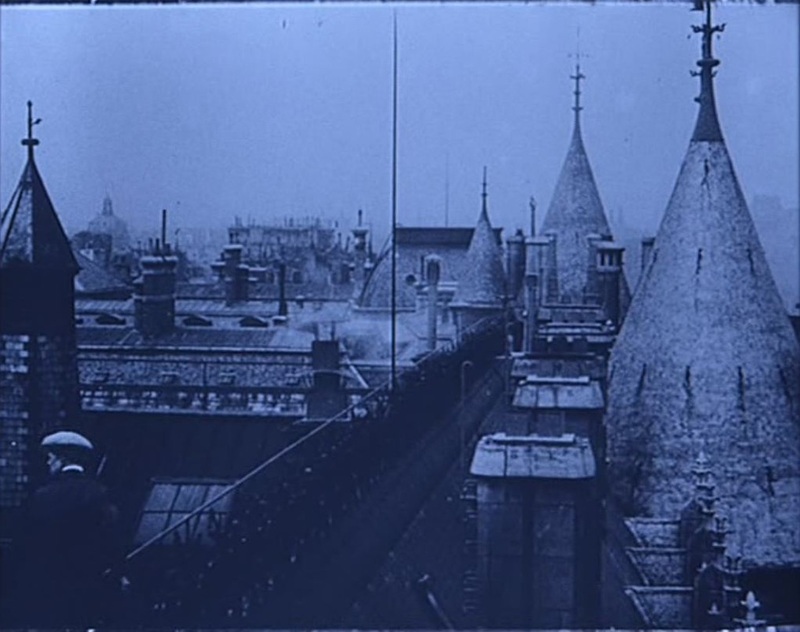 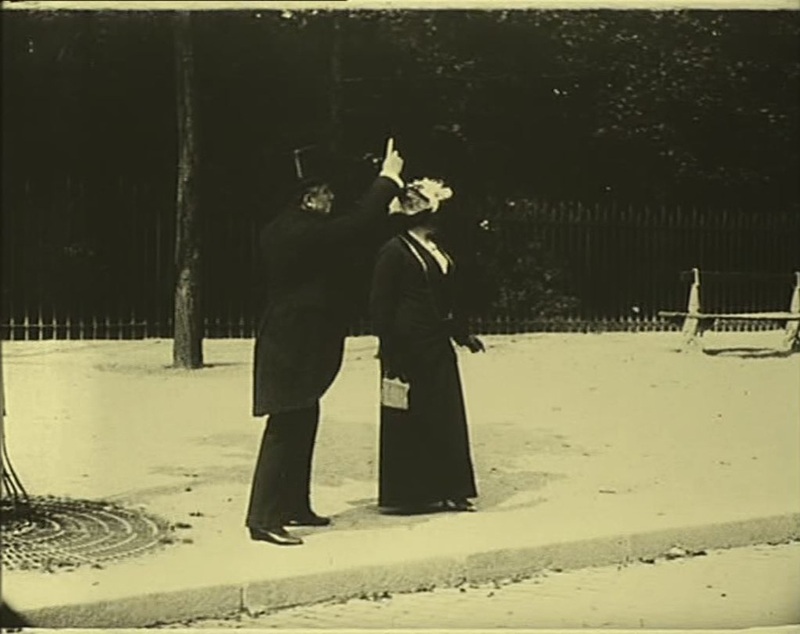 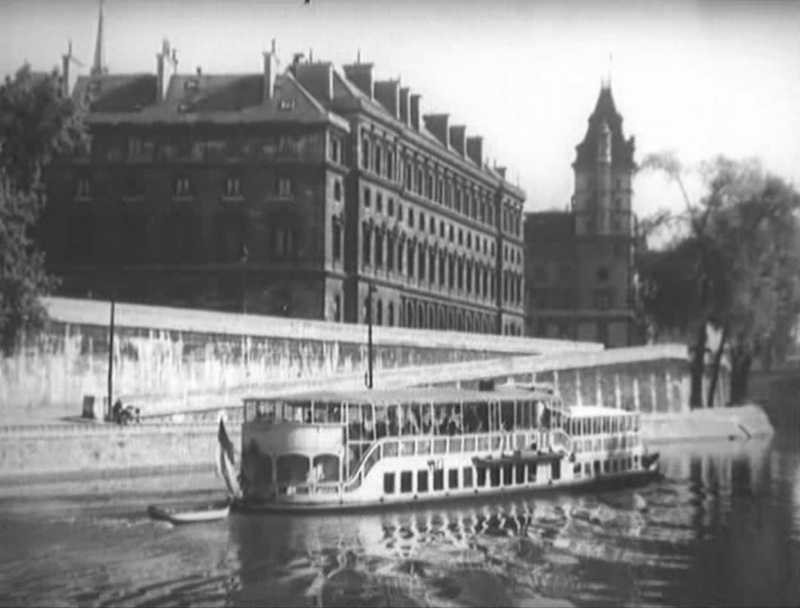 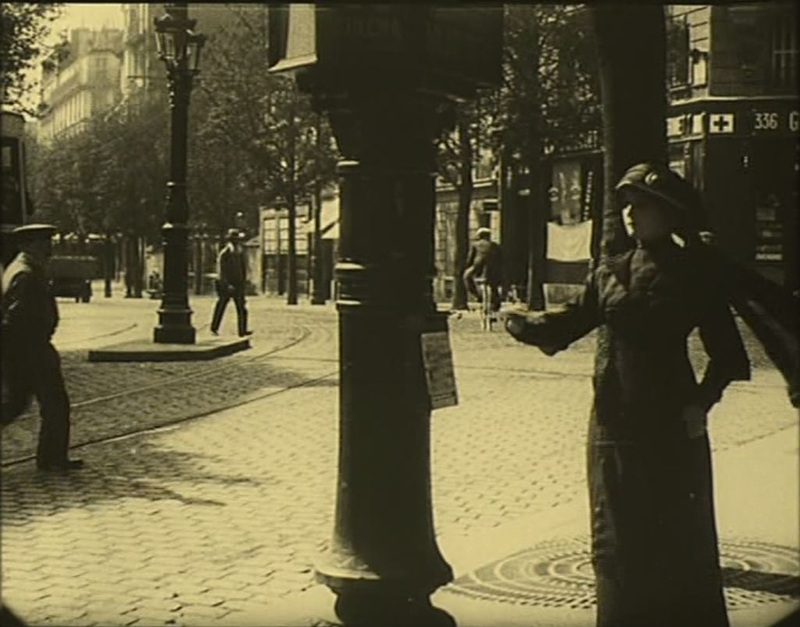 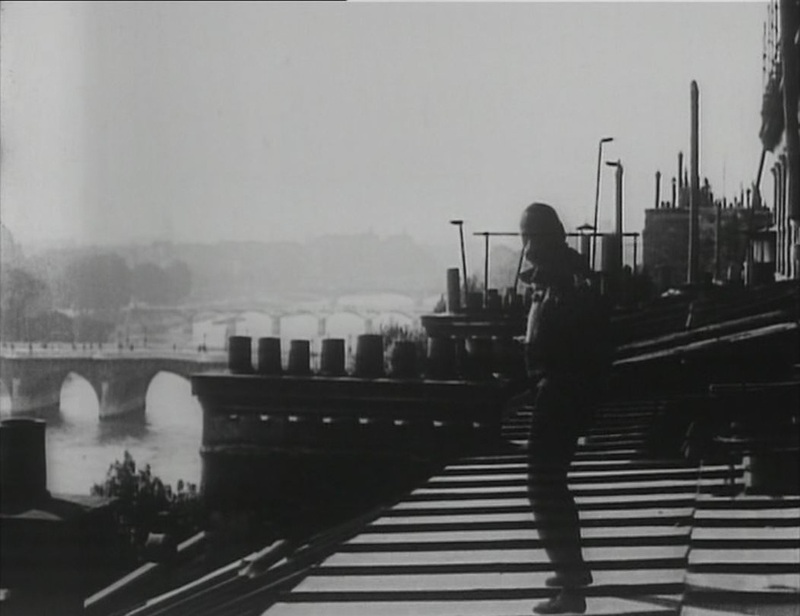 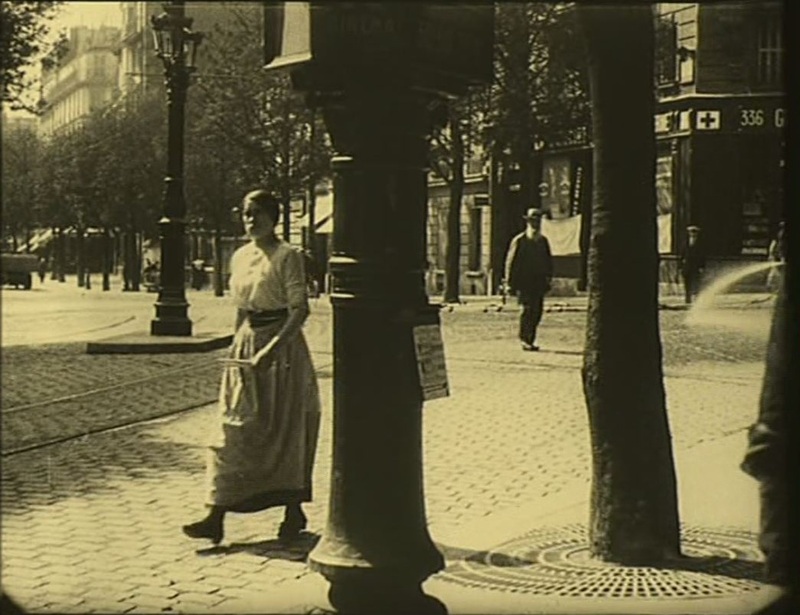 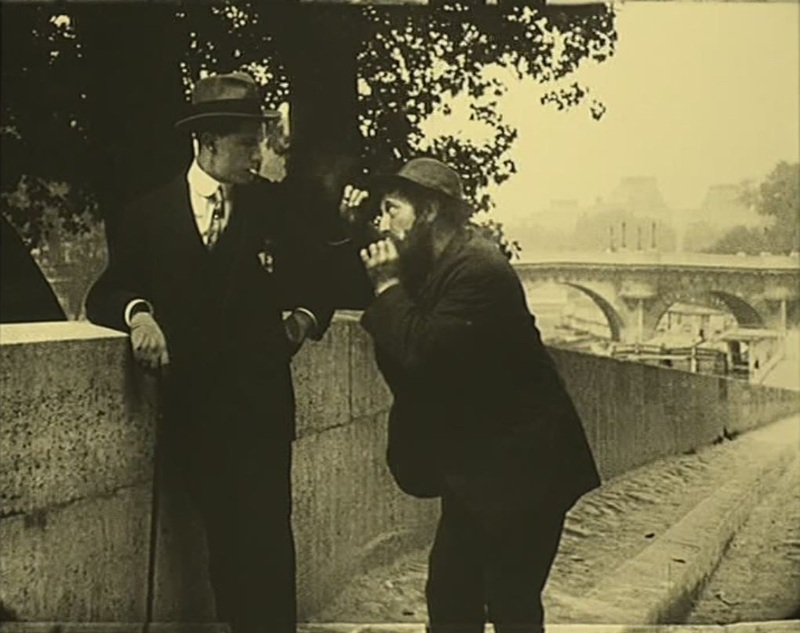 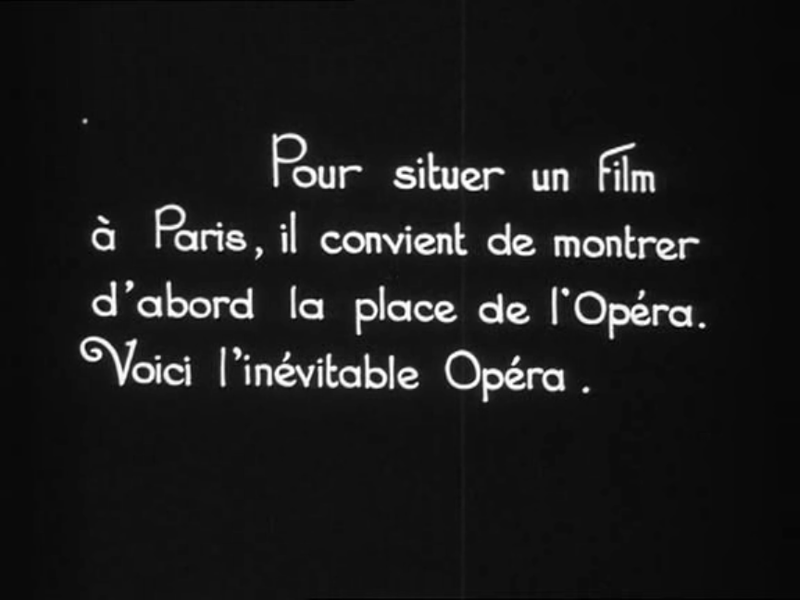 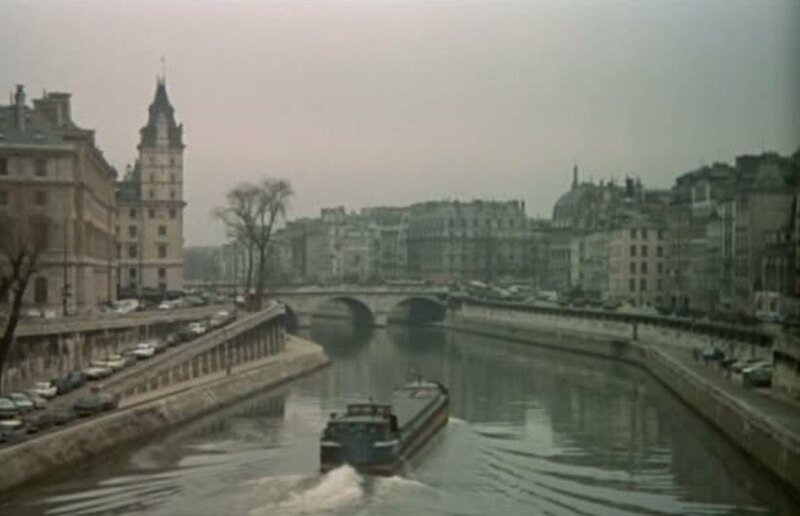 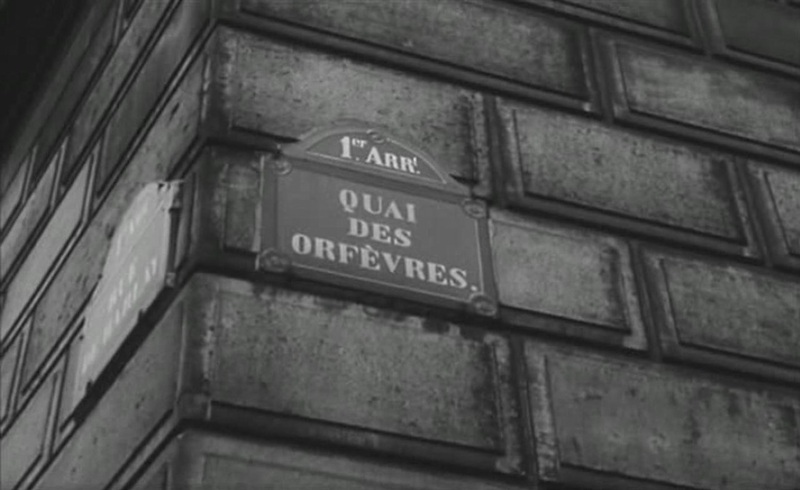 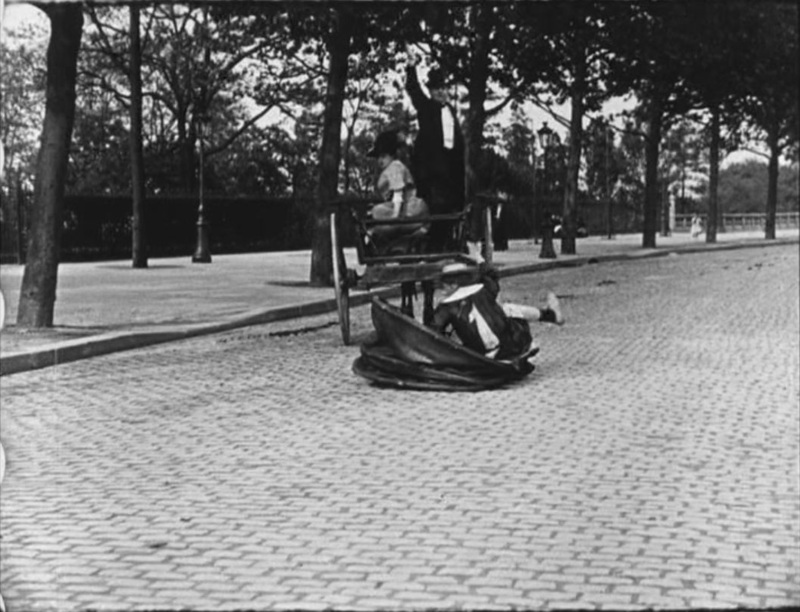 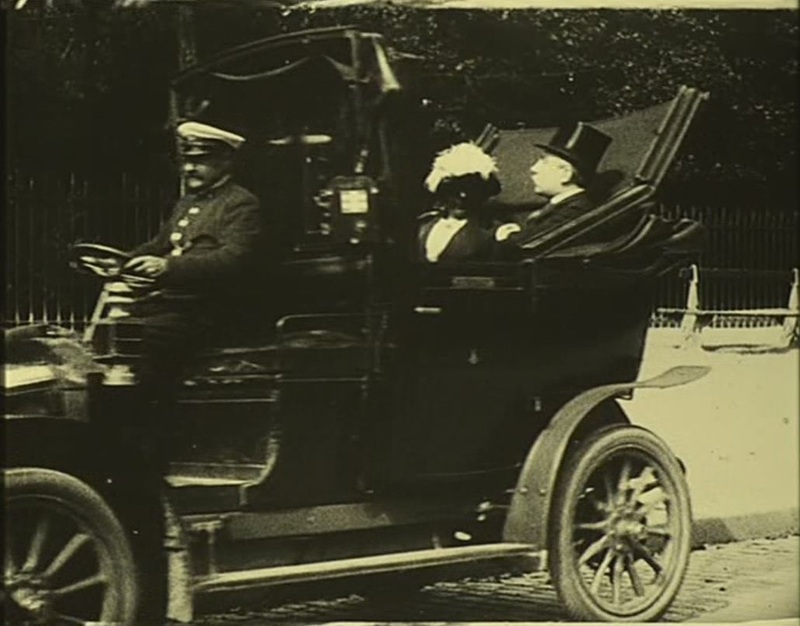 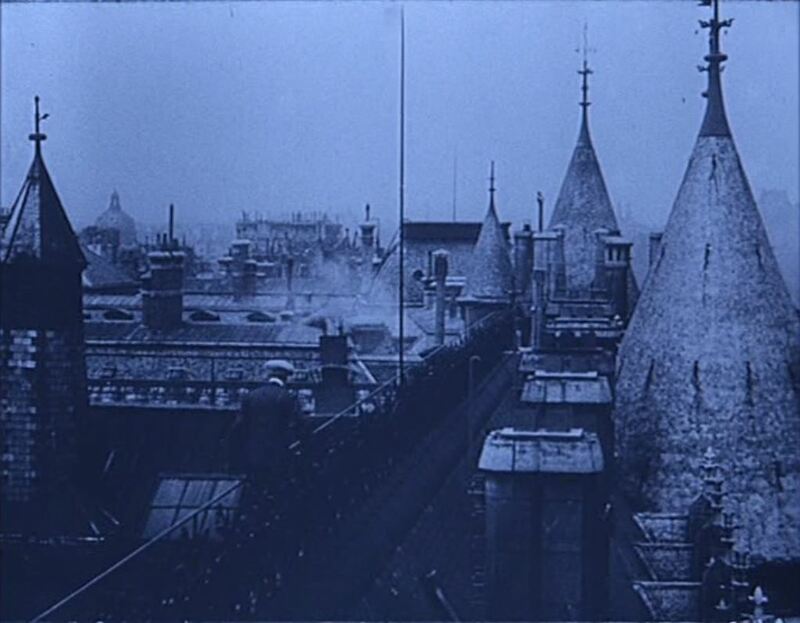 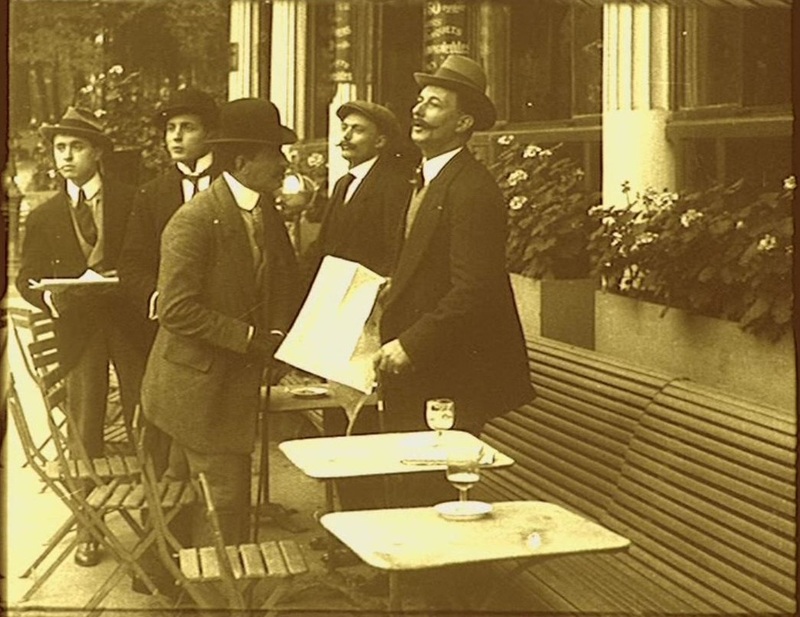 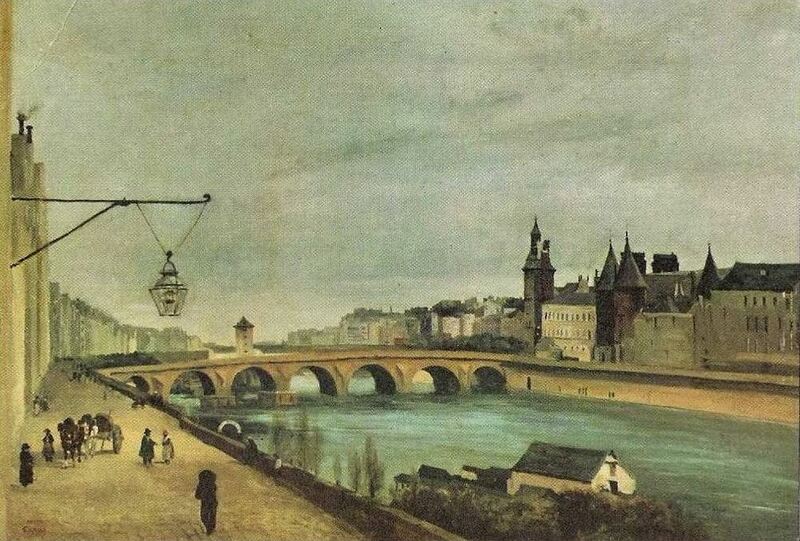 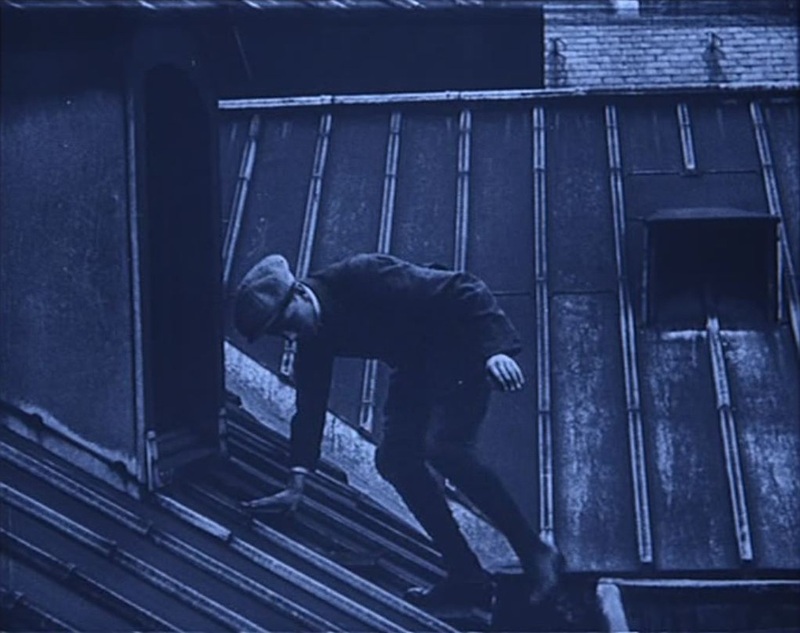 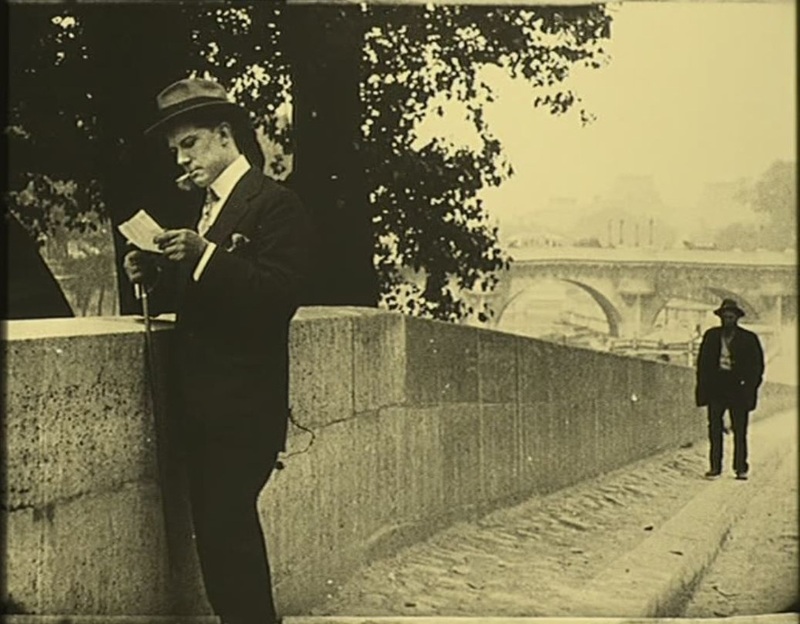 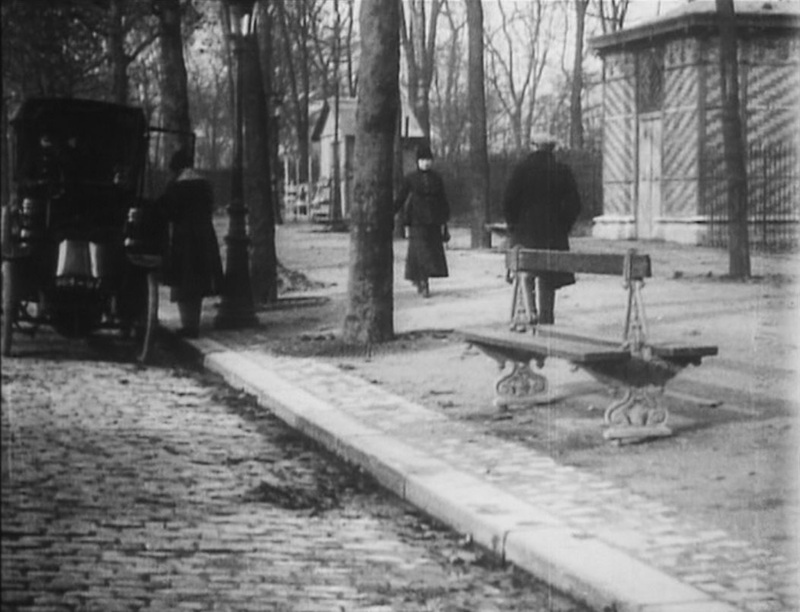 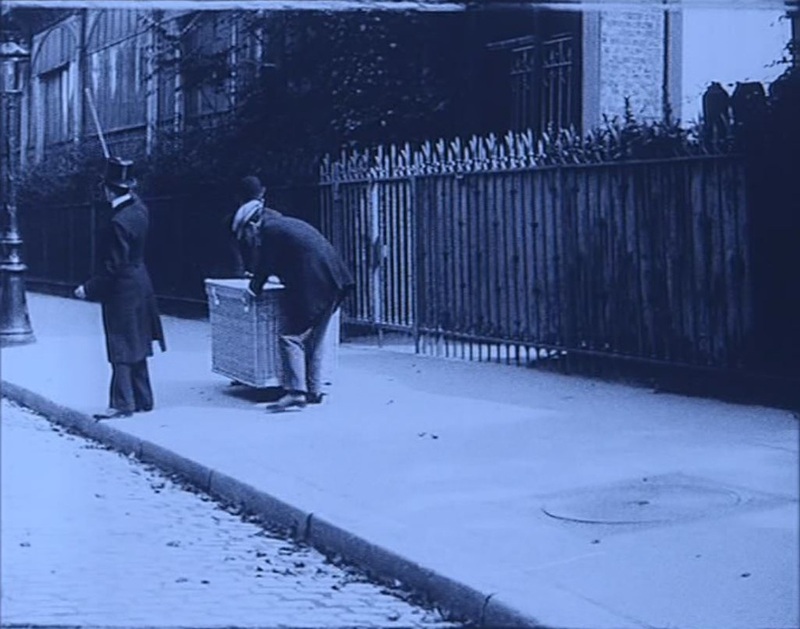 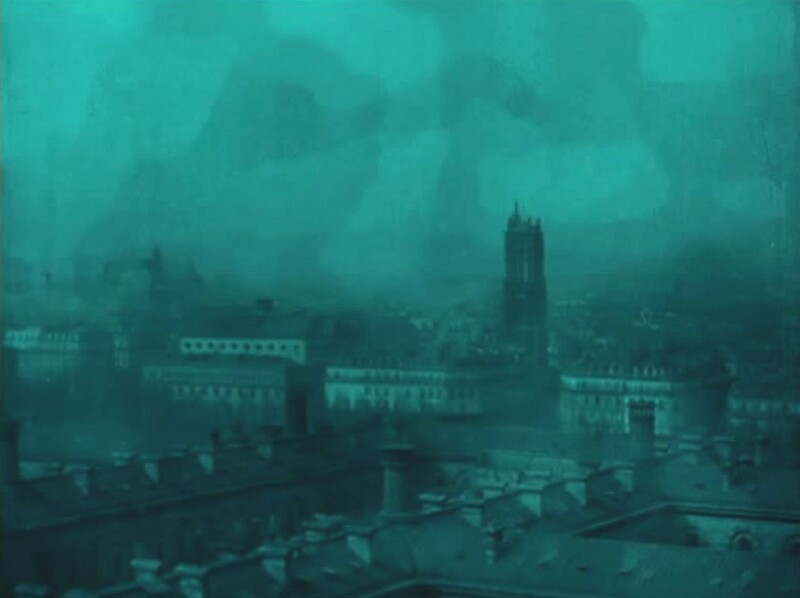 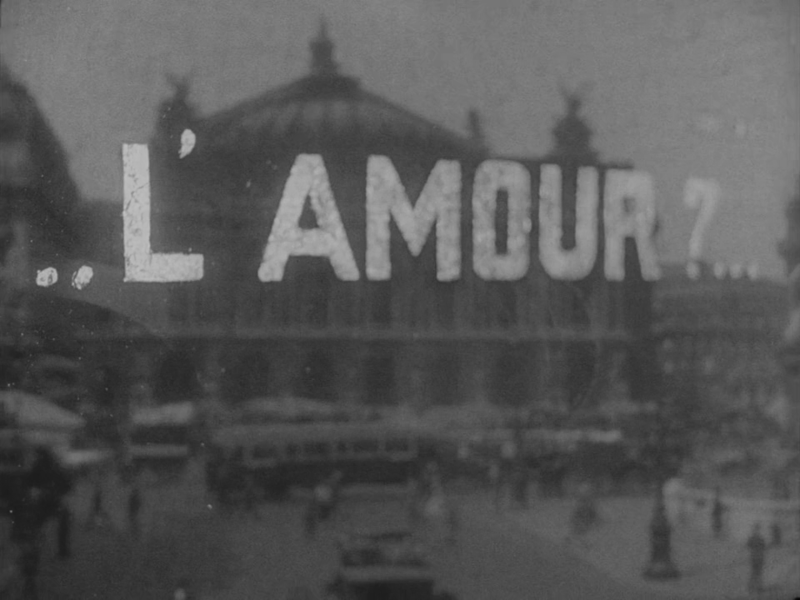 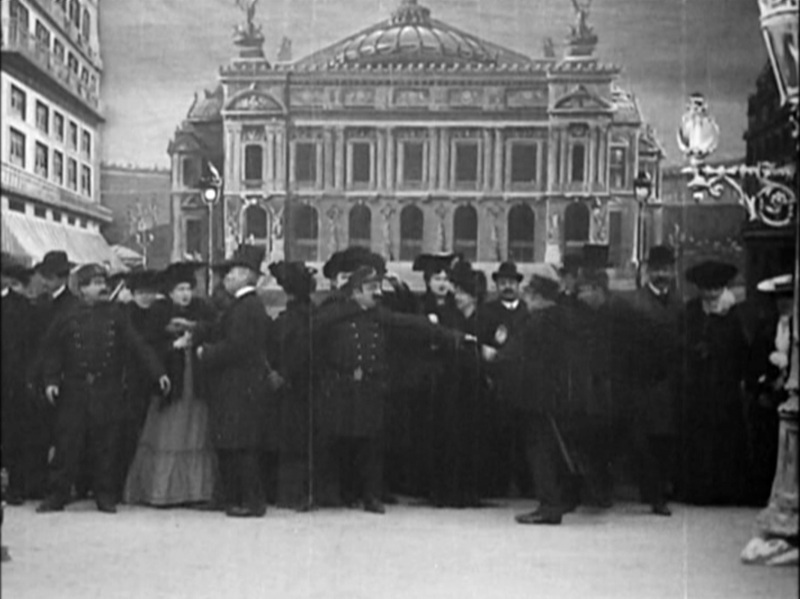 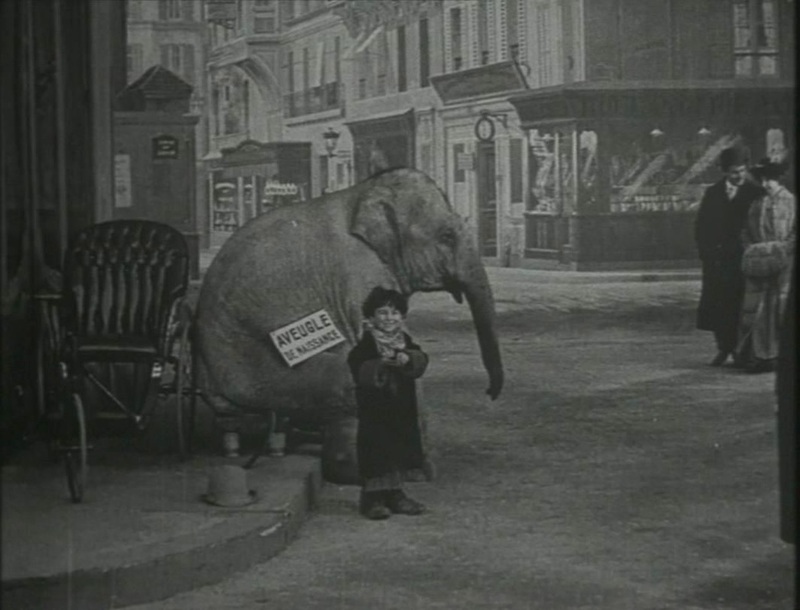 The scene is not derived from the novel, and stands as an emblematic non-place before the film embarks on its itinerary around Paris. 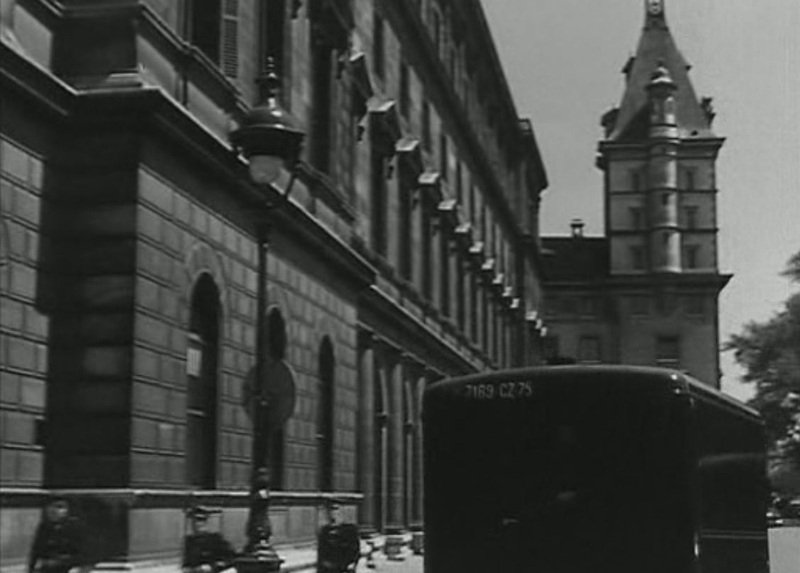 Five other places are shown solely as studio-constructed interiors, and three more have a brief exterior attached. 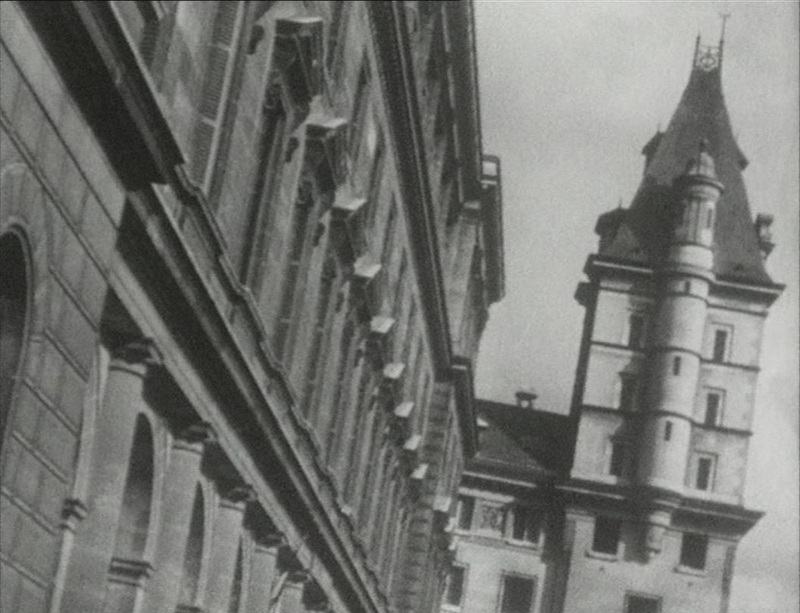 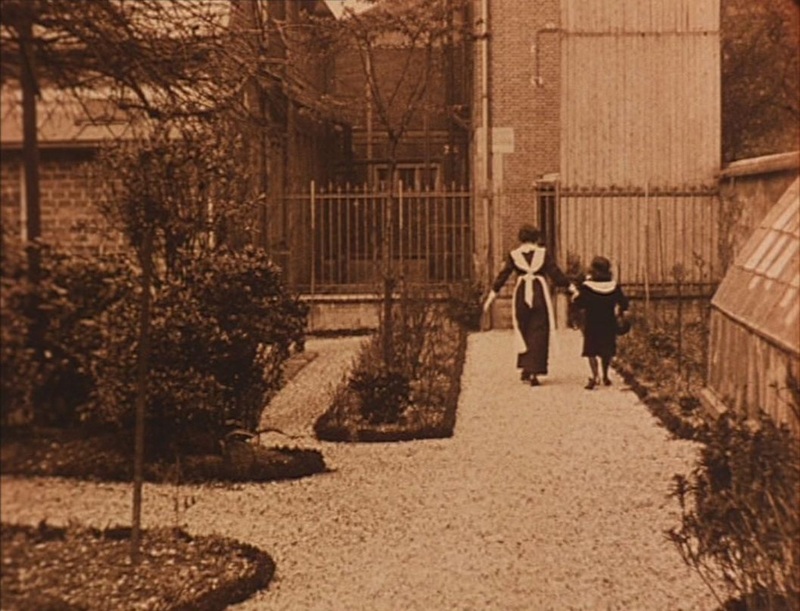 From the novel the film has suppressed not only the address of the convent (rue de la Glacière, 13e) but also the nuns' order (Augustinians), the convent's history since the Revolution, and a great deal of immediate plot business (including romance between Fandor and Elisabeth). 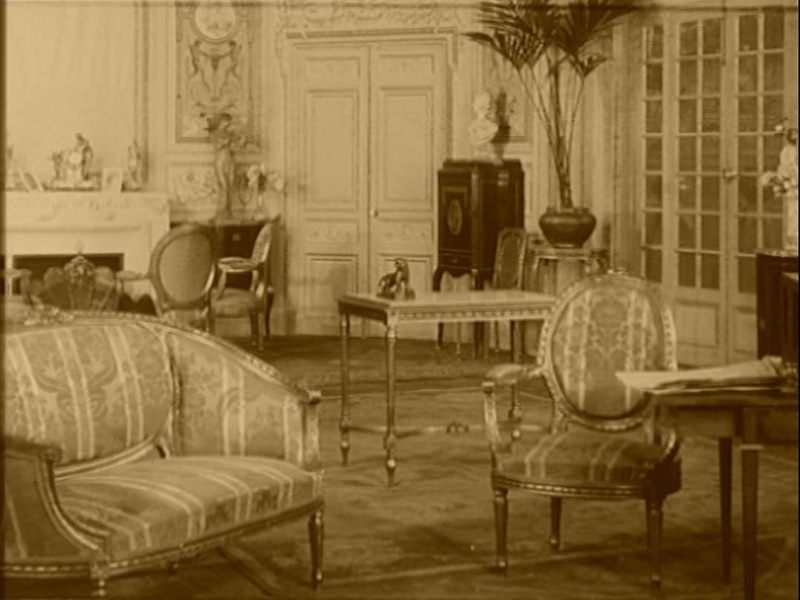 Whereas Juve's apartment remains unchanged across the three films in which it appears, Princesse Danidoff's hotel suite has had a make-over. 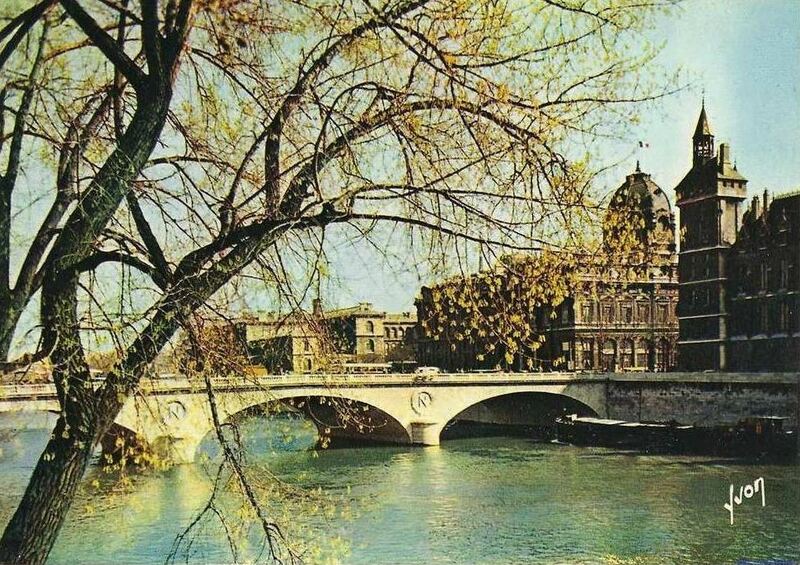 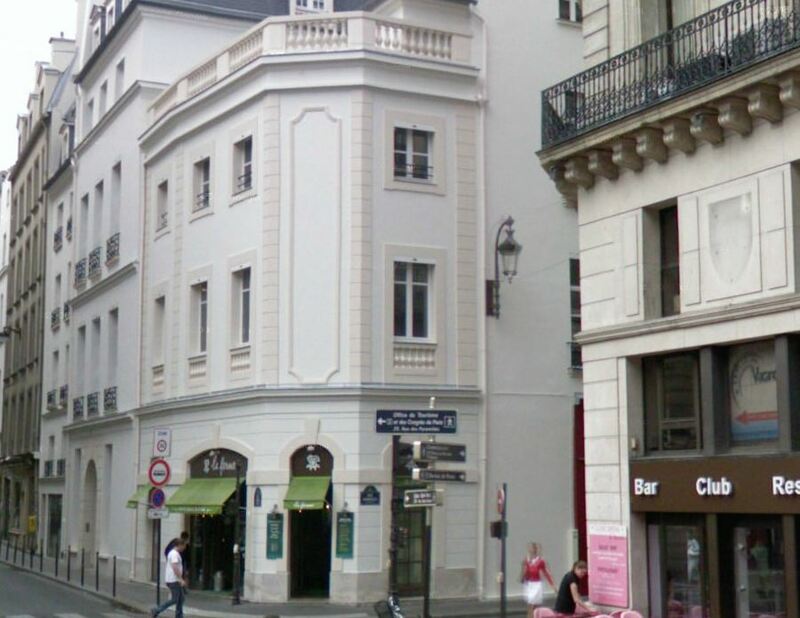 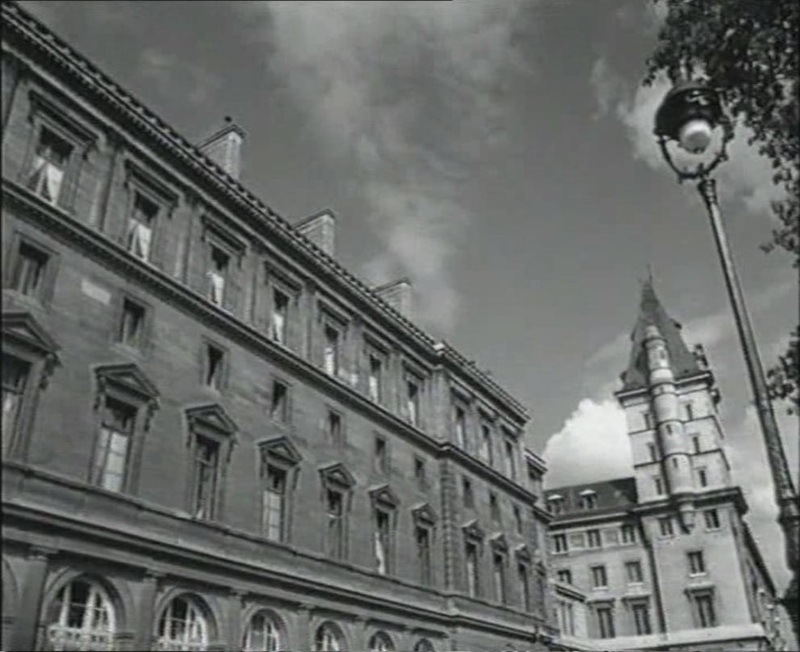 Perhaps she has changed residence, though according to the novel she is still at a hotel near l'Etoile rather than in an apartment of her own (she prefers the American way of living). 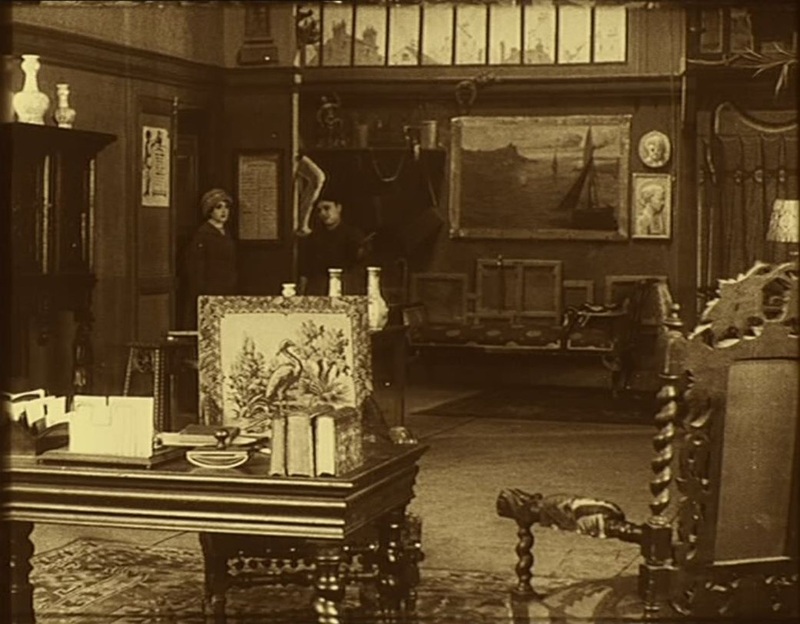 The film of Le Mort qui tue is uninterested in these details, and simply shows us the Princesse in a comfortable interior, address unspecified. 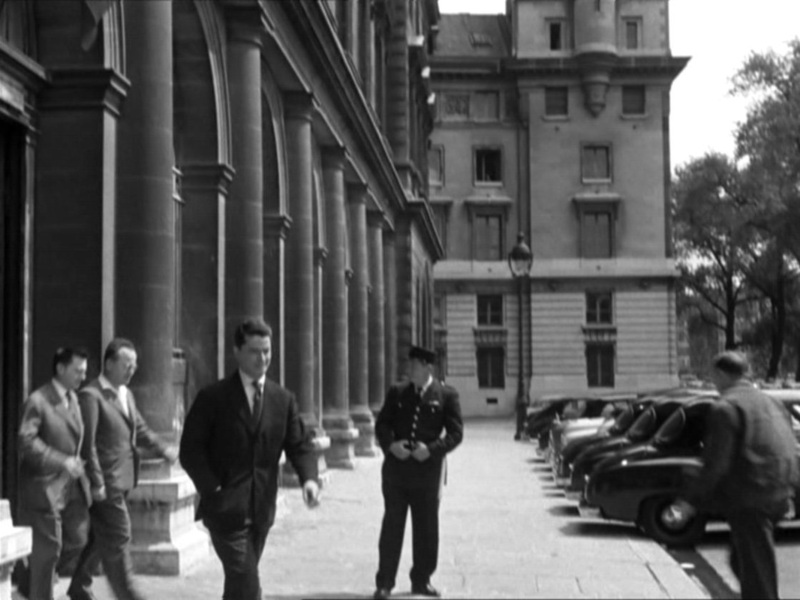 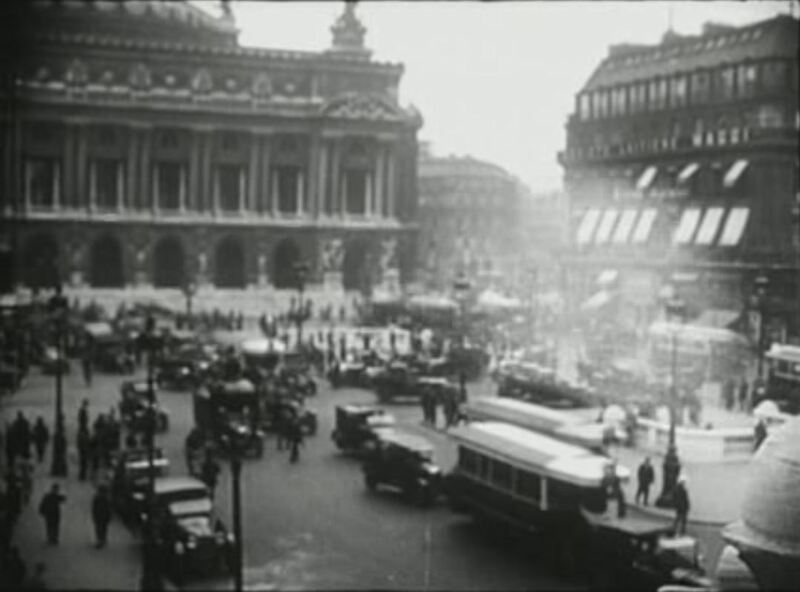 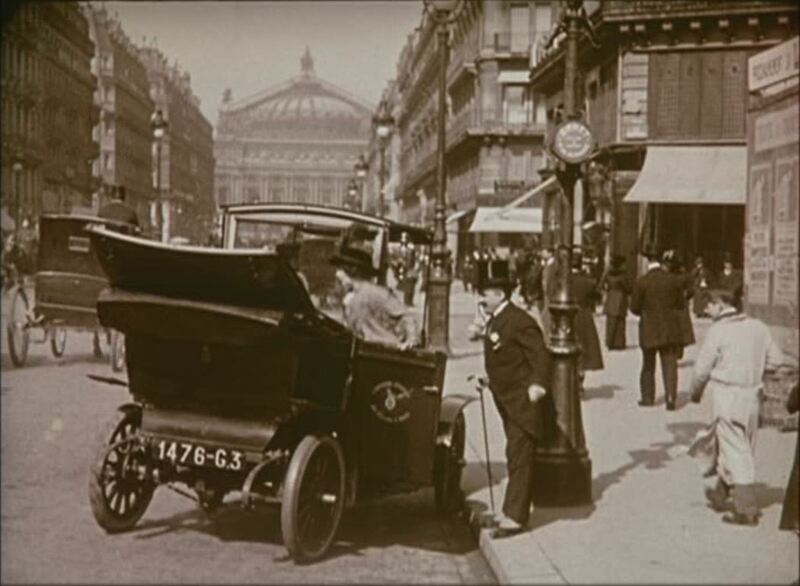 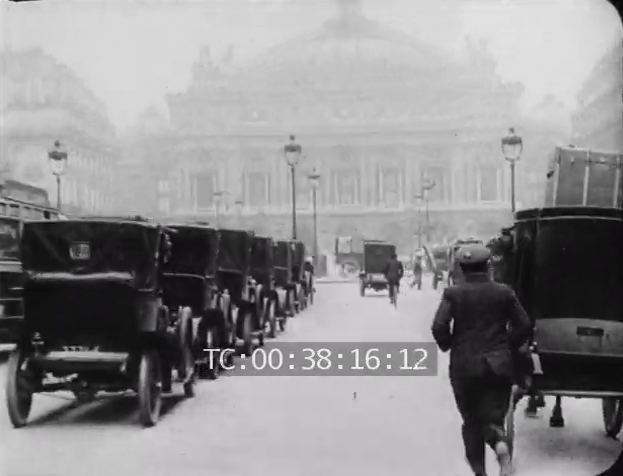 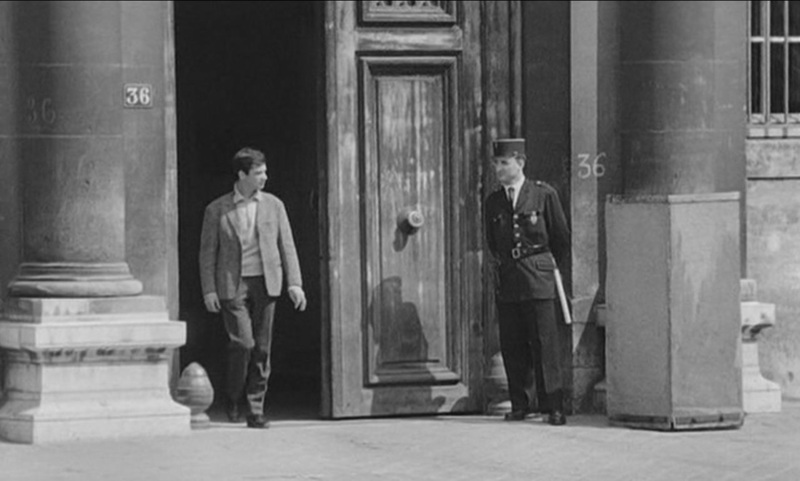 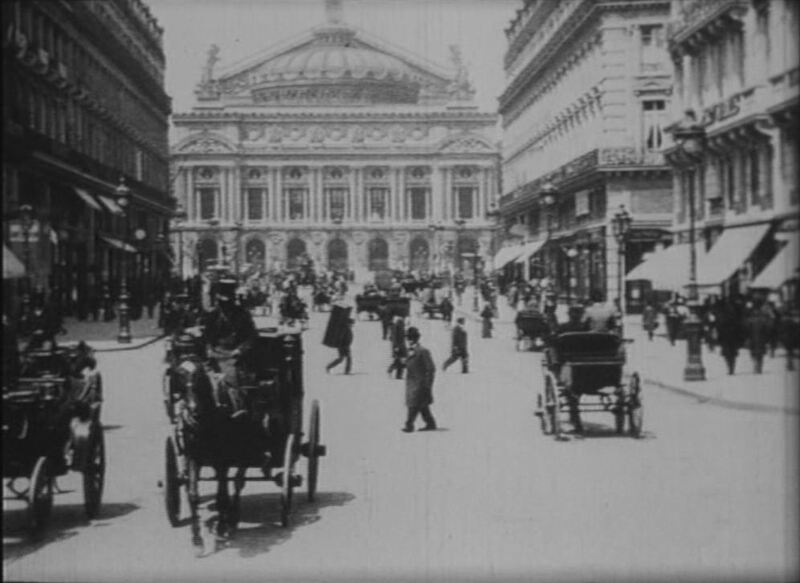 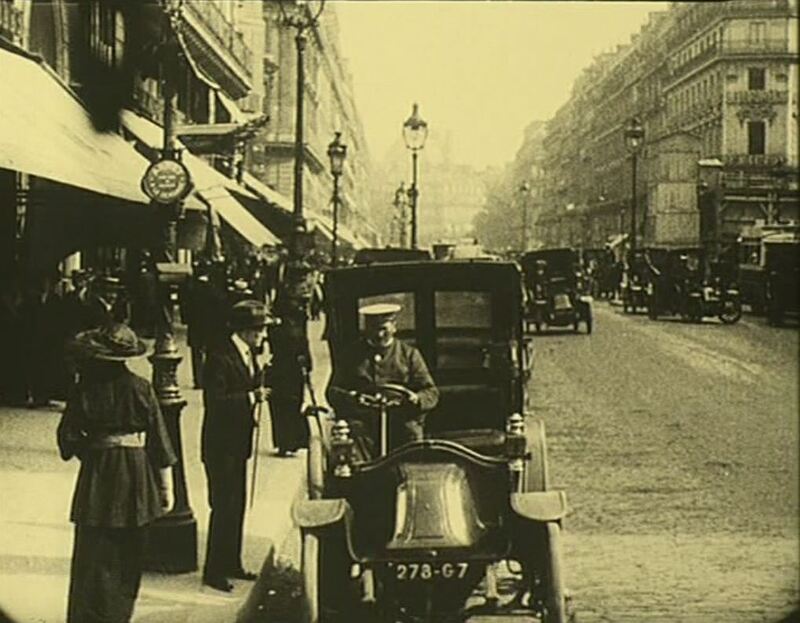 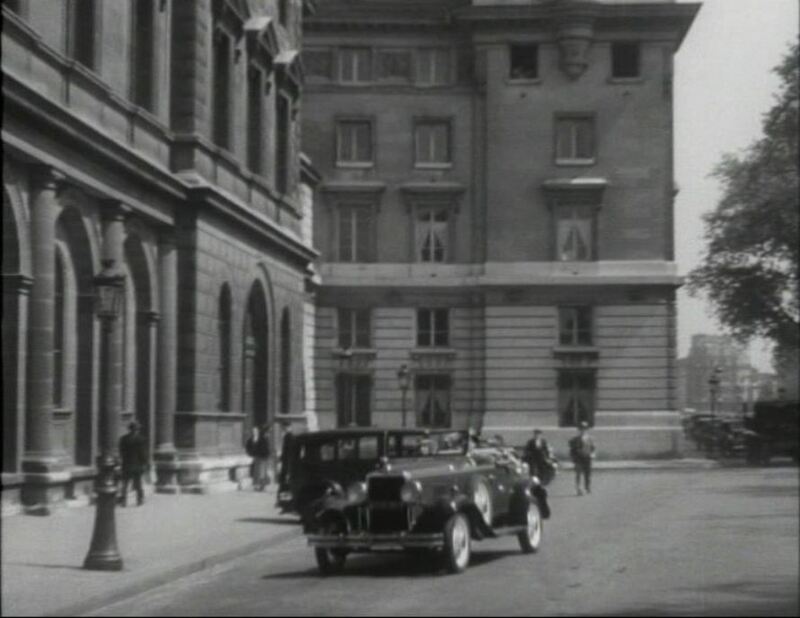 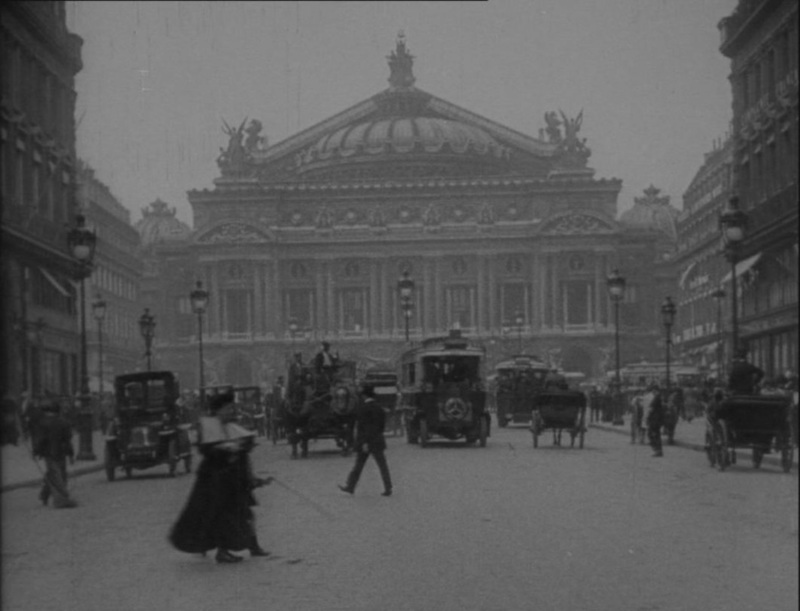 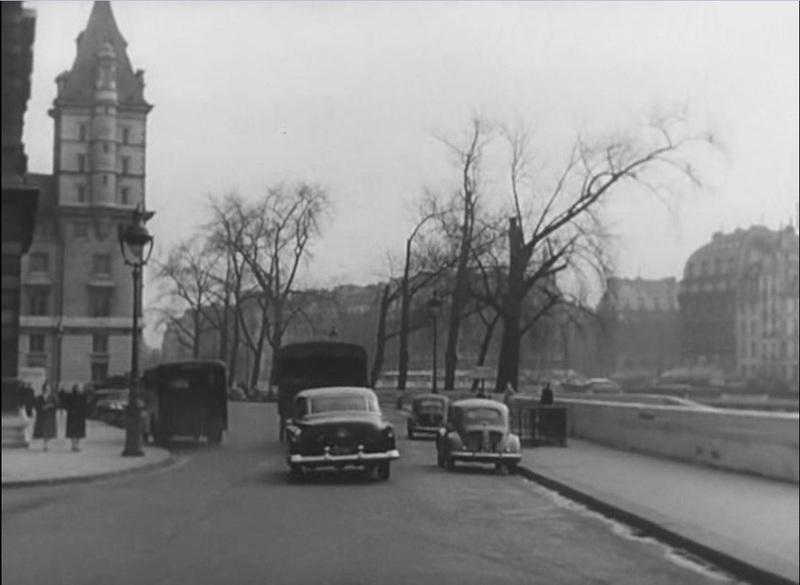 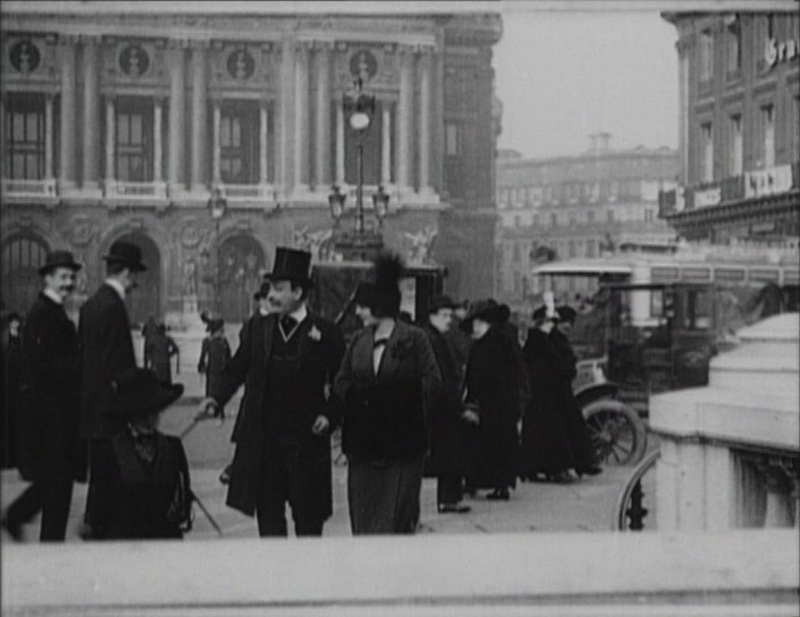 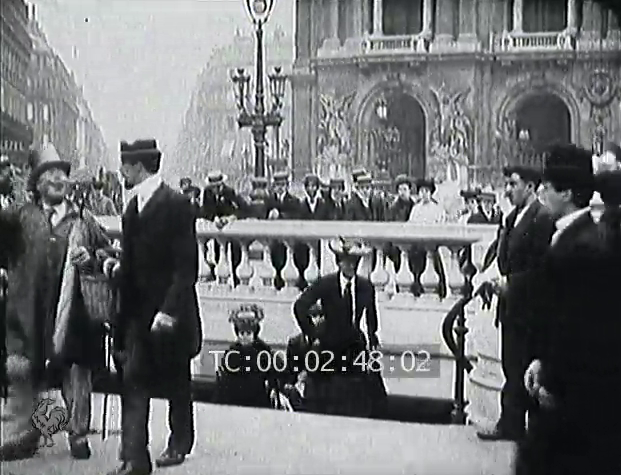 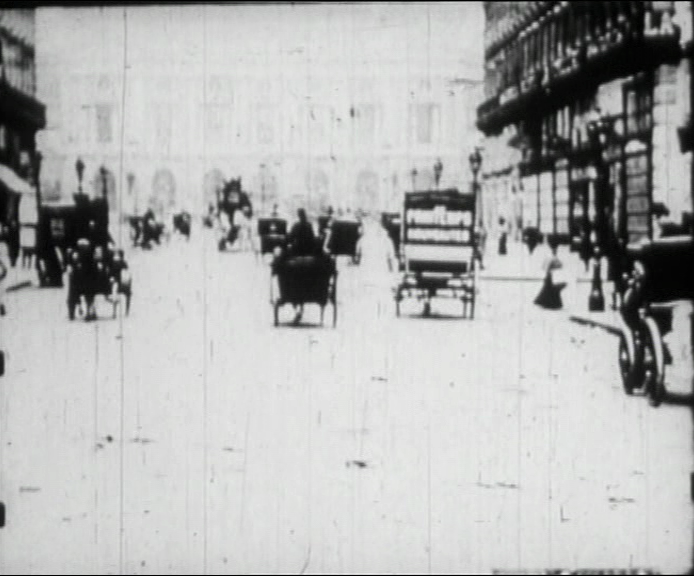 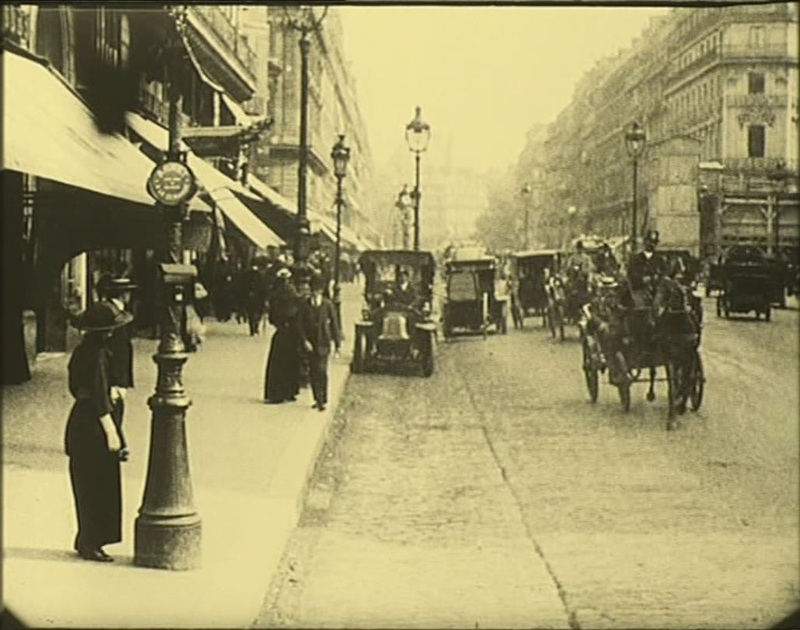 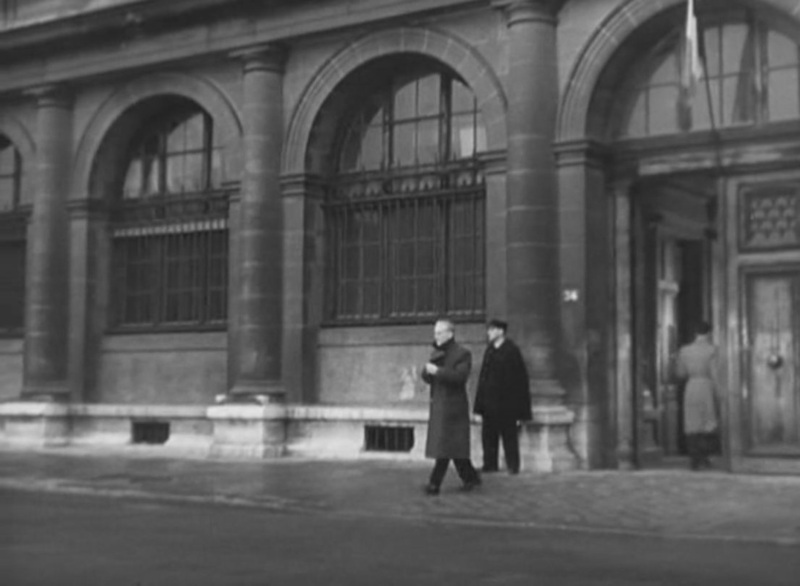 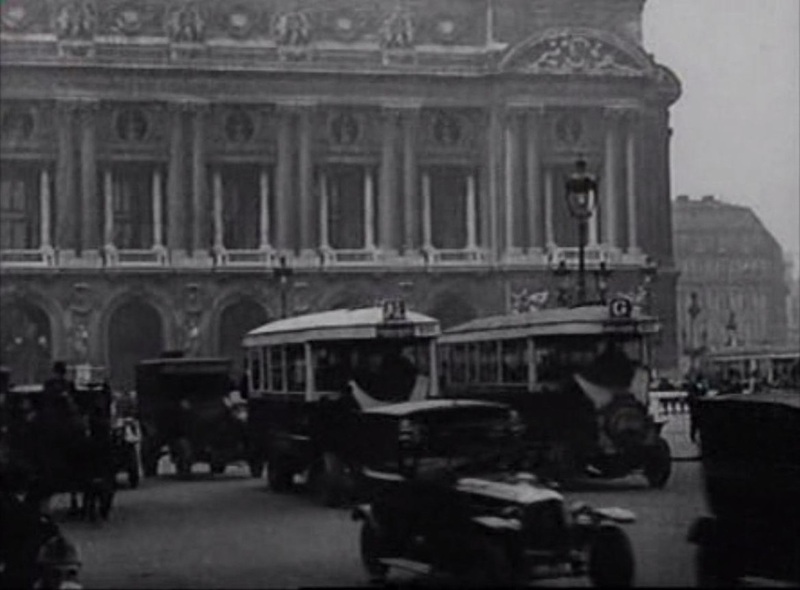 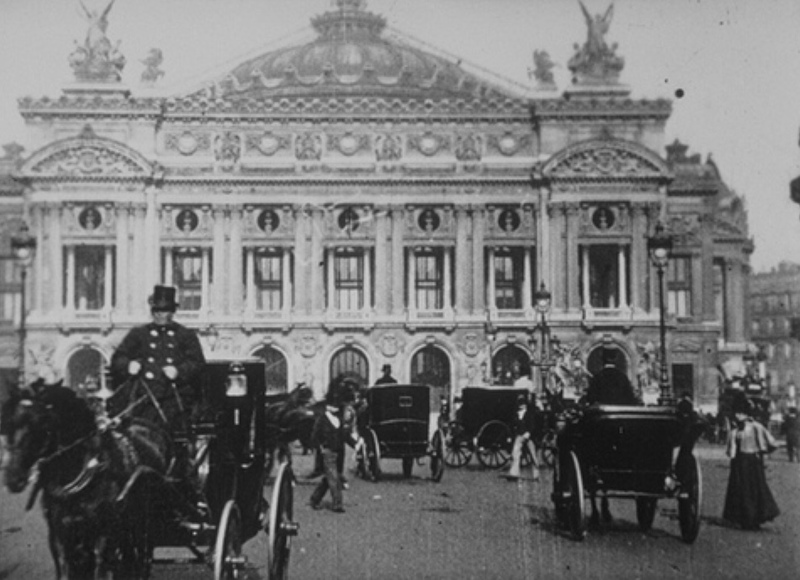 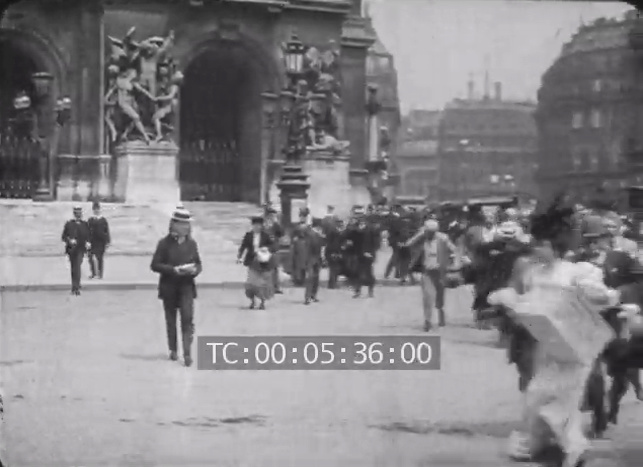 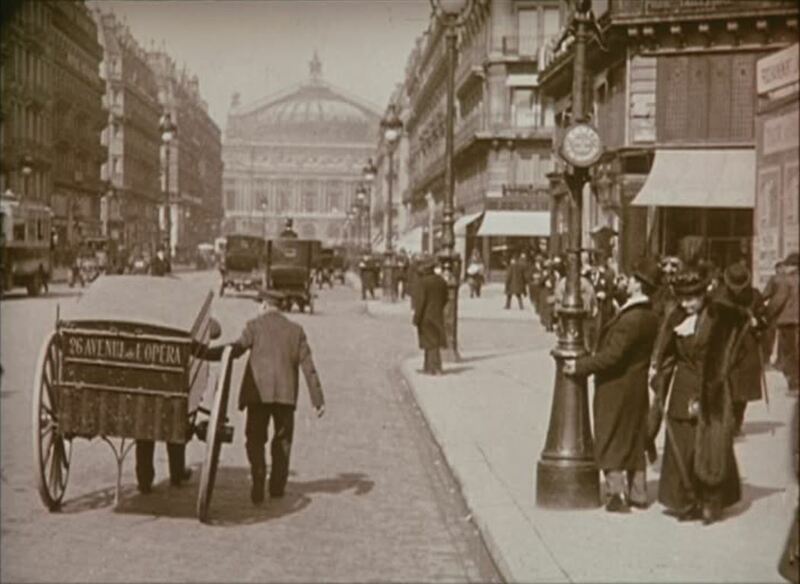 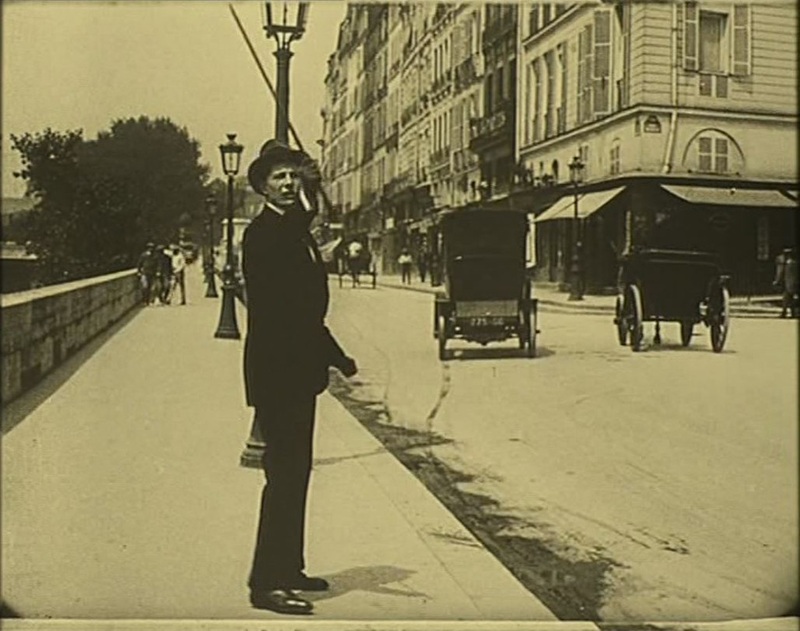 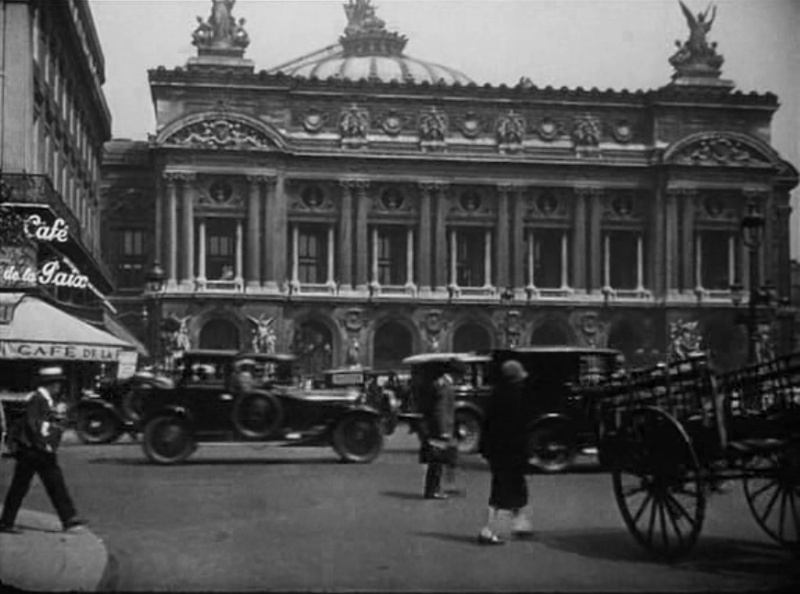 The second point of note in Feuillade's shot of the avenue de l'Opéra is that, to film a man taking a taxi after leaving his office, all Feuillade and crew had to do was to leave the Gaumont offices at 57 rue Saint Roch and walk across the street. 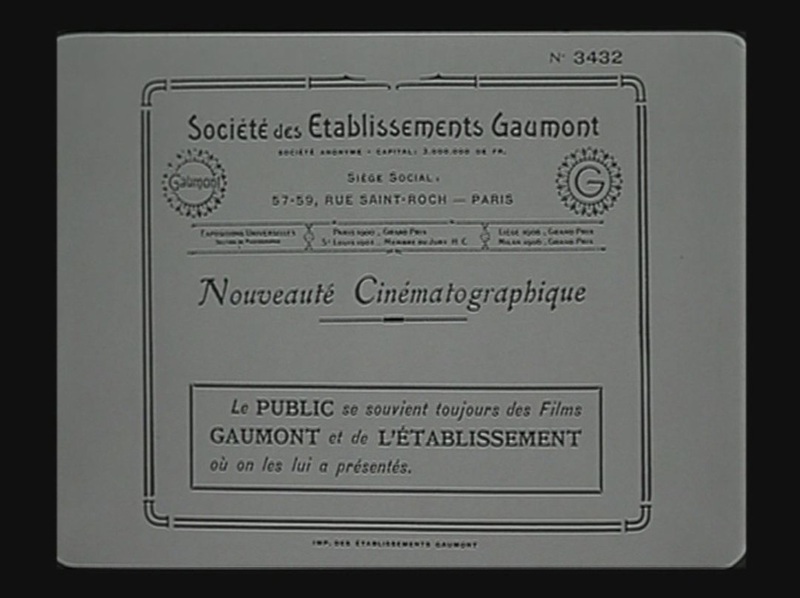 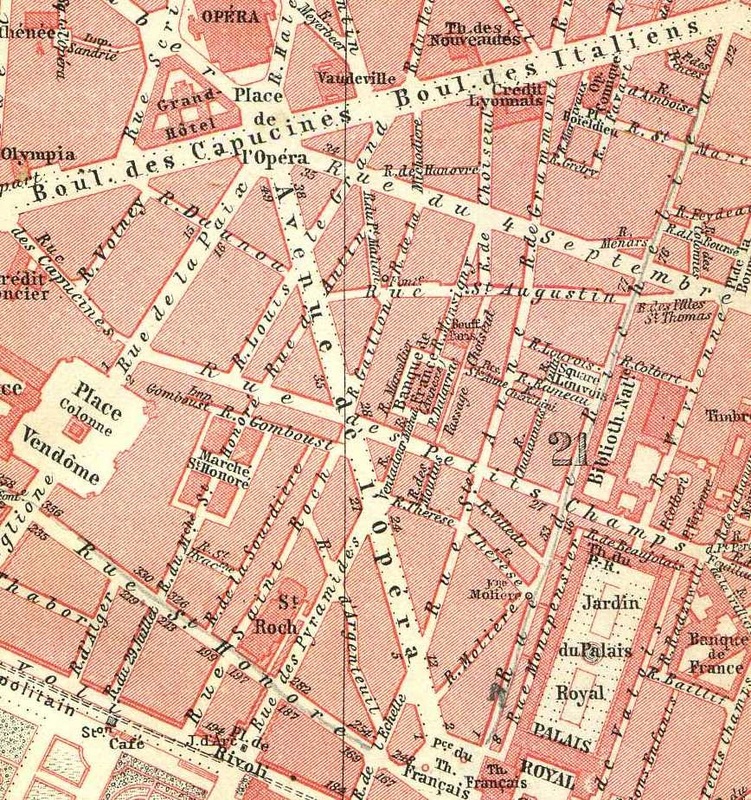 At least four places connected to Feuillade and Gaumont serve as locations in the Fantômas films. 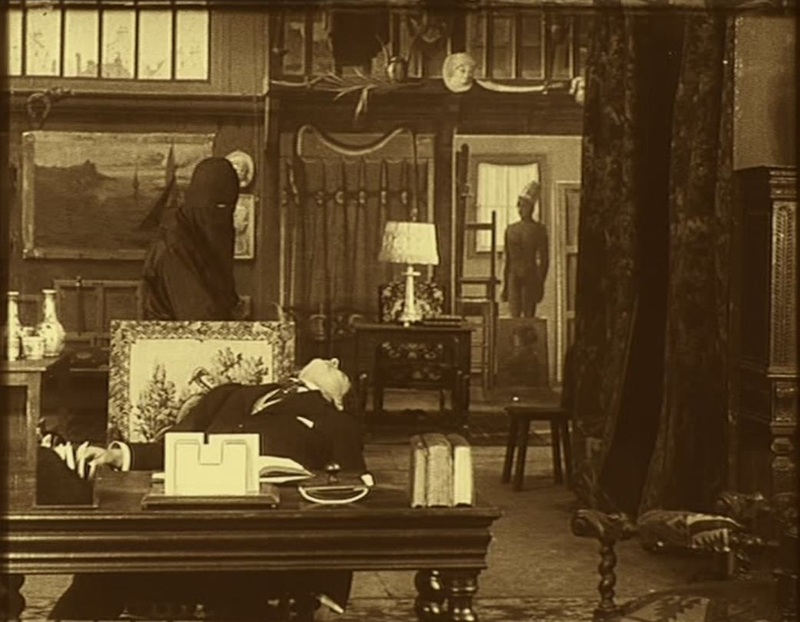 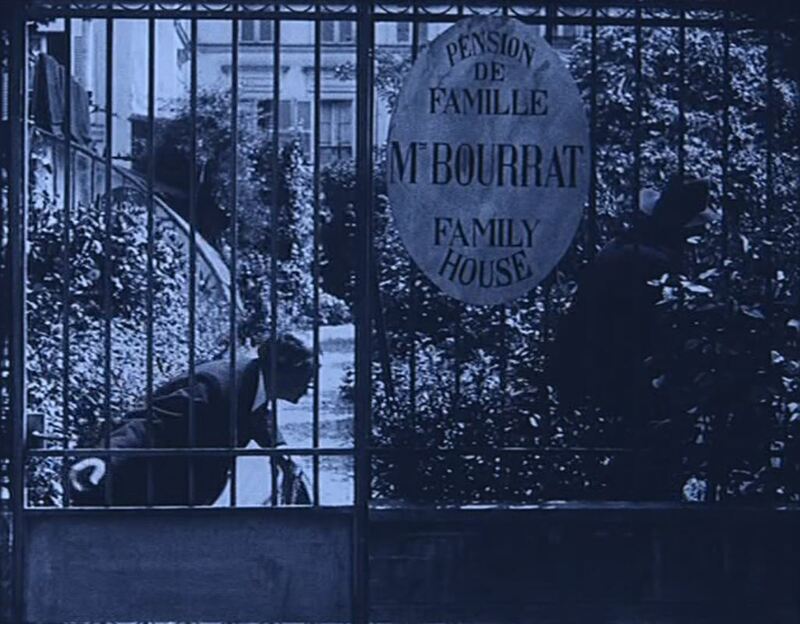 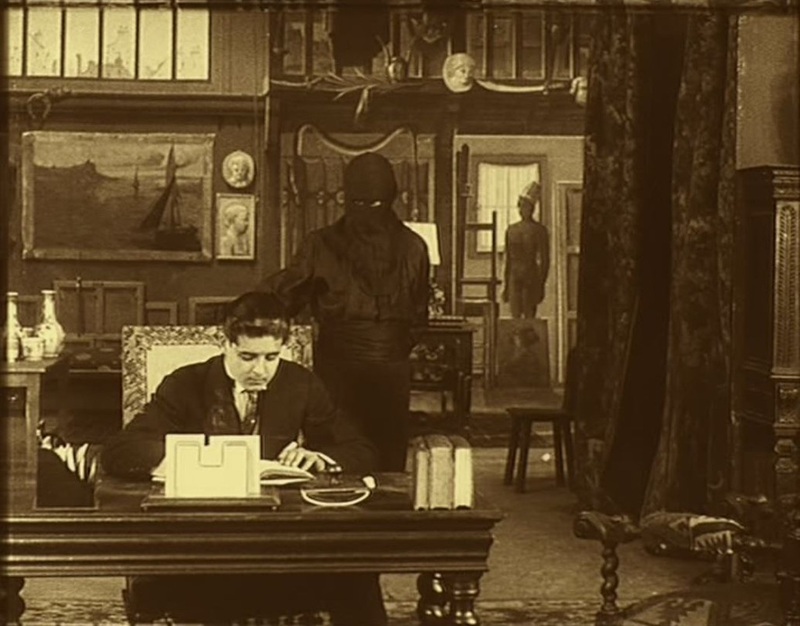 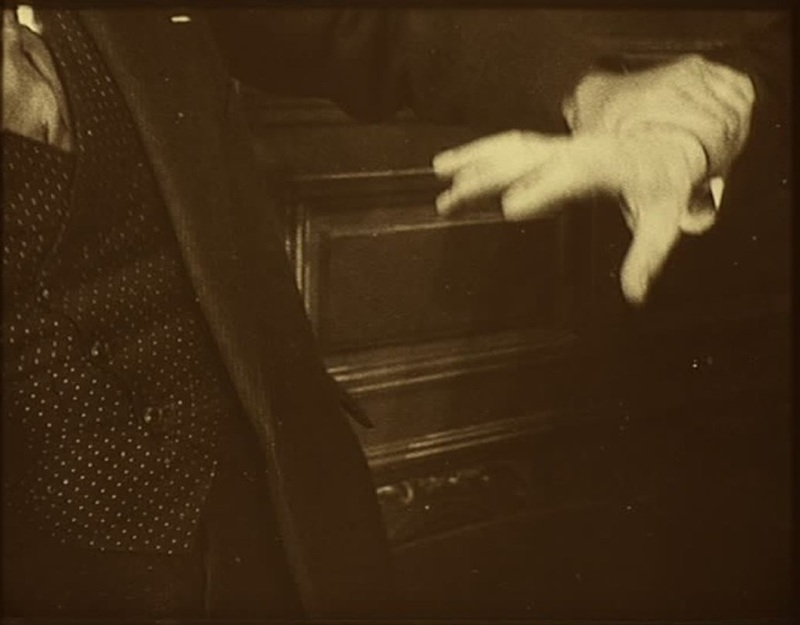 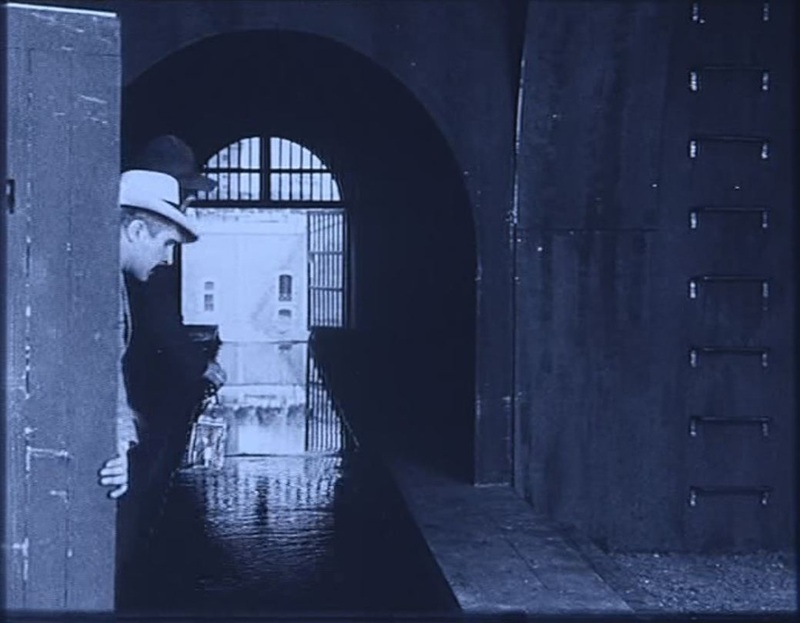 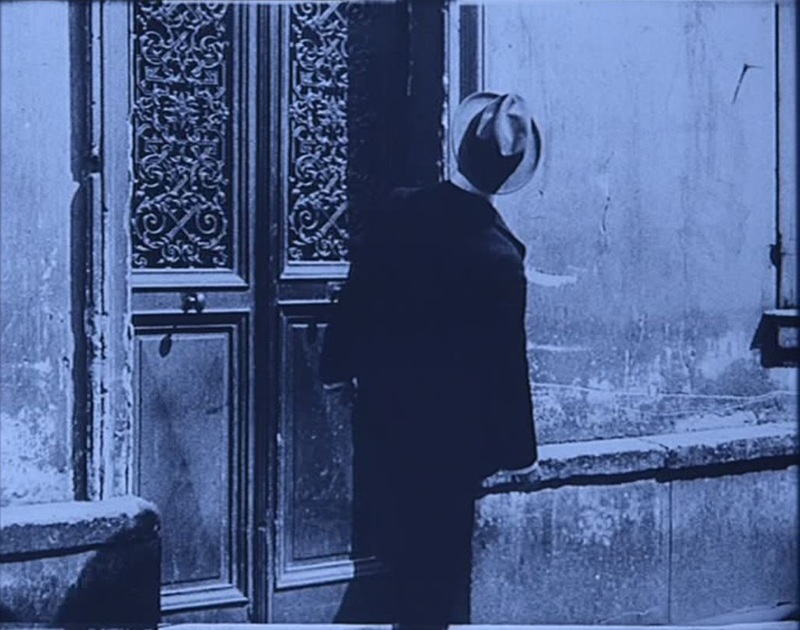 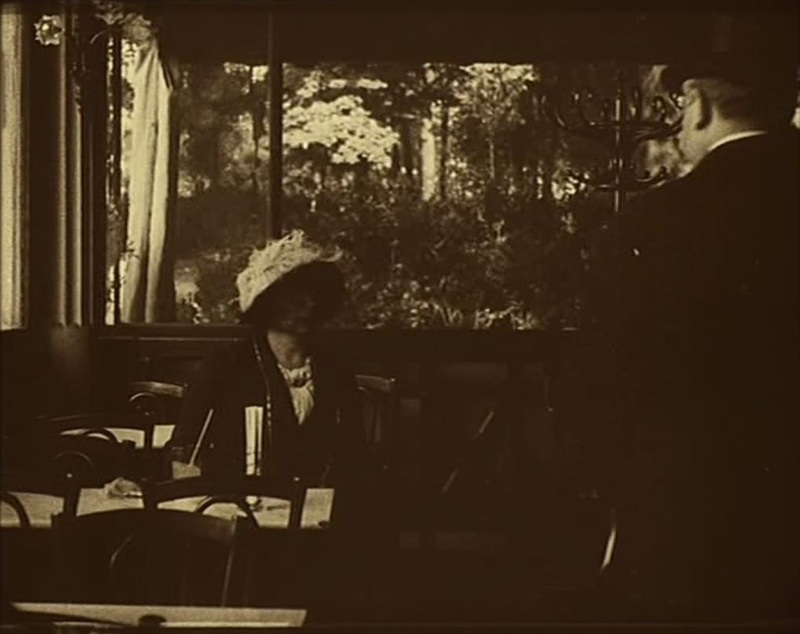 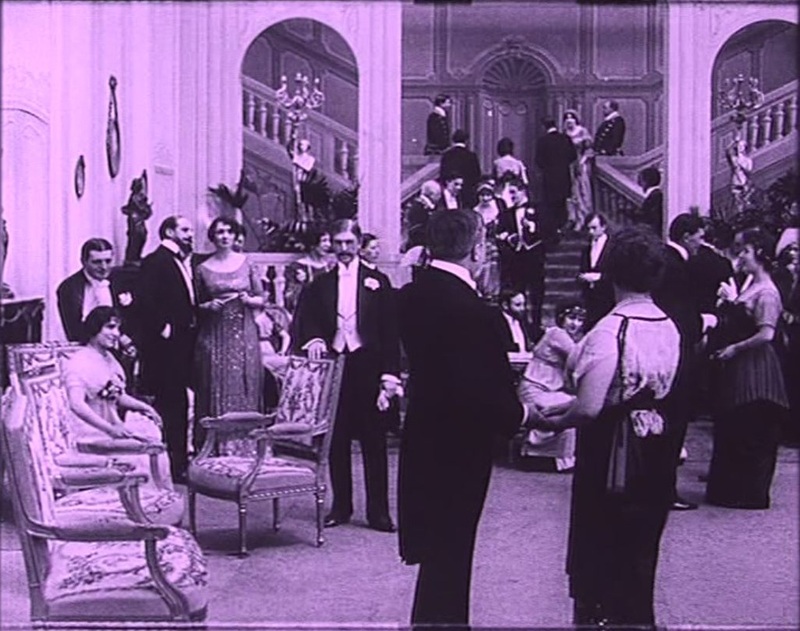 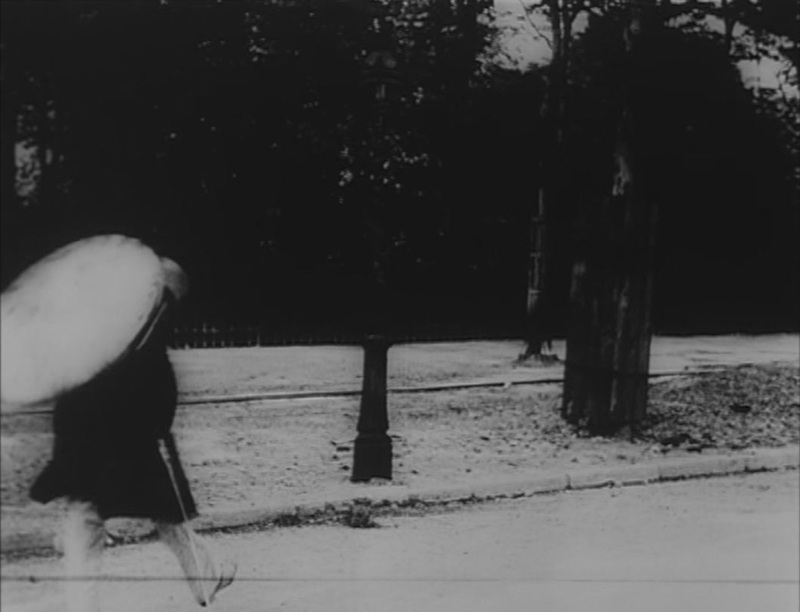 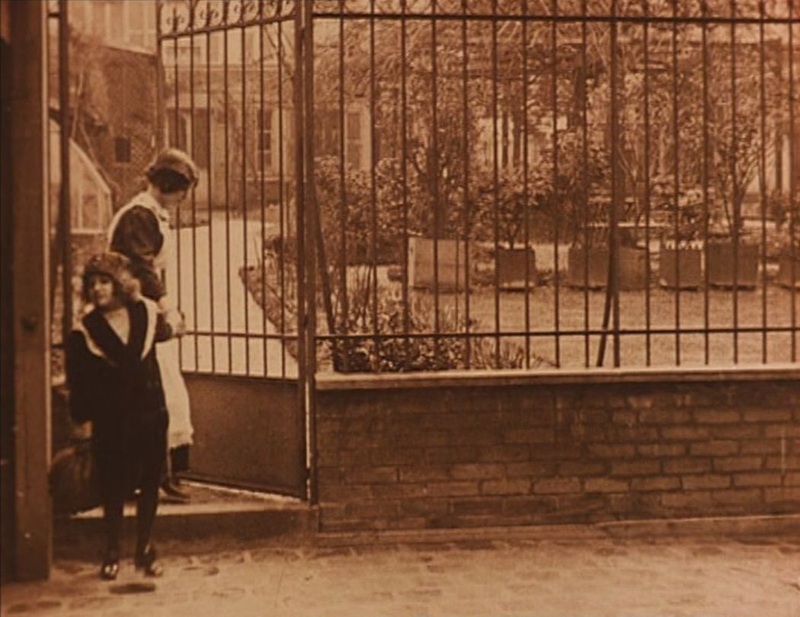 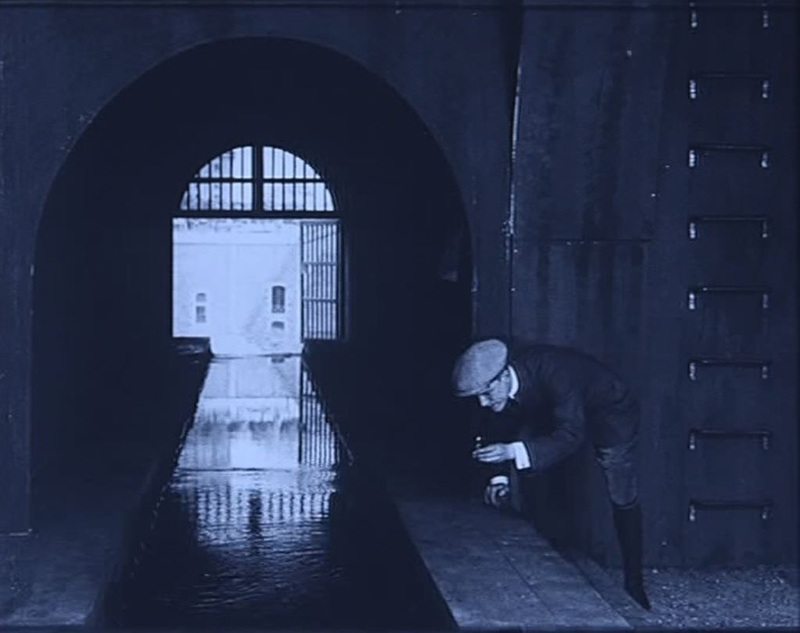 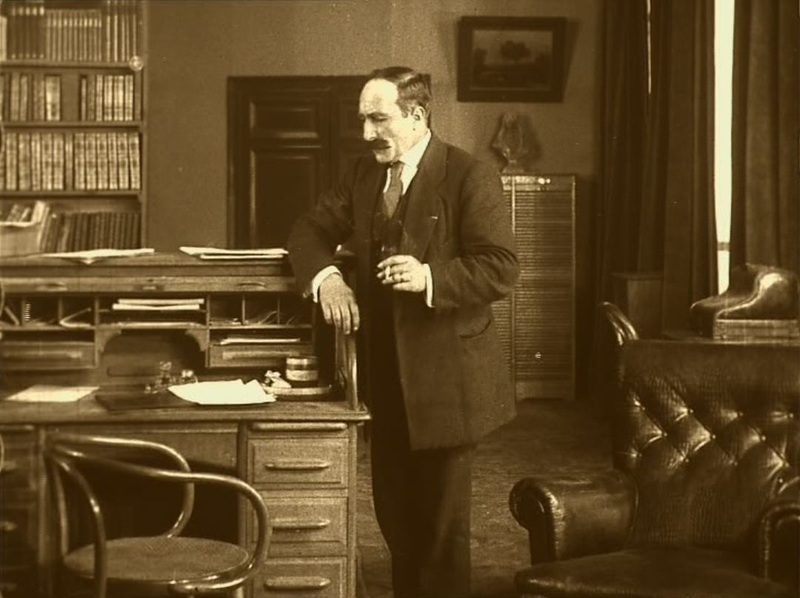 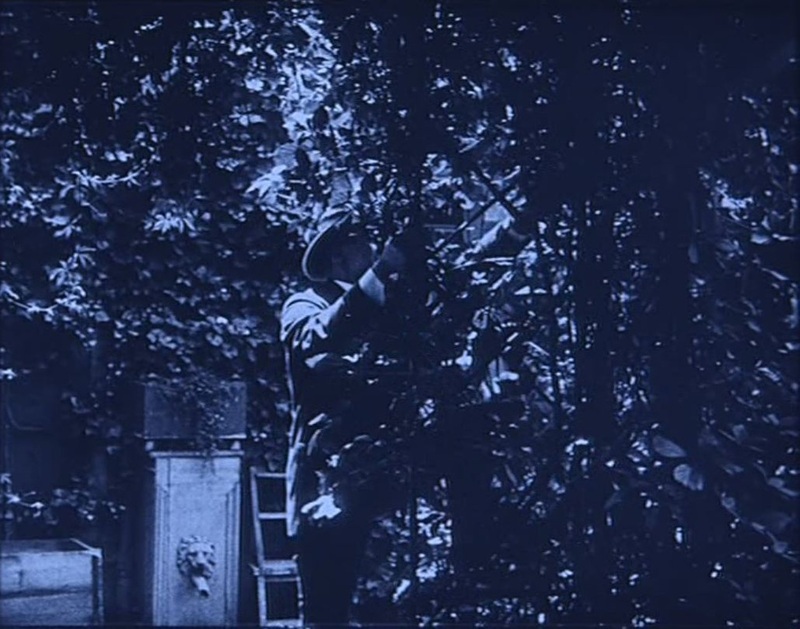 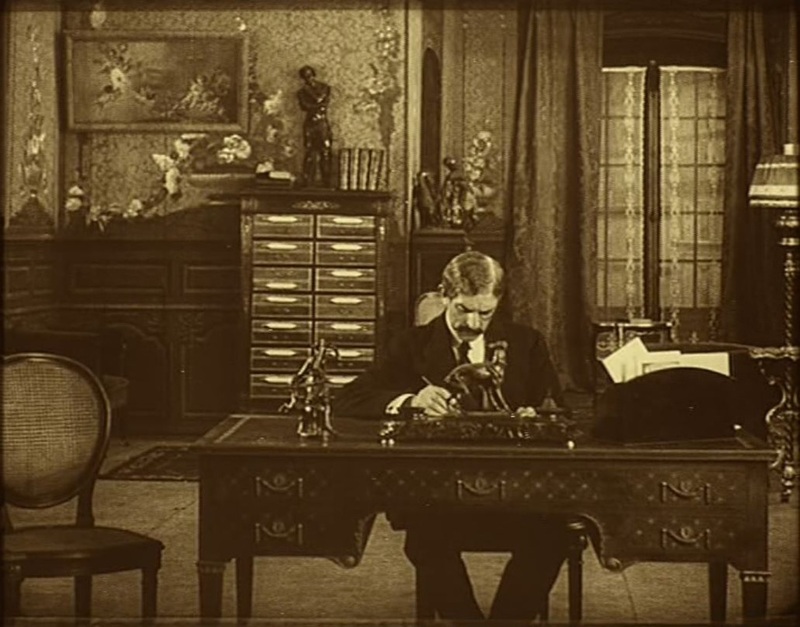 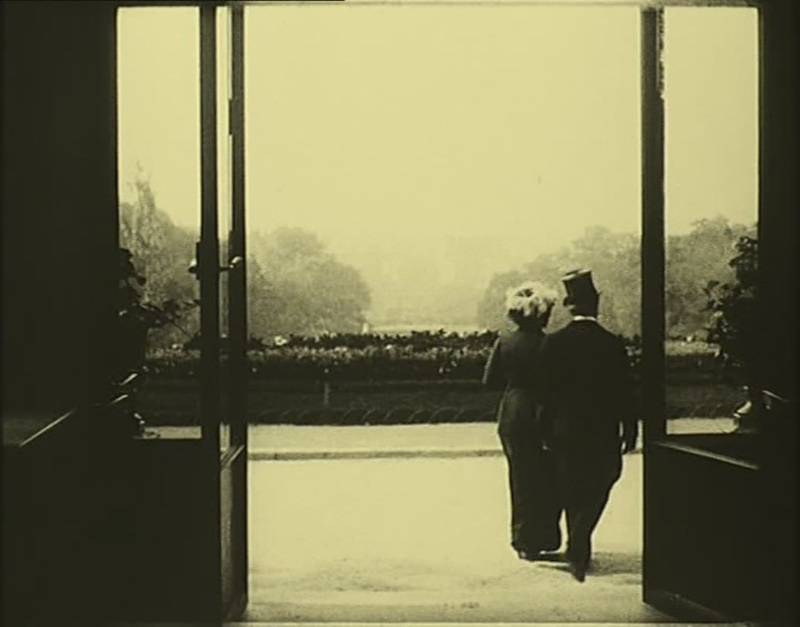 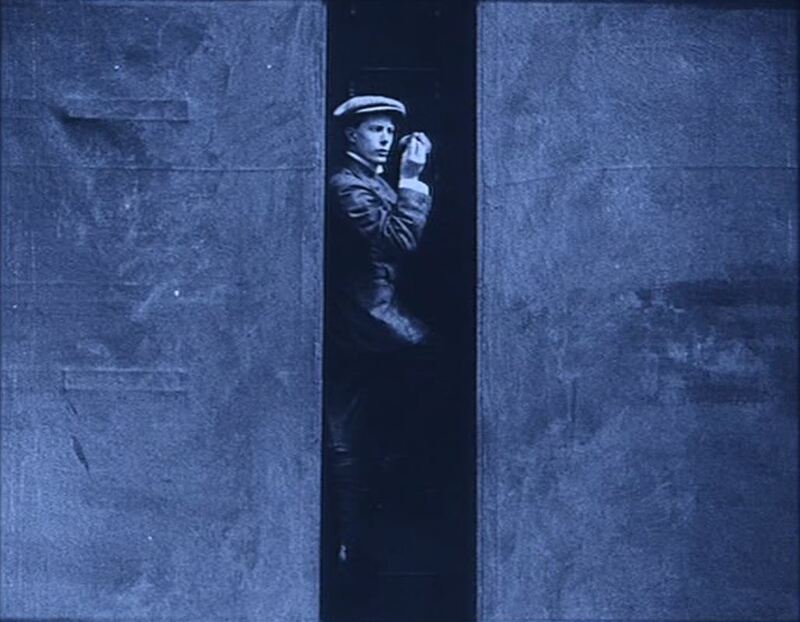 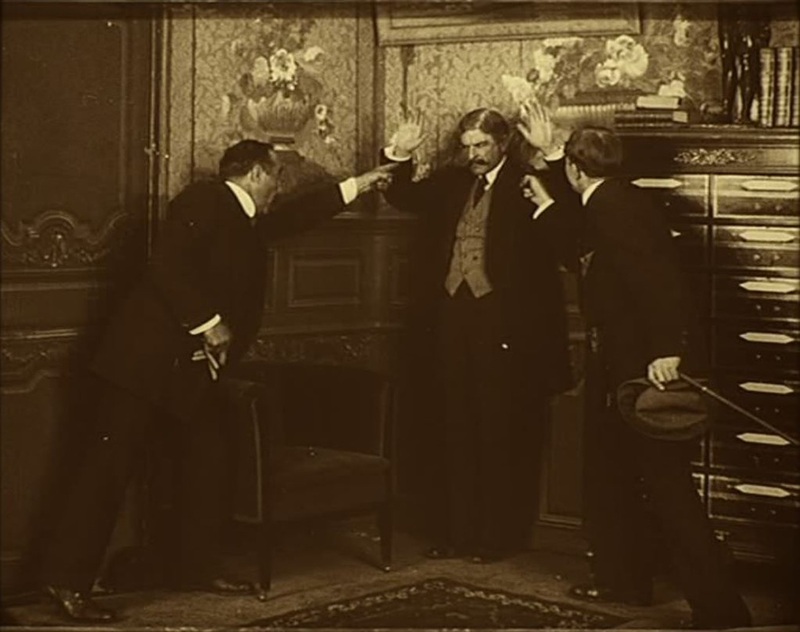 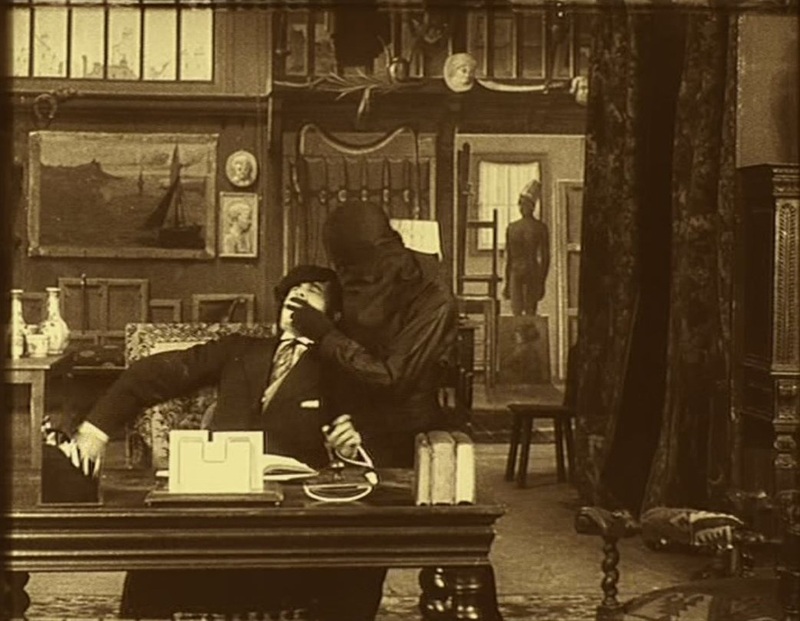 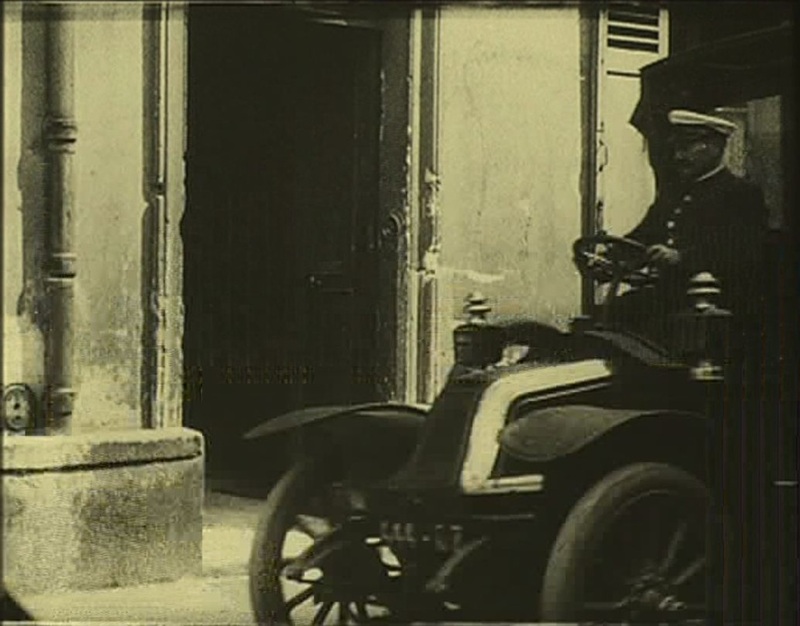 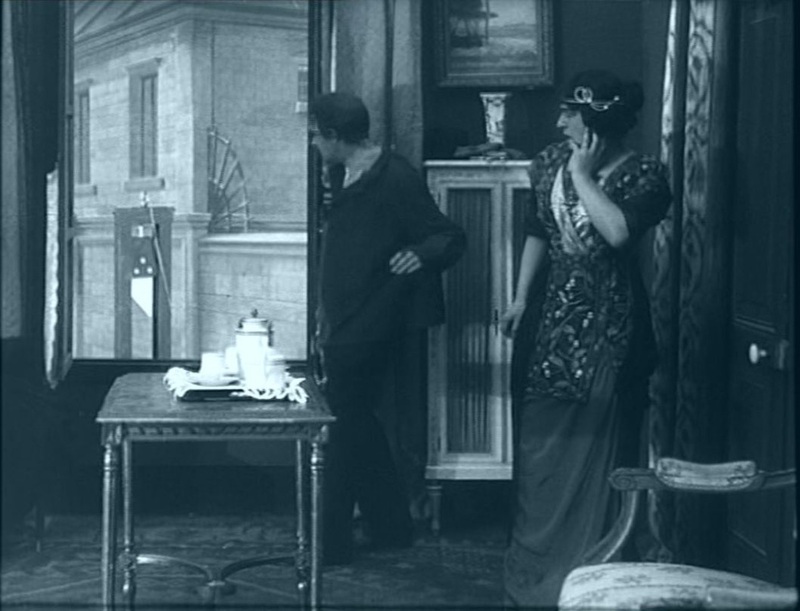 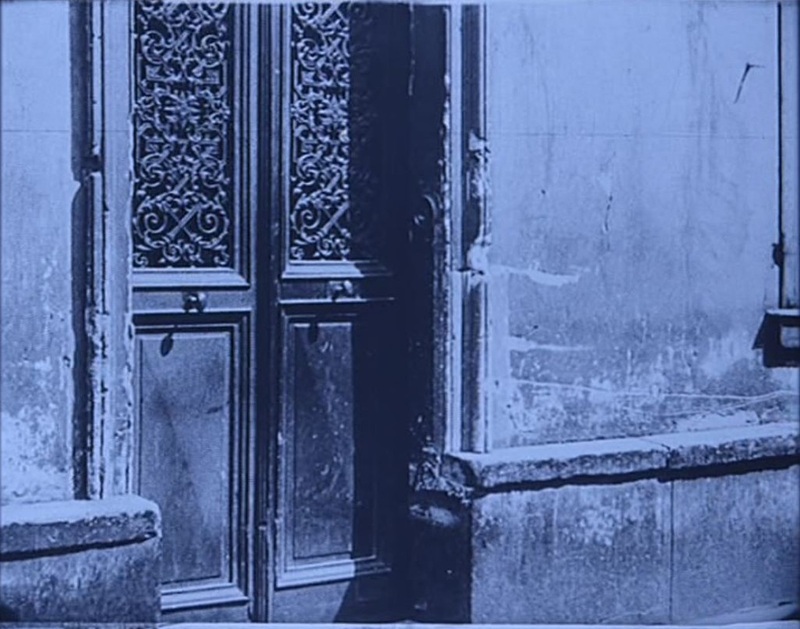 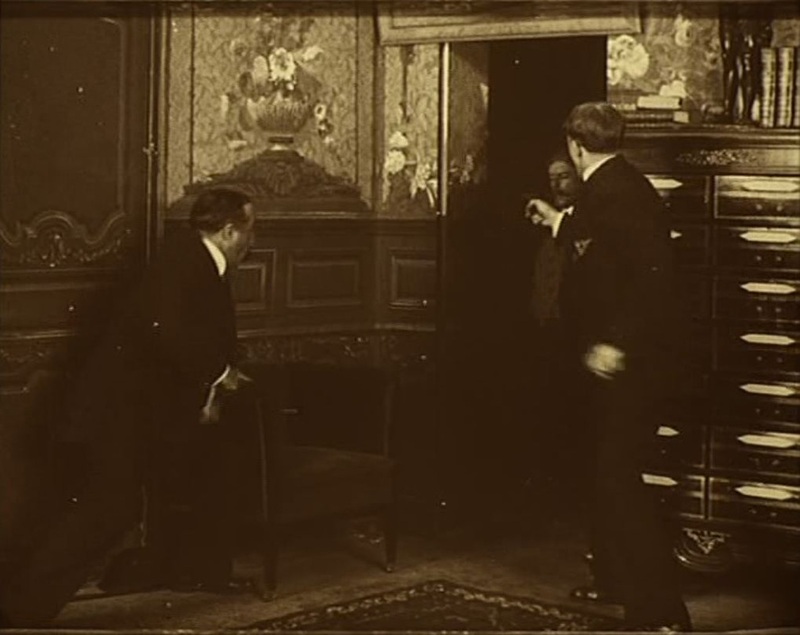 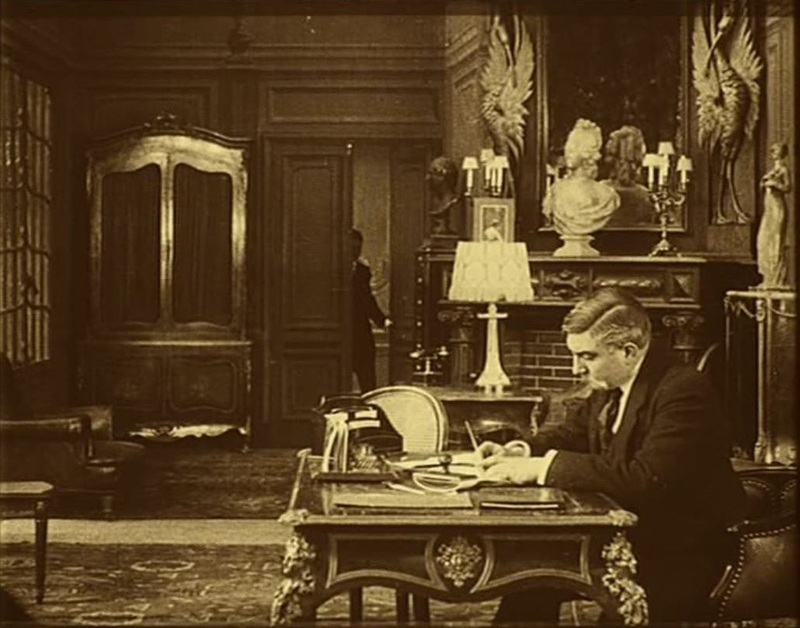 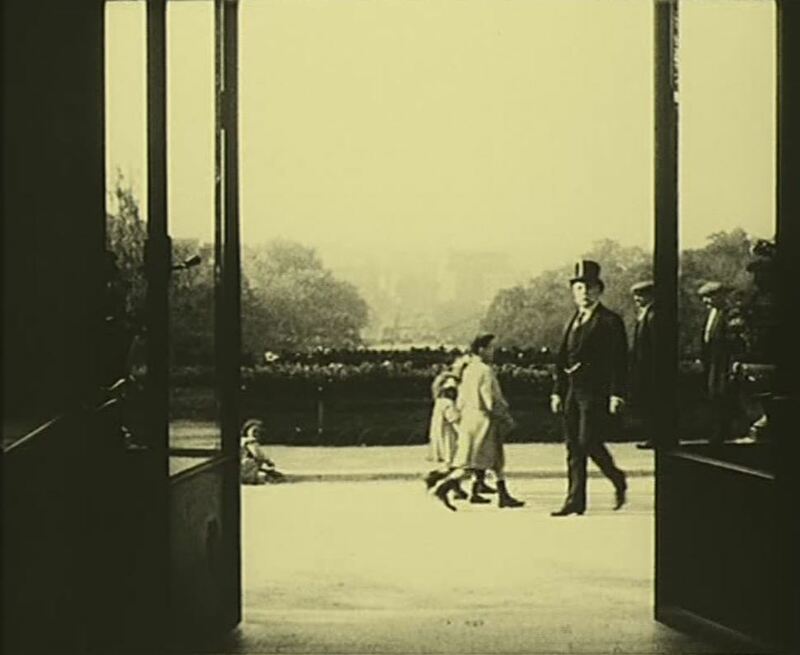 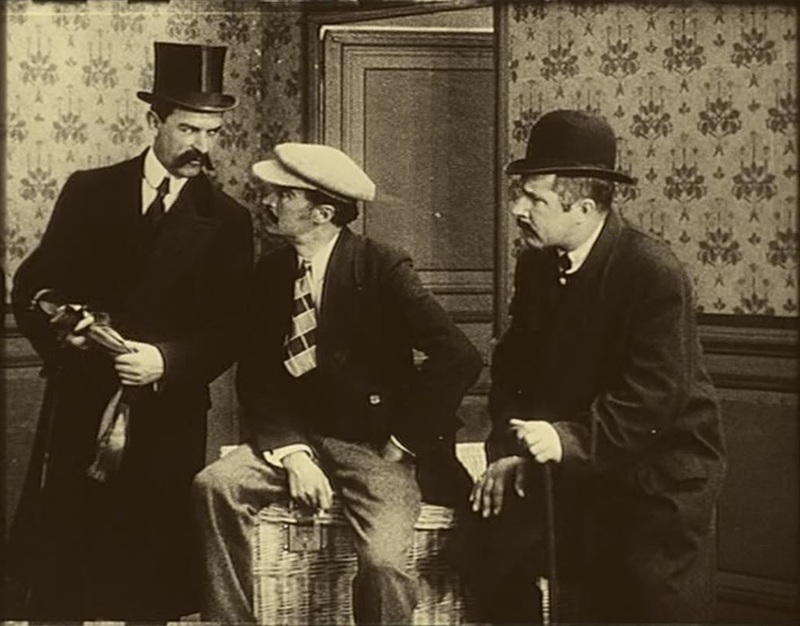 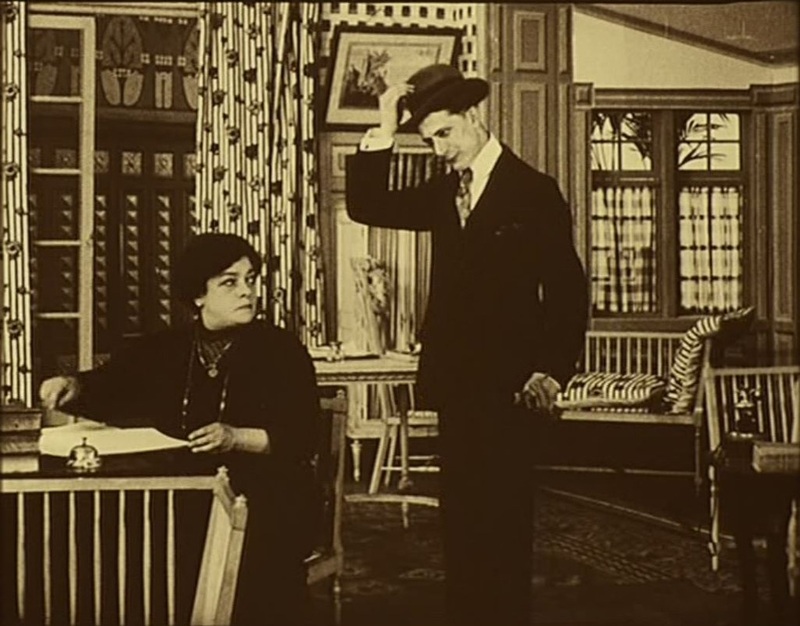 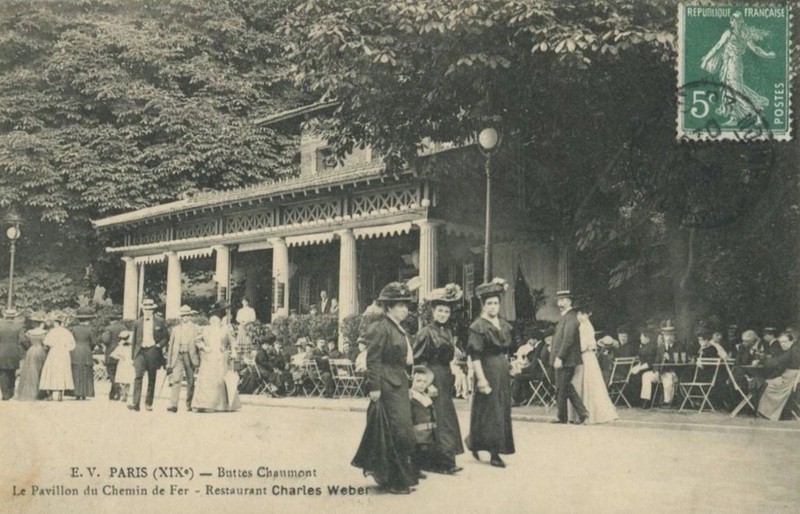 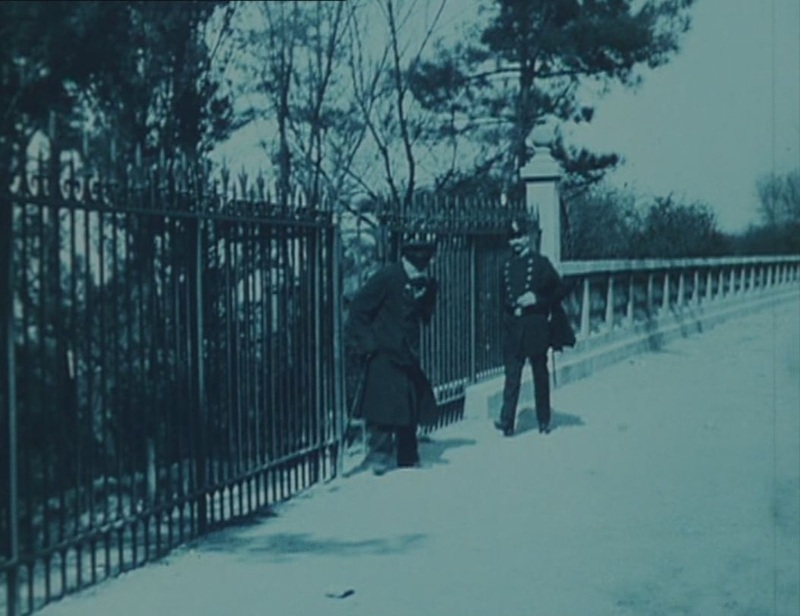 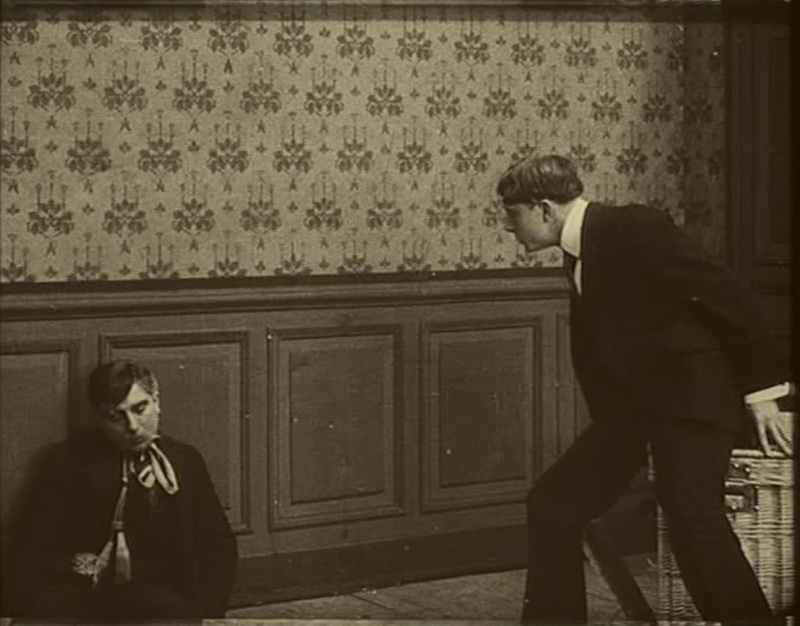 Feuillade's villa in Fantômas is the most personal connection, one that Feuillade pursued in Judex. 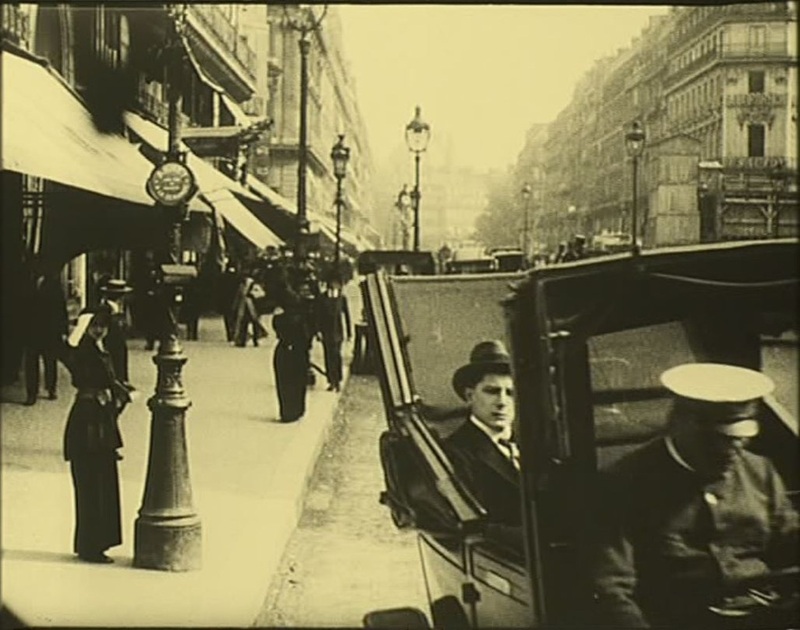 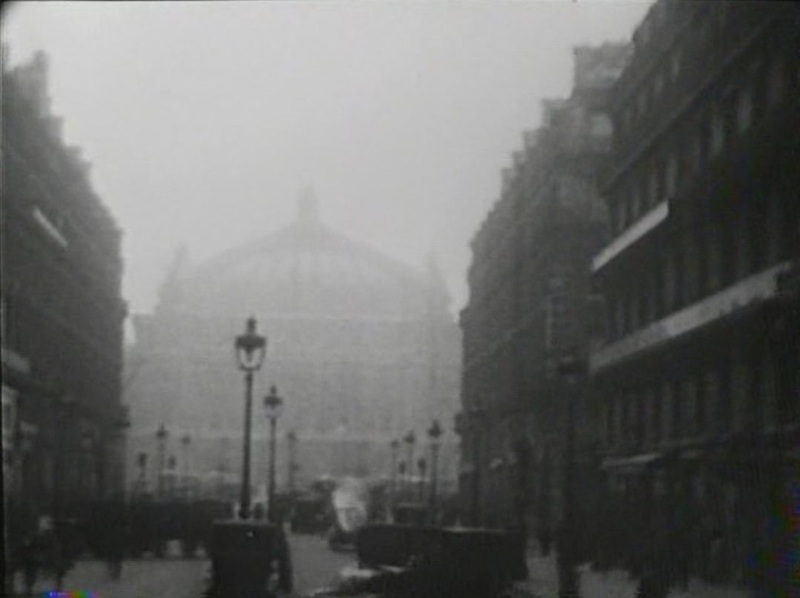 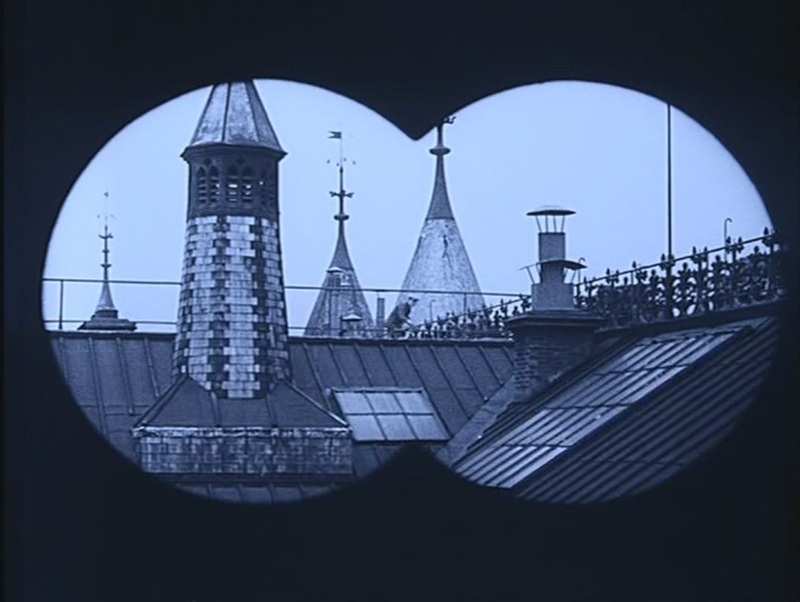 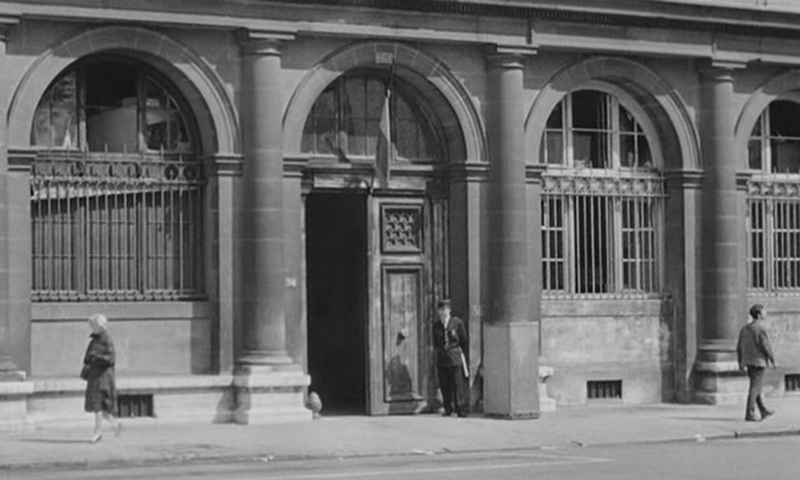 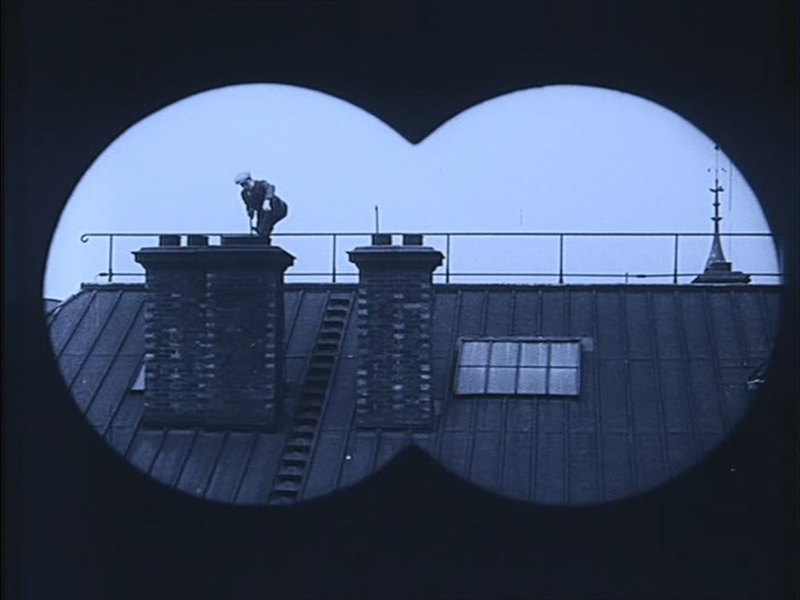 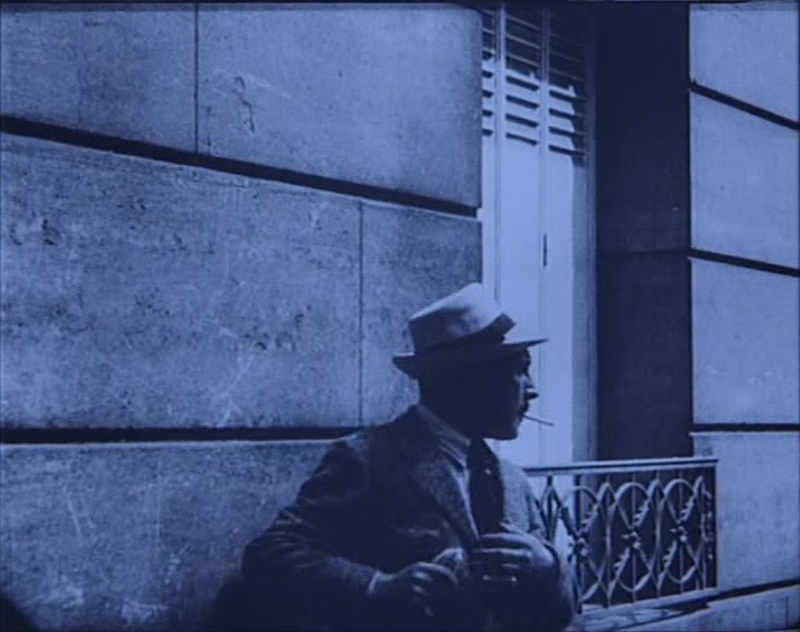 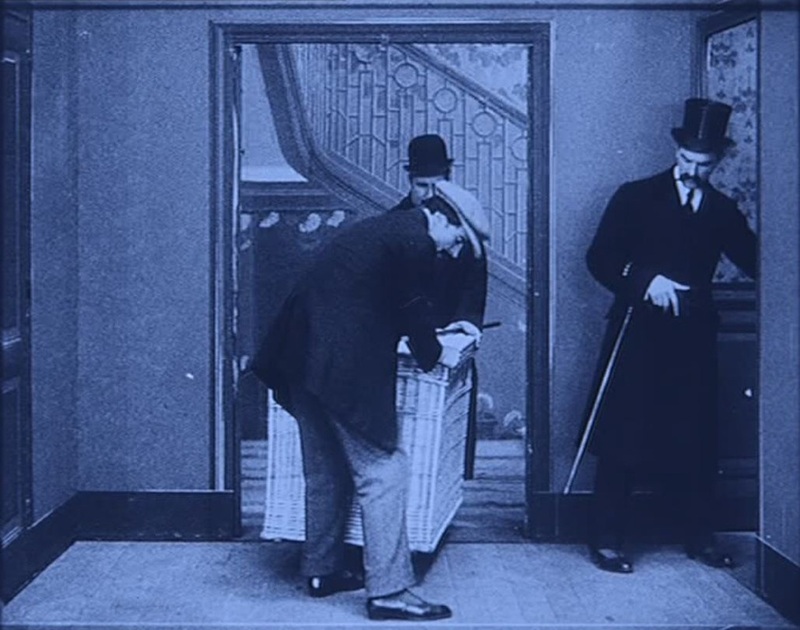 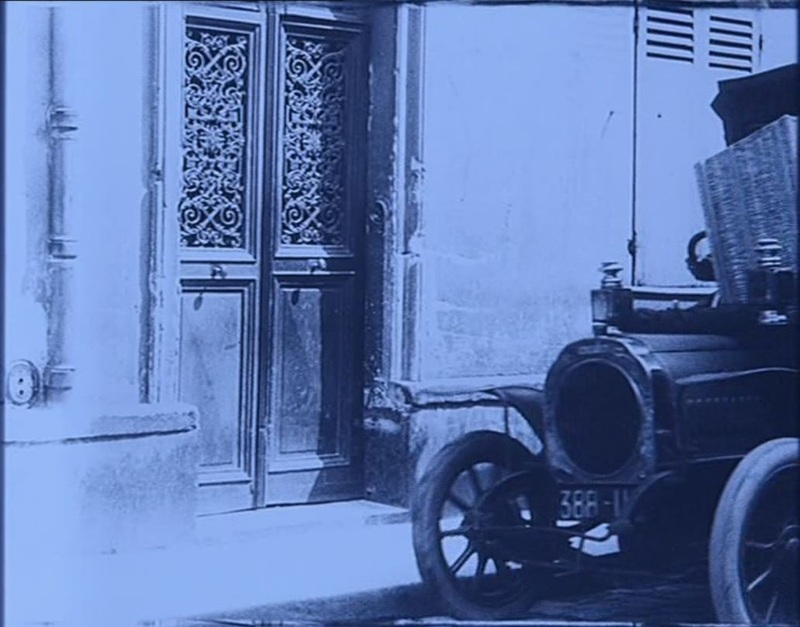 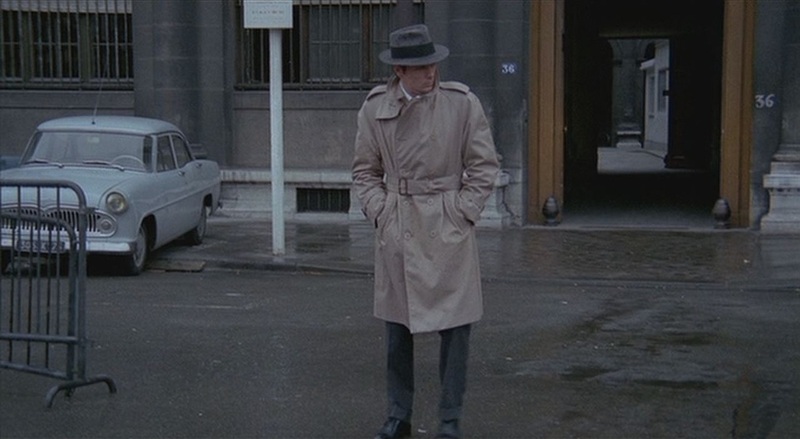 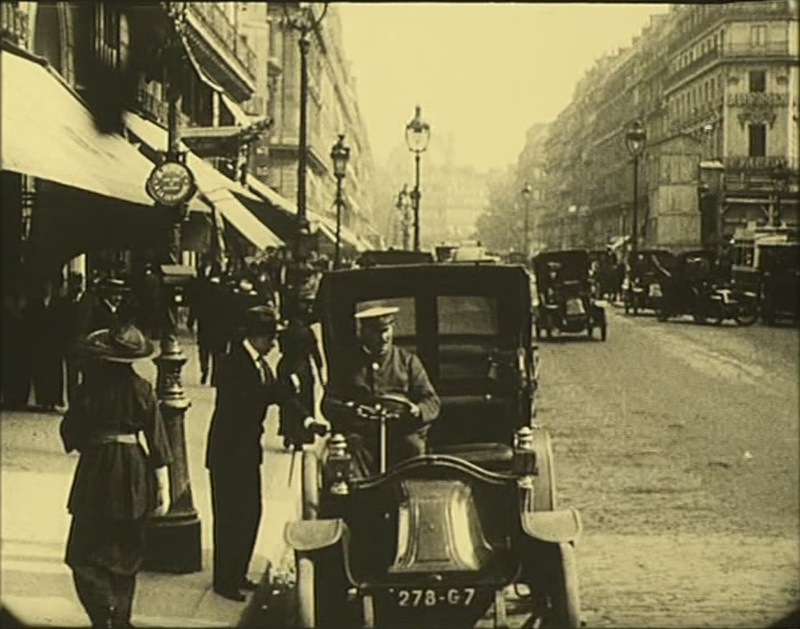 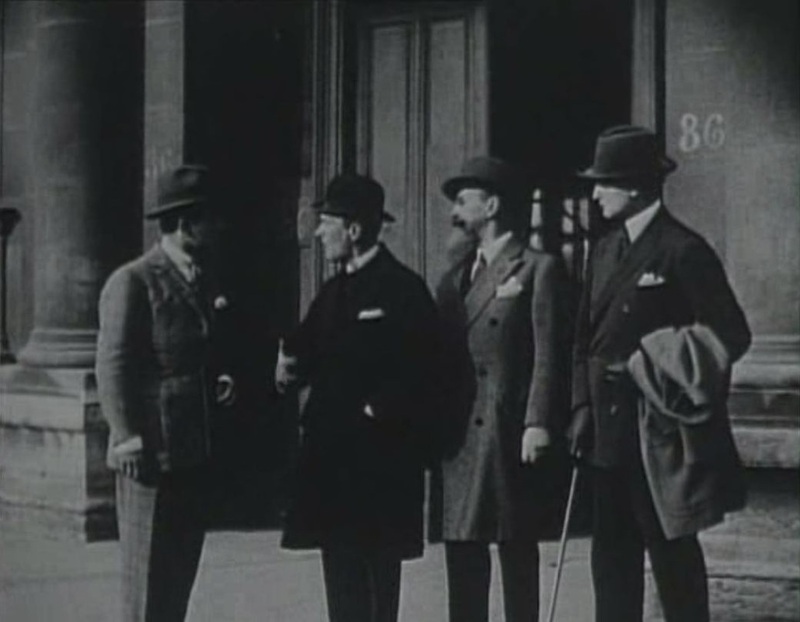 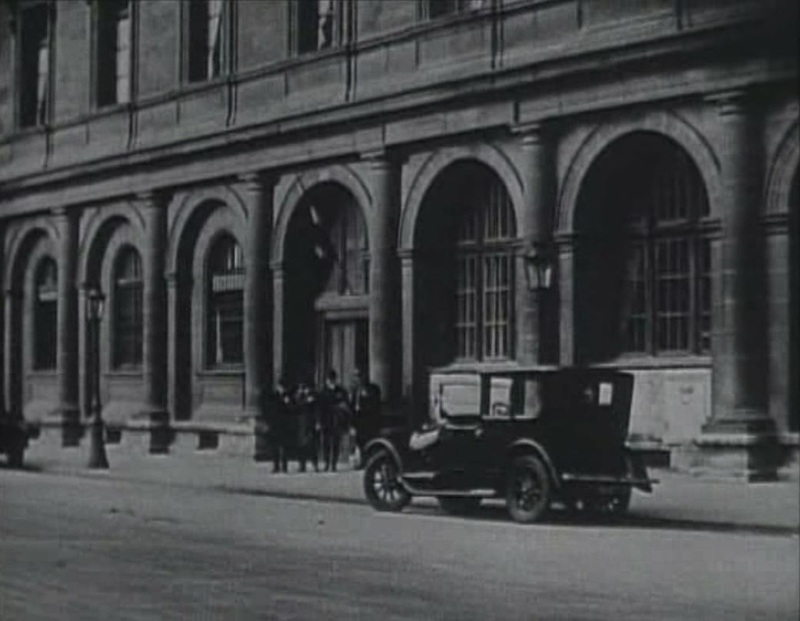 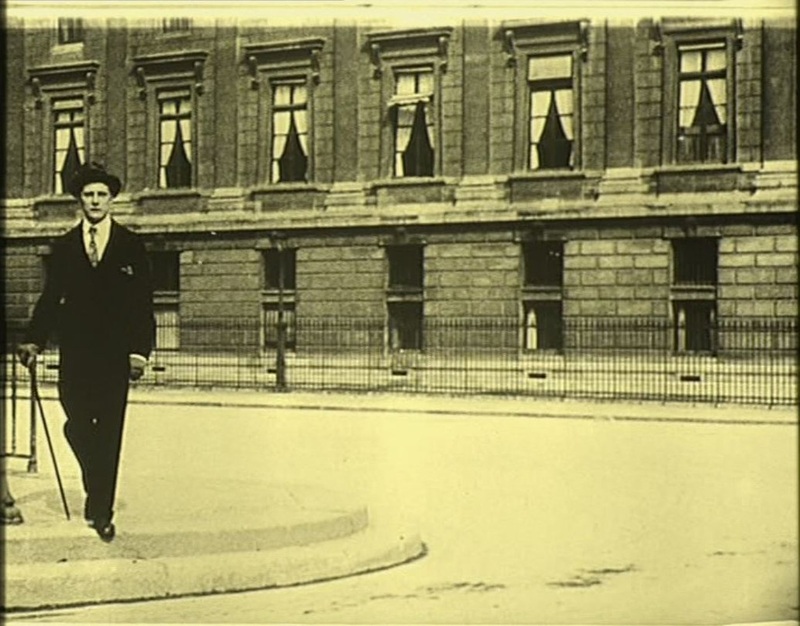 In Fantômas we also see the Gaumont Palace, rue Caulaincourt, and we have just seen him filming on the street near the Gaumont offices, rue Saint Roch. 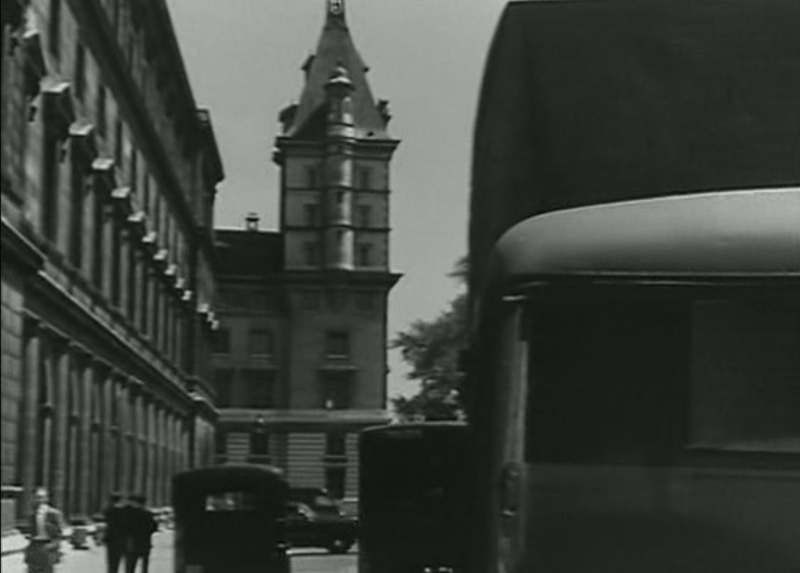 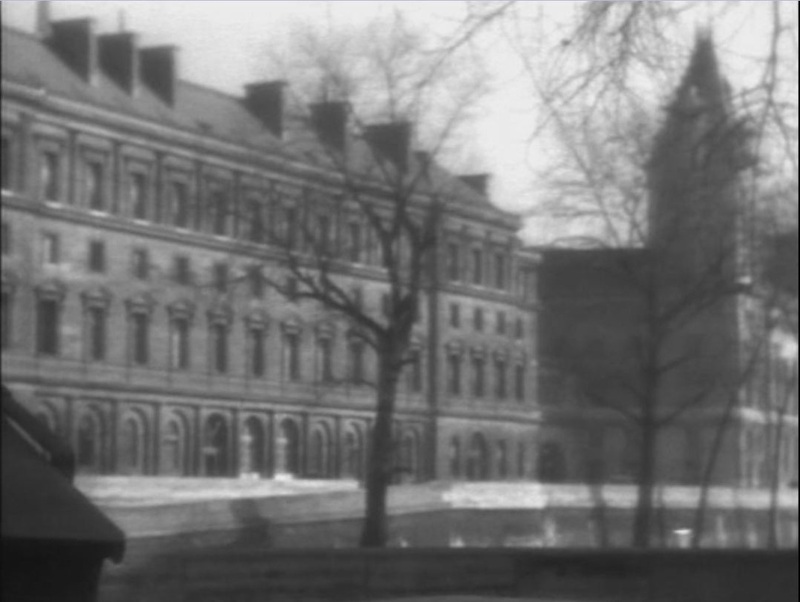 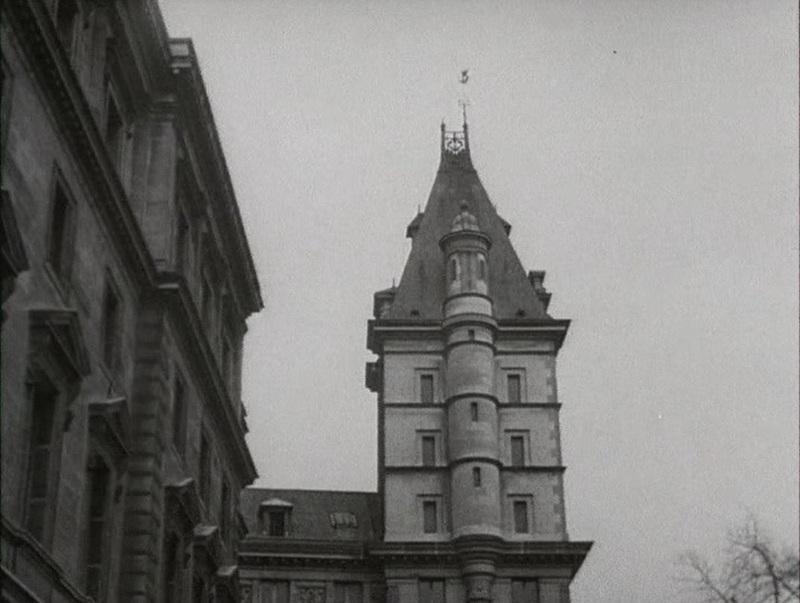 I haven't yet seen the actual office building in a Gaumont film, but I'm sure it will appear one day. 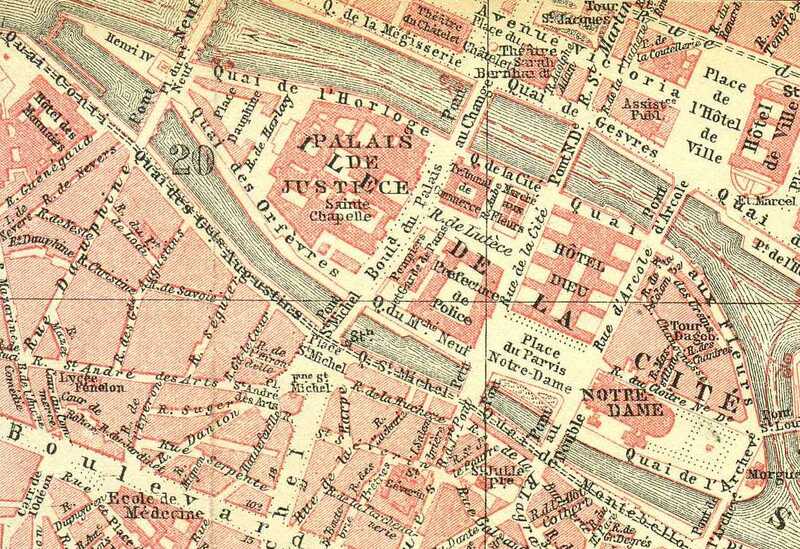 Finally, there are the various parts of the Cité Elgé, where the studio is, of course, but there are also the streets within the complex and immediately around it. 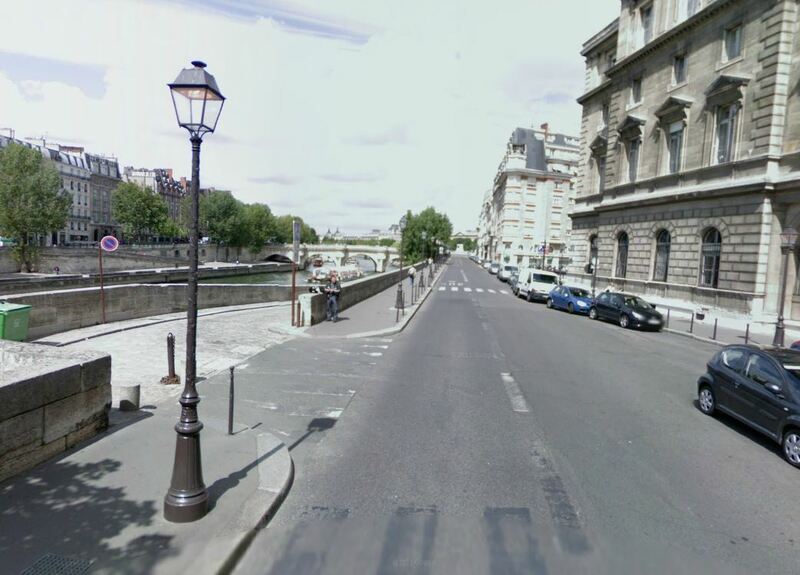 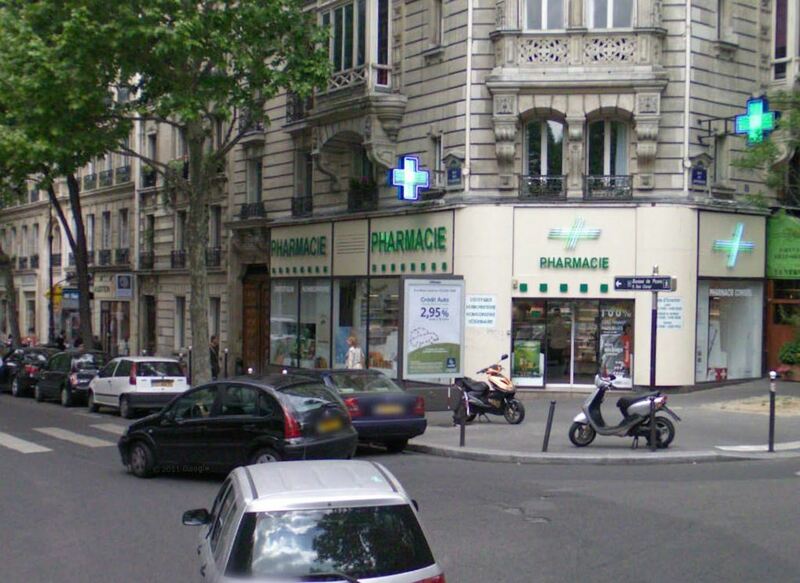 One other place in Le Mort qui tue uses elements local to the Cité Elgé, but this time they are meant to pass for somewhere else in Paris, on the other side of the city. 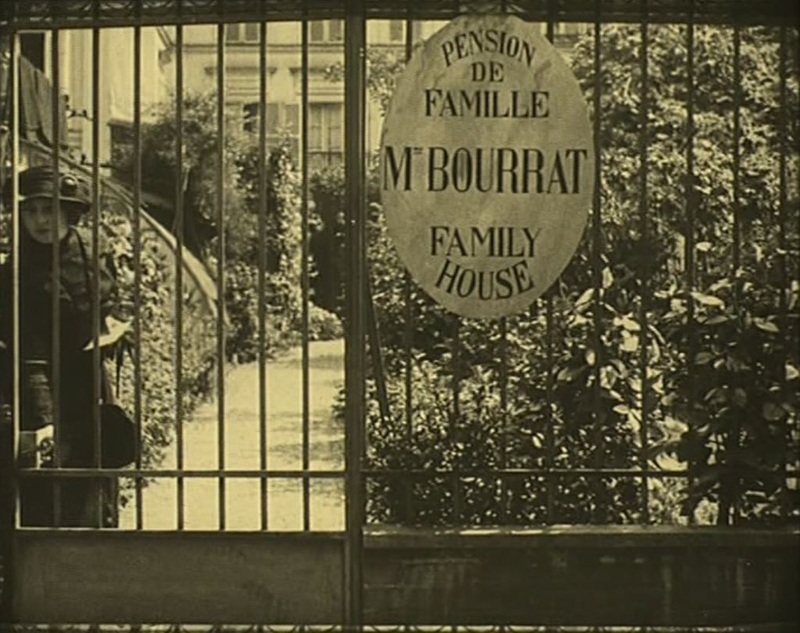 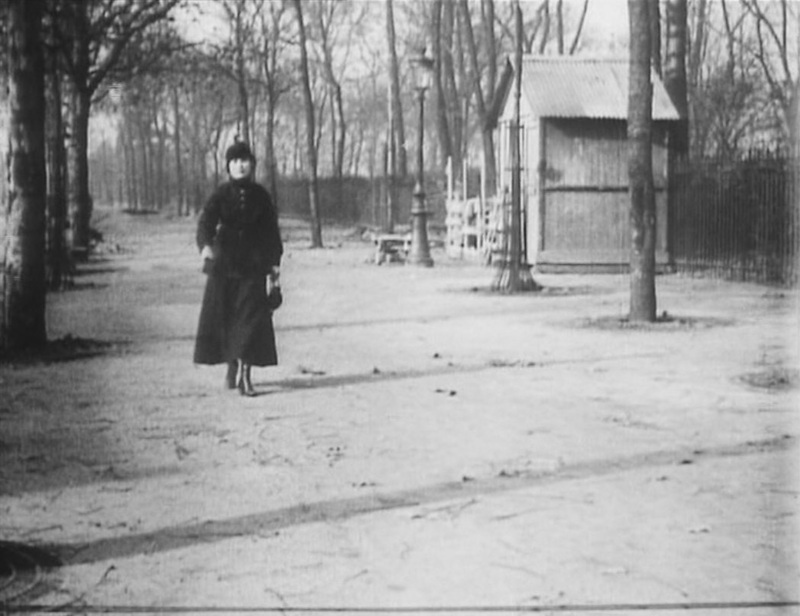 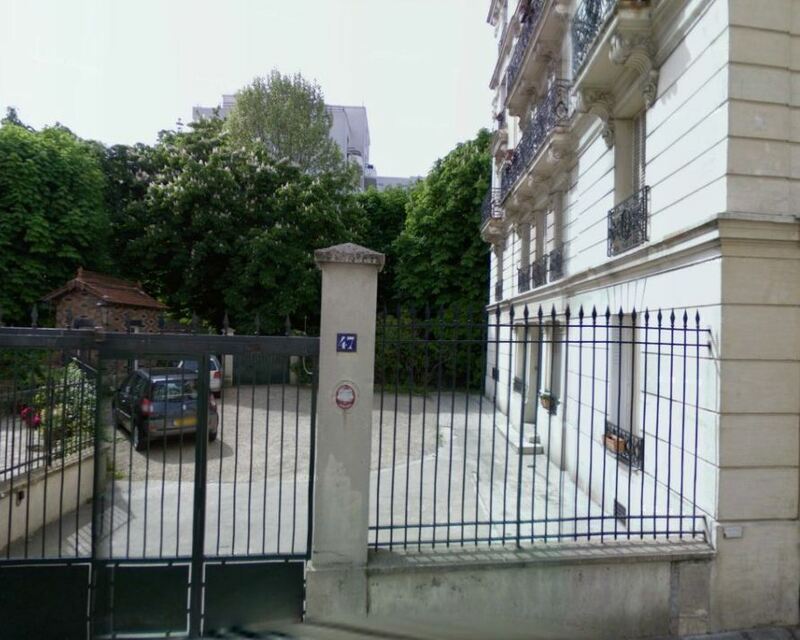 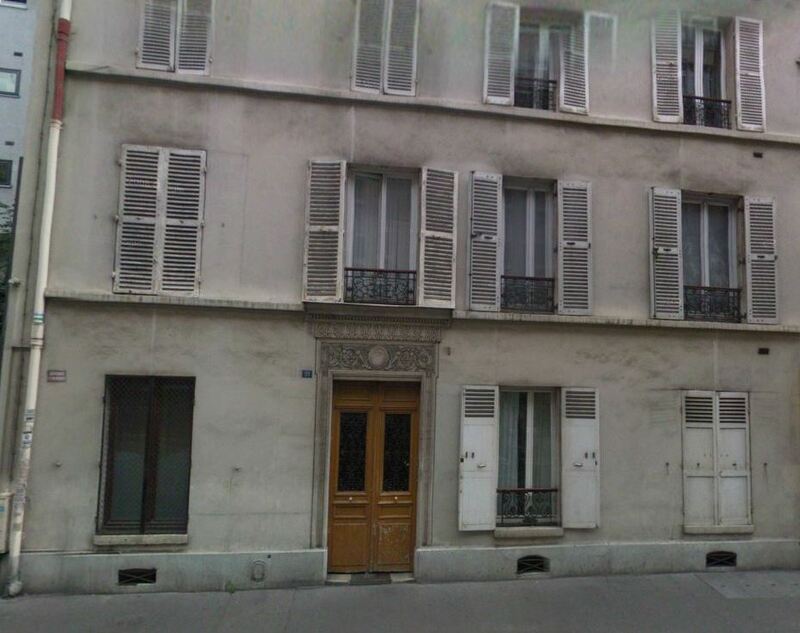 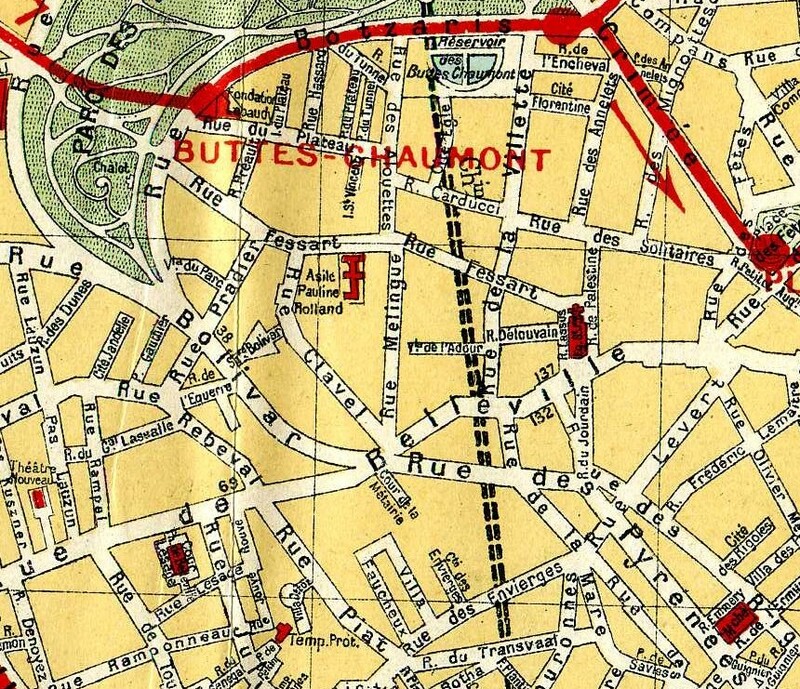 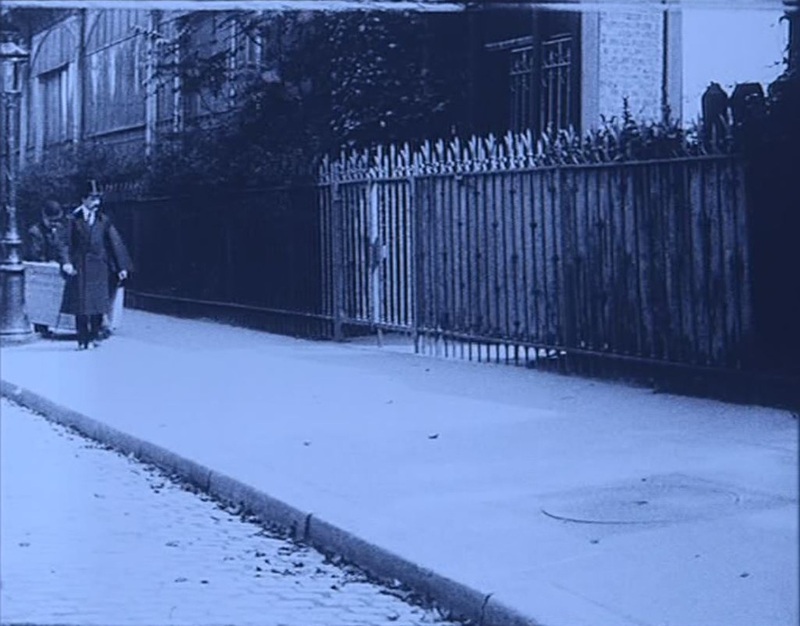 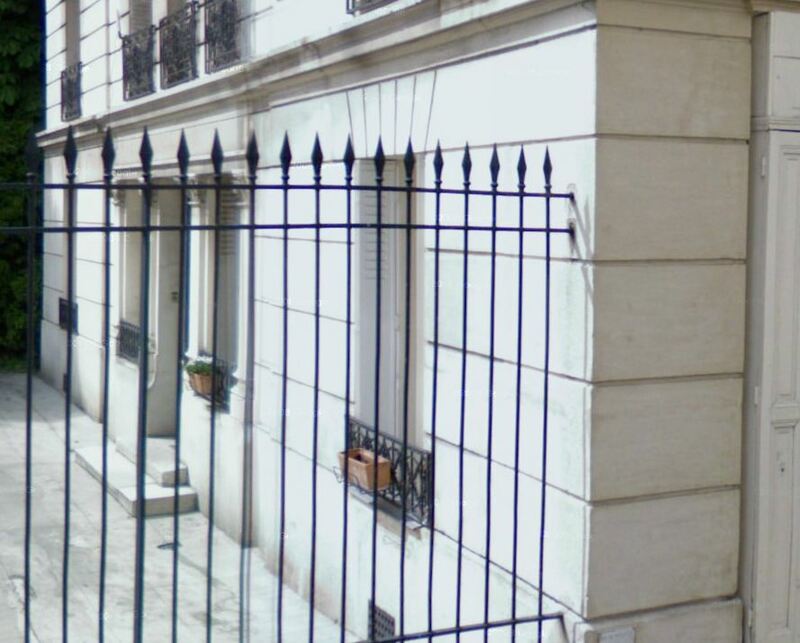 After the death of her brother Elisabeth Dollon takes refuge in a family-run guesthouse in Auteuil (on the rue Raffet, according to the novel). 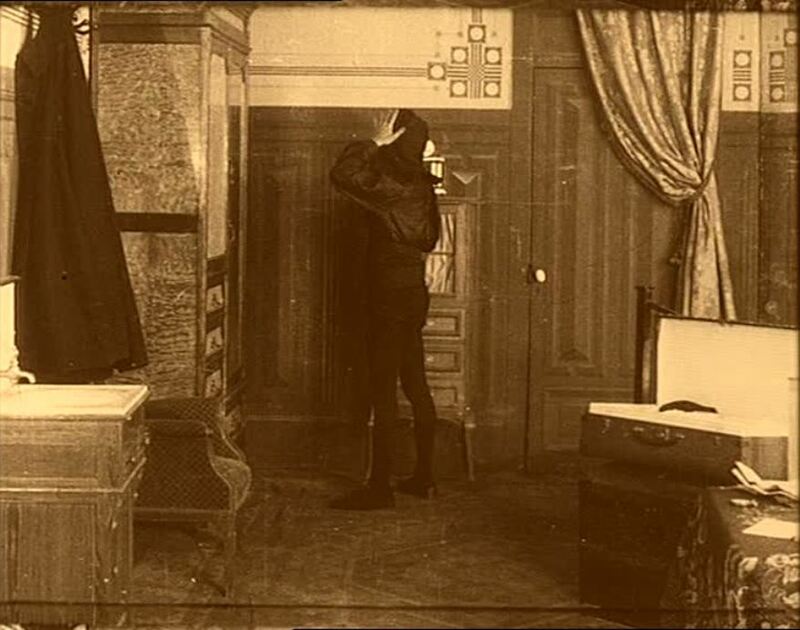 We see three parts of the interior: the reception area, the corridor outside Elisabeth's bedroom, and the bedroom itself. 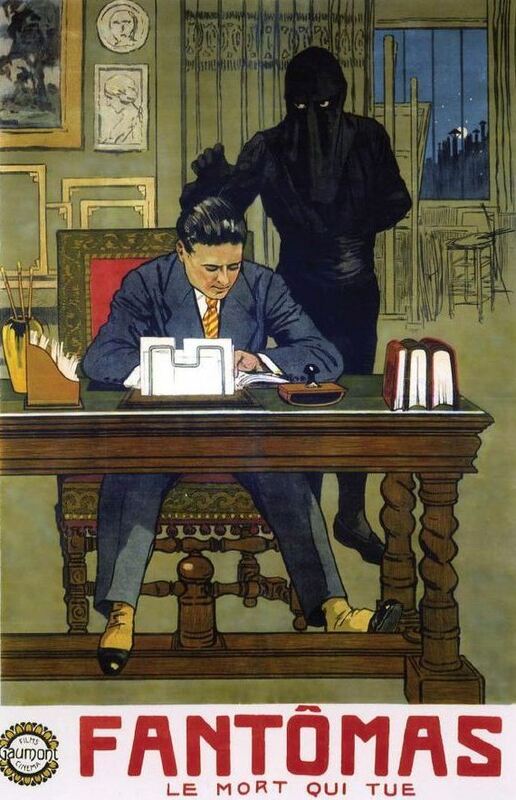 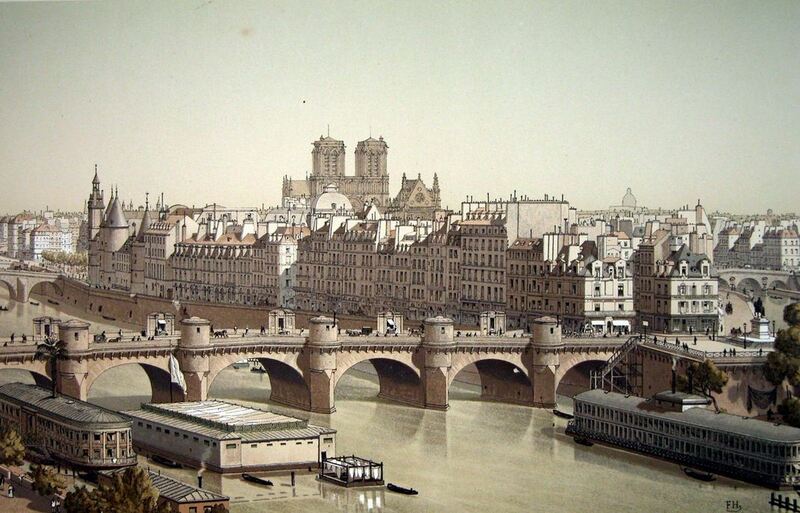 The poster for the film, in adapting Gino Starace's artwork for the book, lessened the threat so that Fantômas was not crushing justice, crushing underfoot the medieval towers of the Palais de Justice, but only passing over it, sublimely ignoring it. 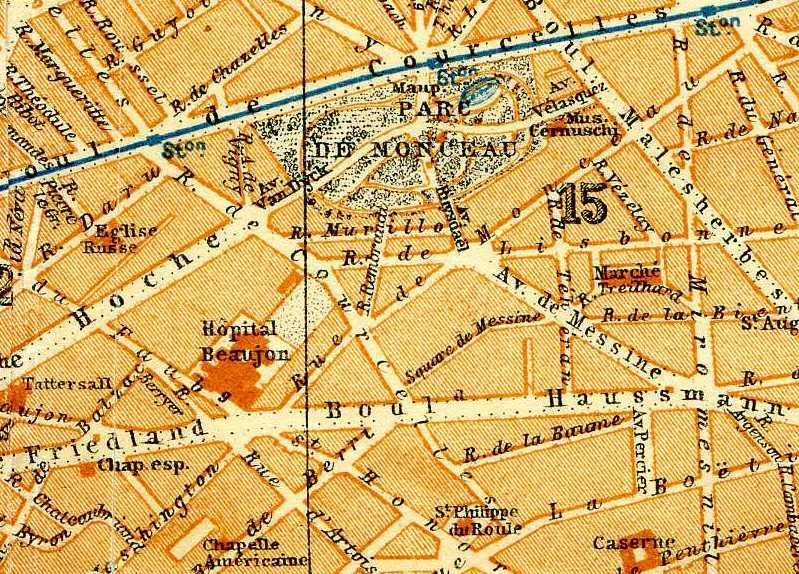 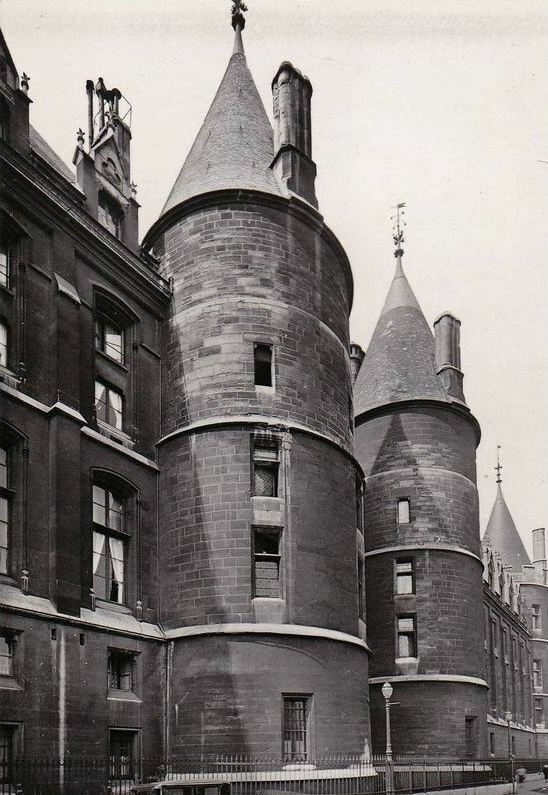 I'm not sure where exactly the juge d'instruction's office would be on this plan, but it would certainly be on the south side, somewhere near the Parquet du Prosécuteur Général, so near the building works. 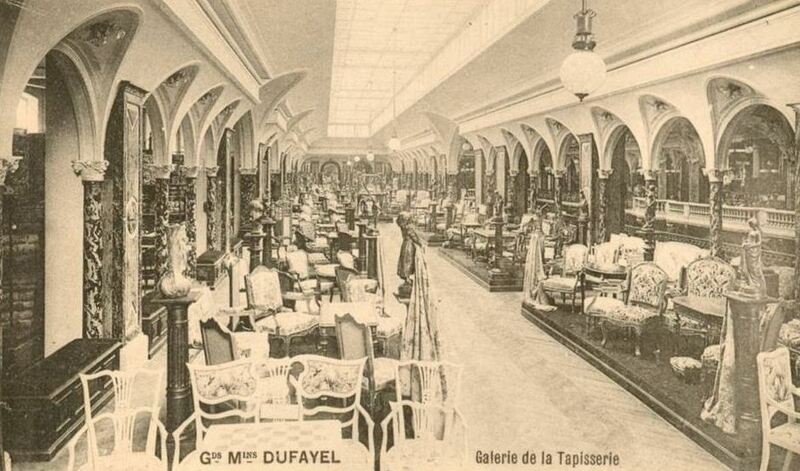 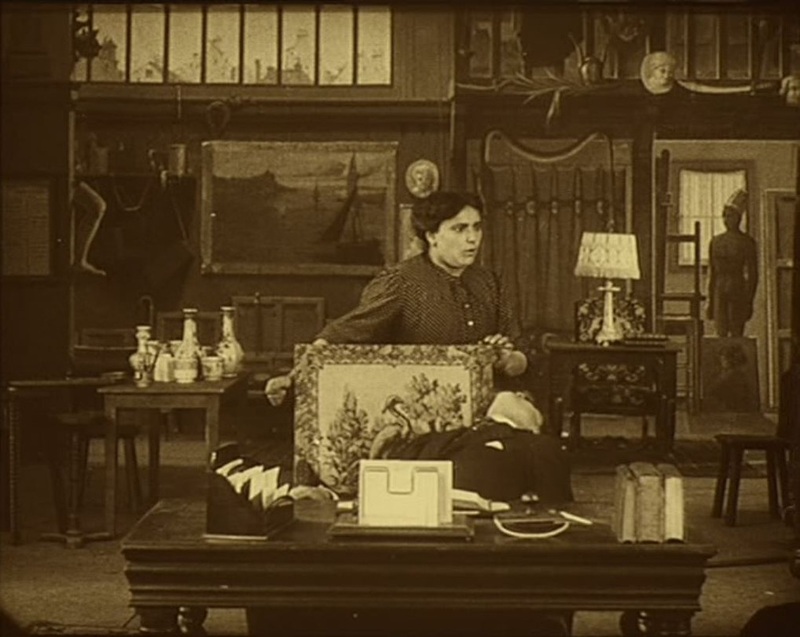 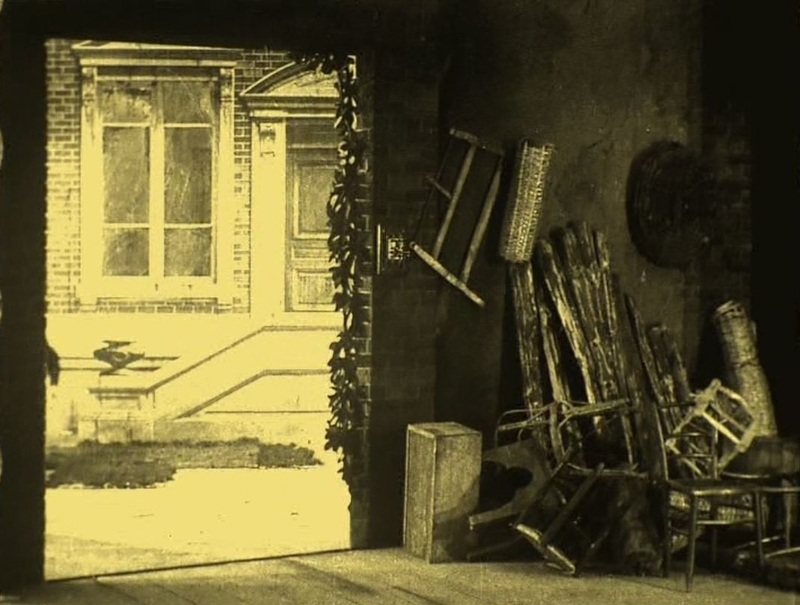 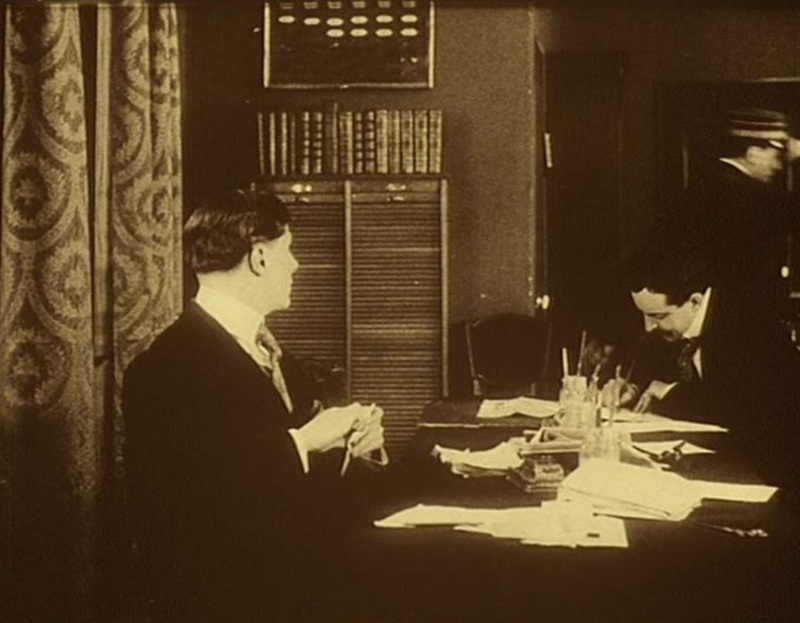 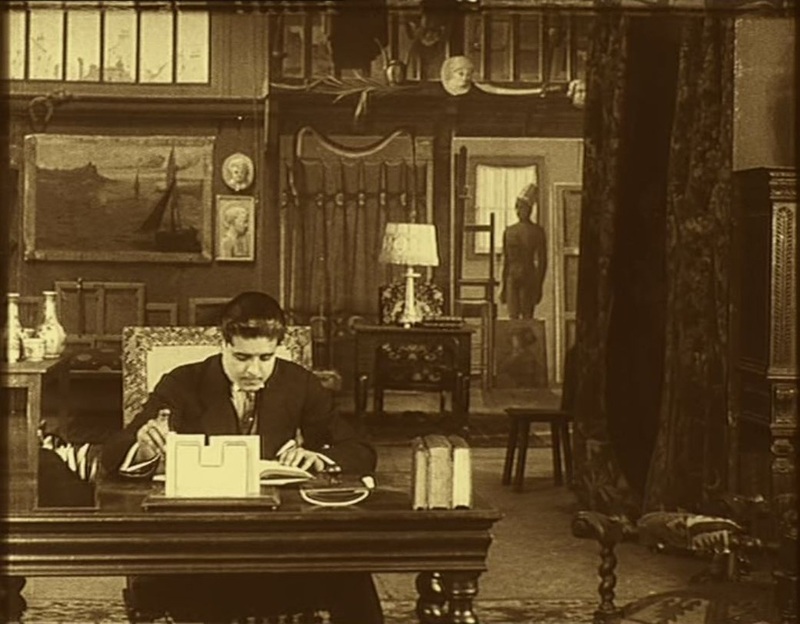 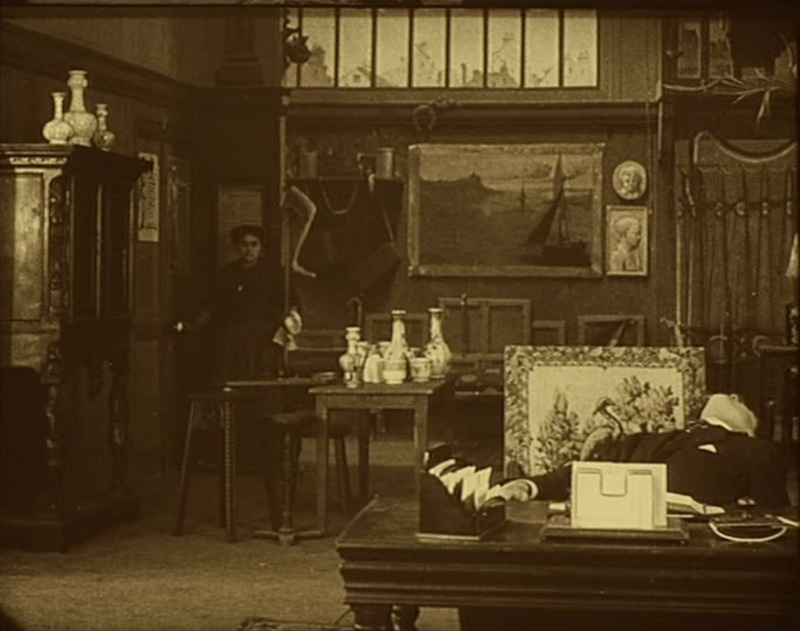 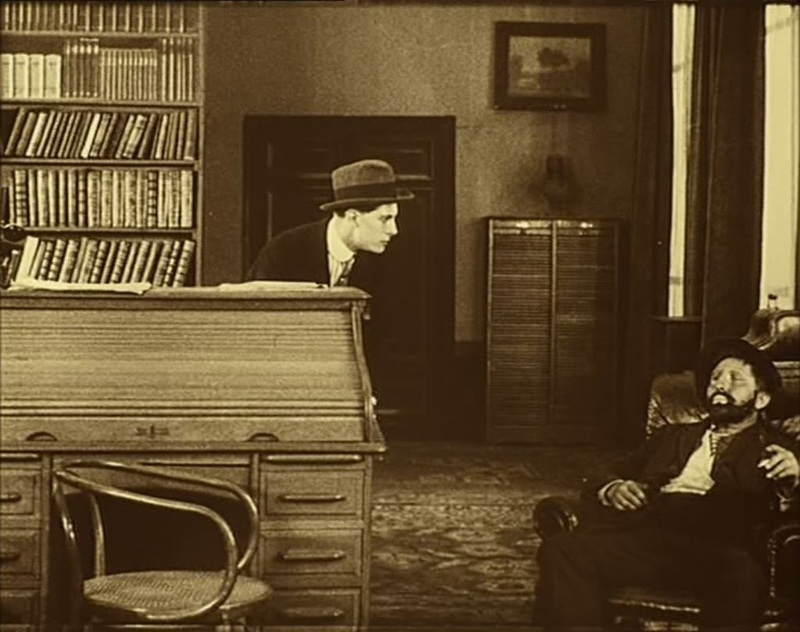 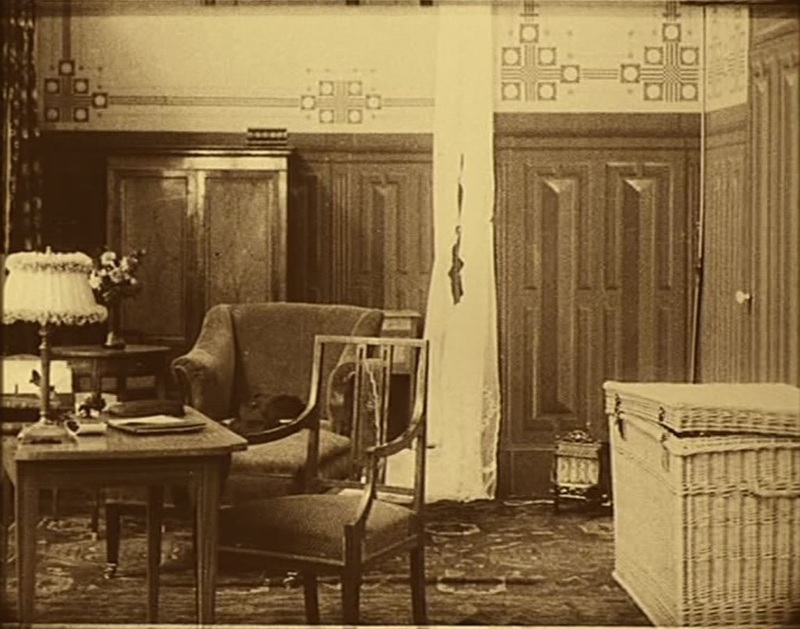 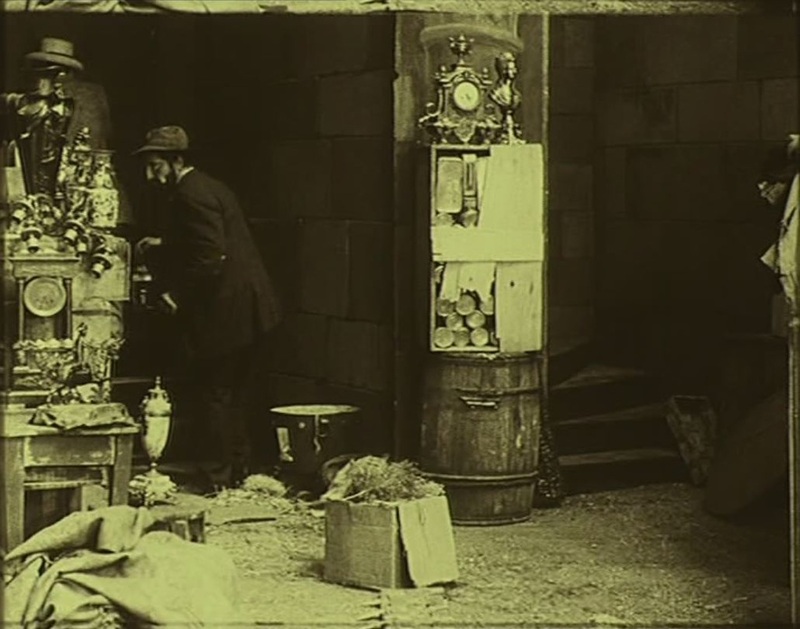 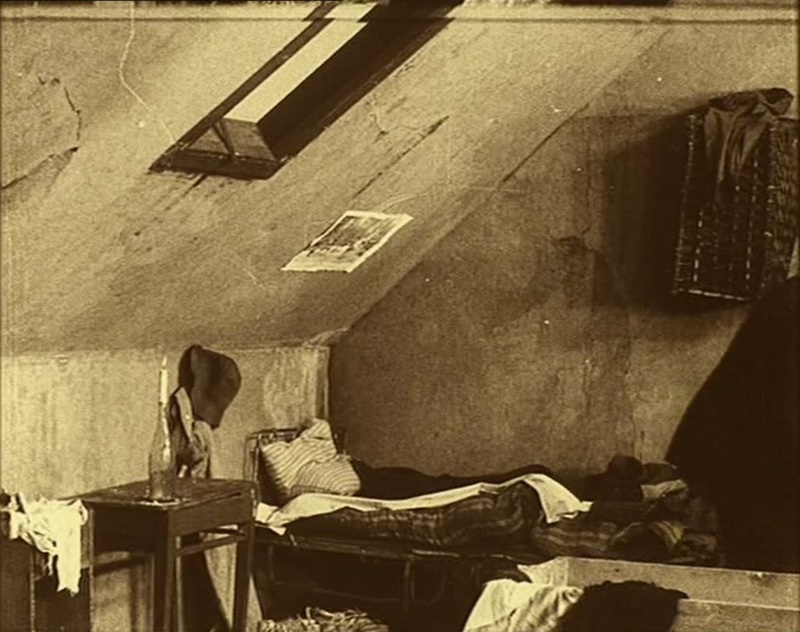 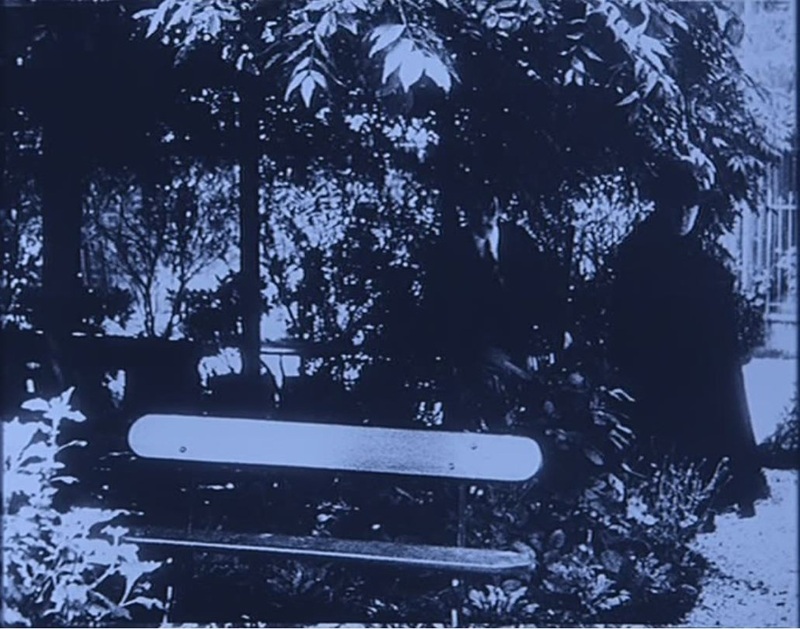 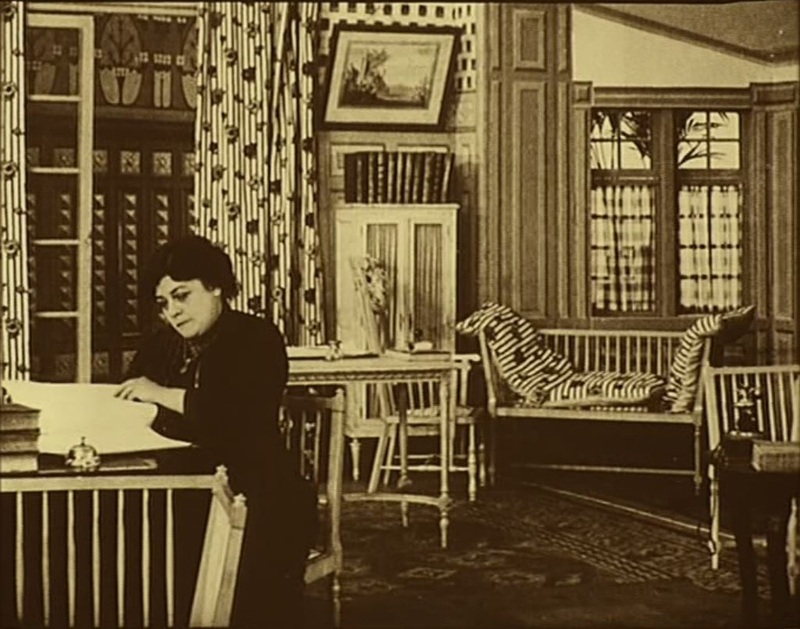 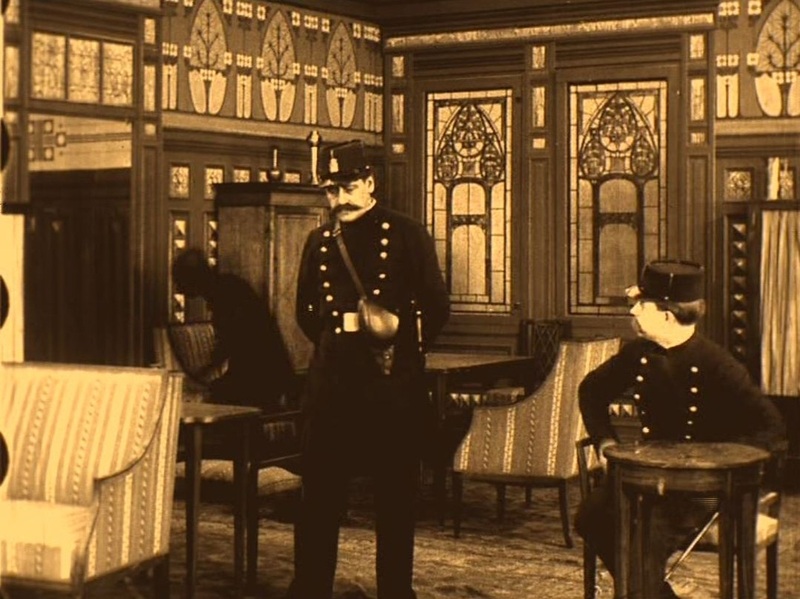 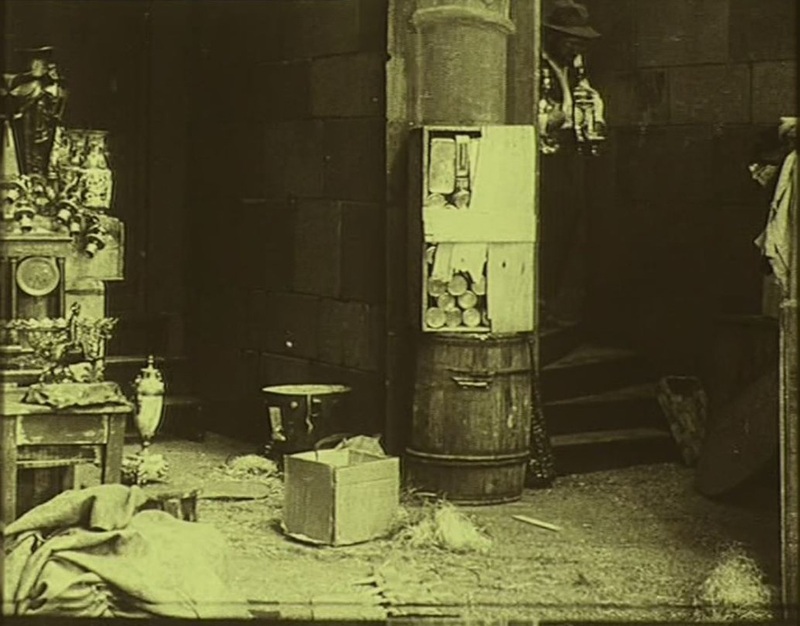 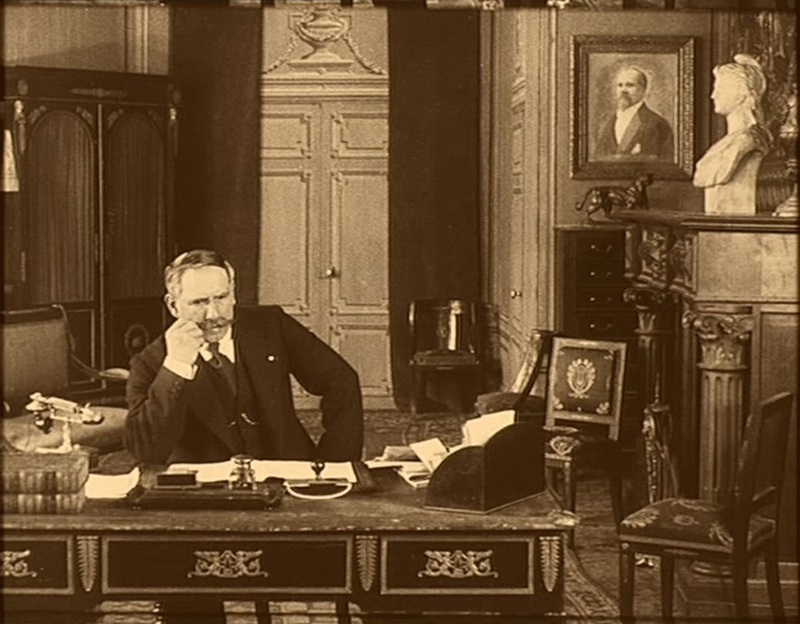 I have discussed here (towards the end of the piece) the recurrent use of this generic décor in Feuillade's films. 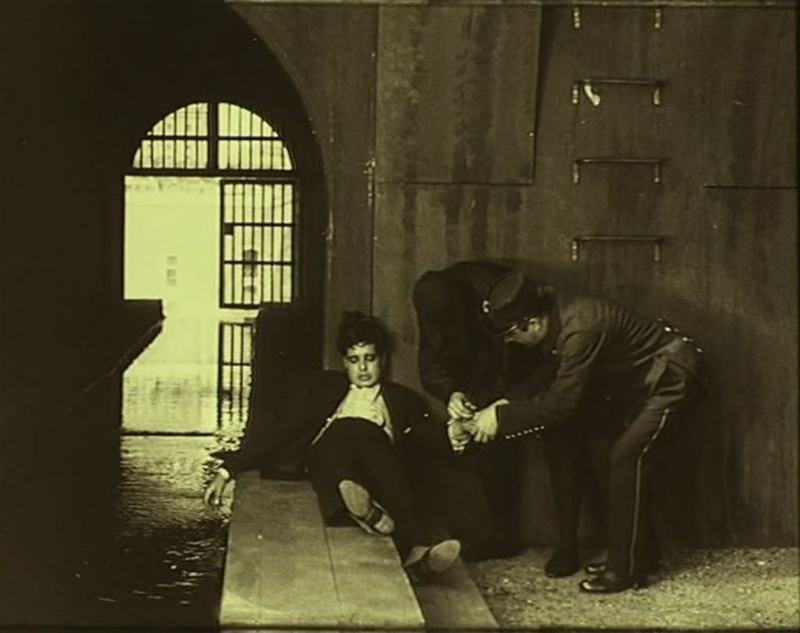 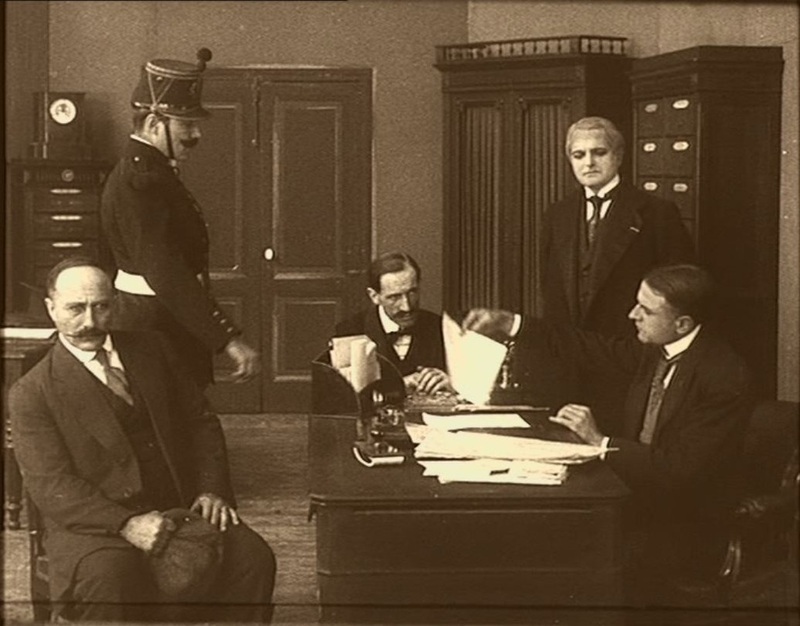 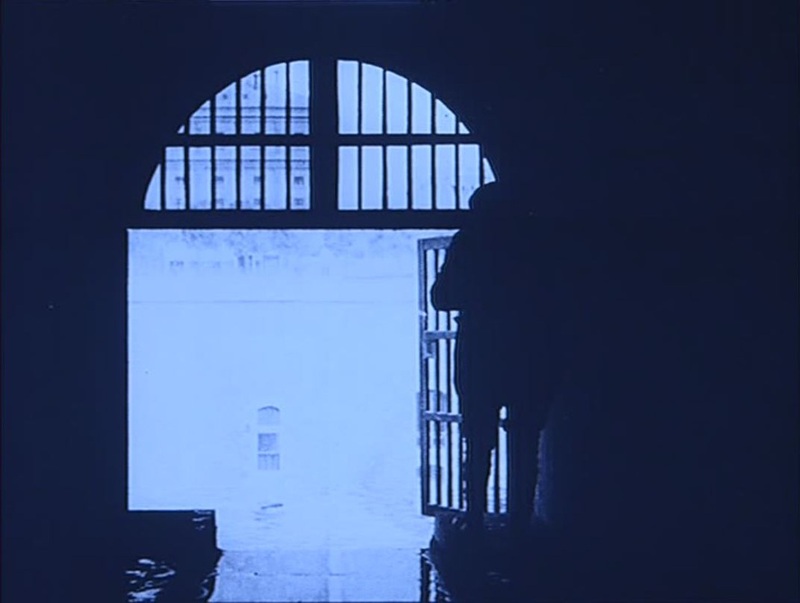 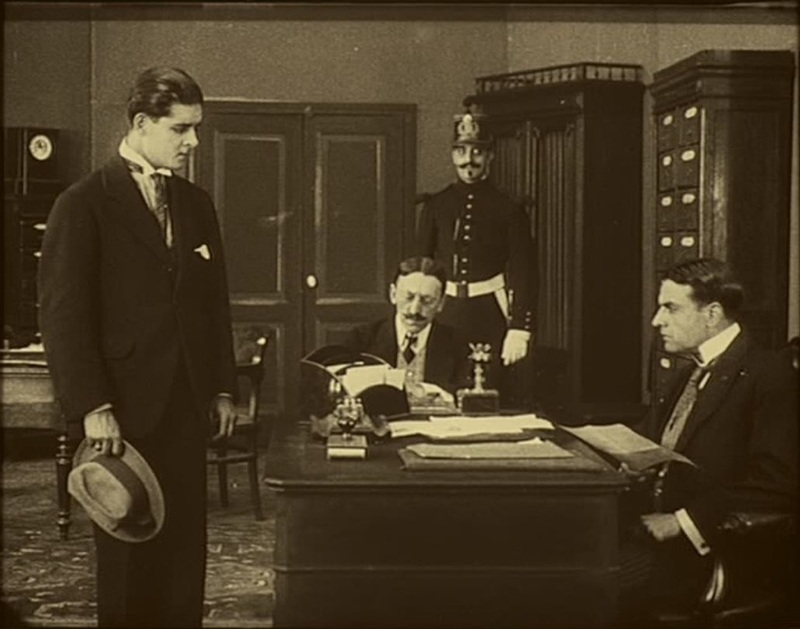 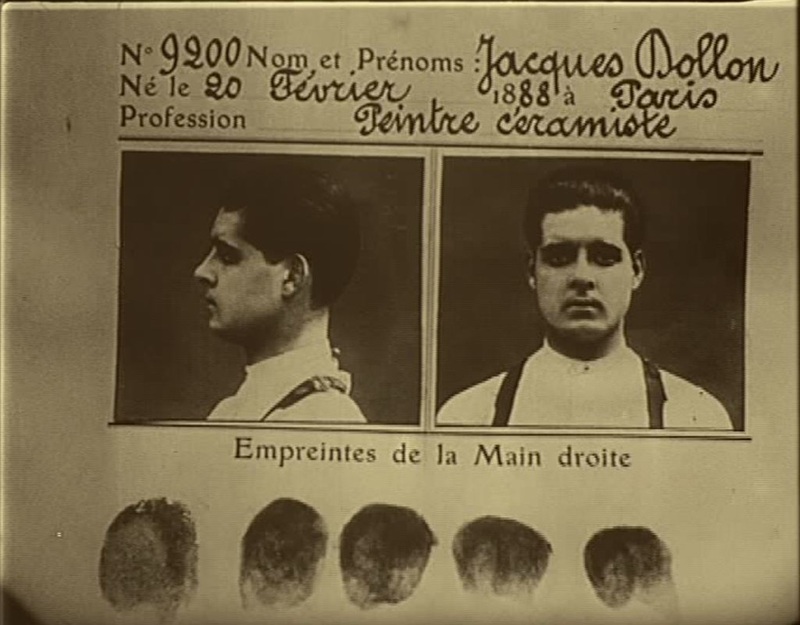 It is again a part of the following film, when Juve is imprisoned there. 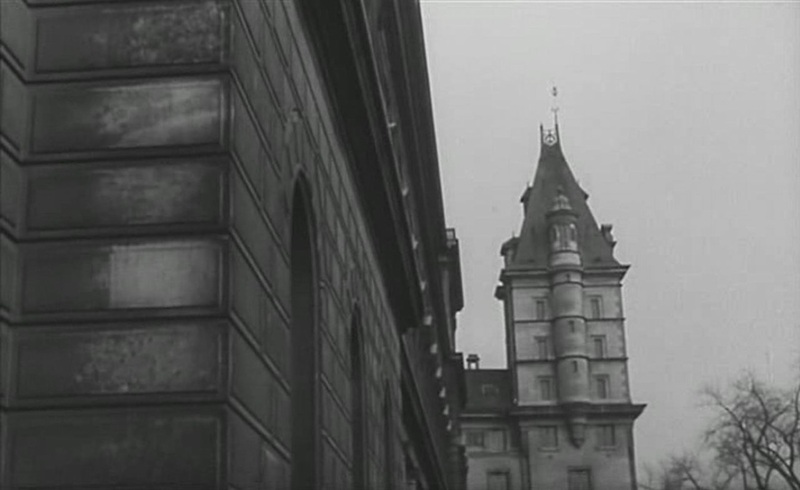 If Feuillade had pointed his camera east rather than west we might have had a first screen glimpse of that iconic tower. 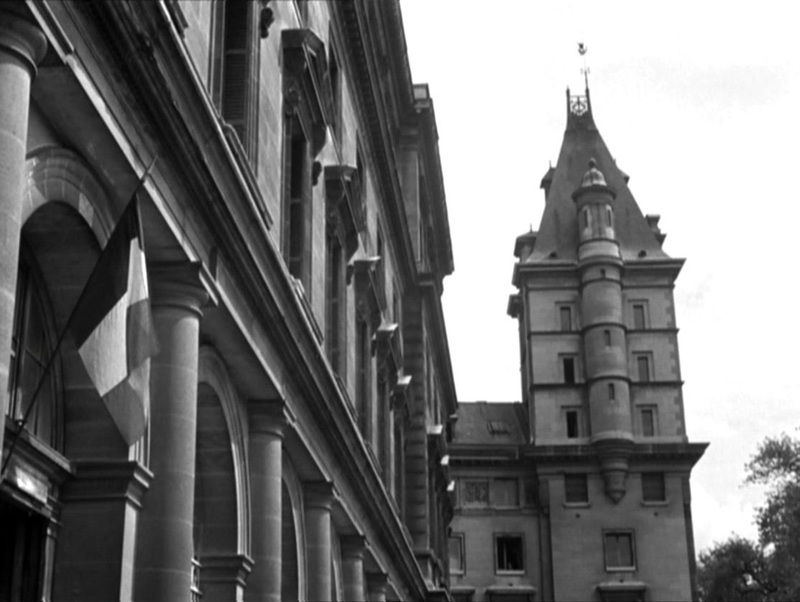 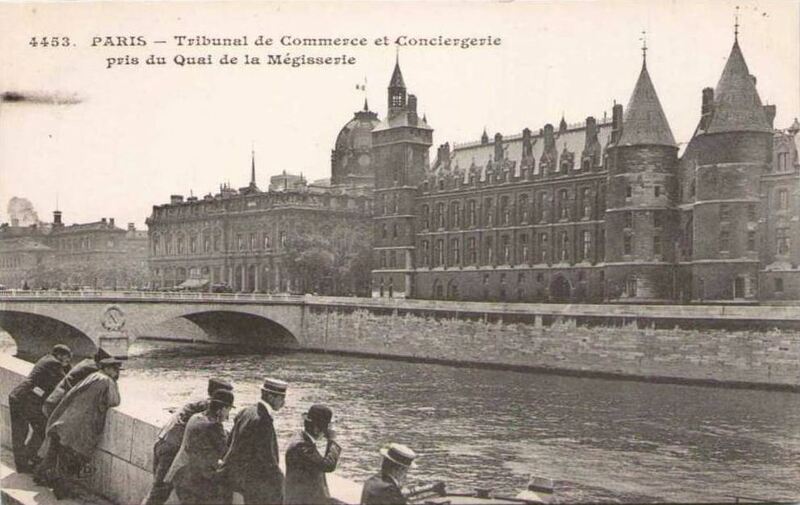 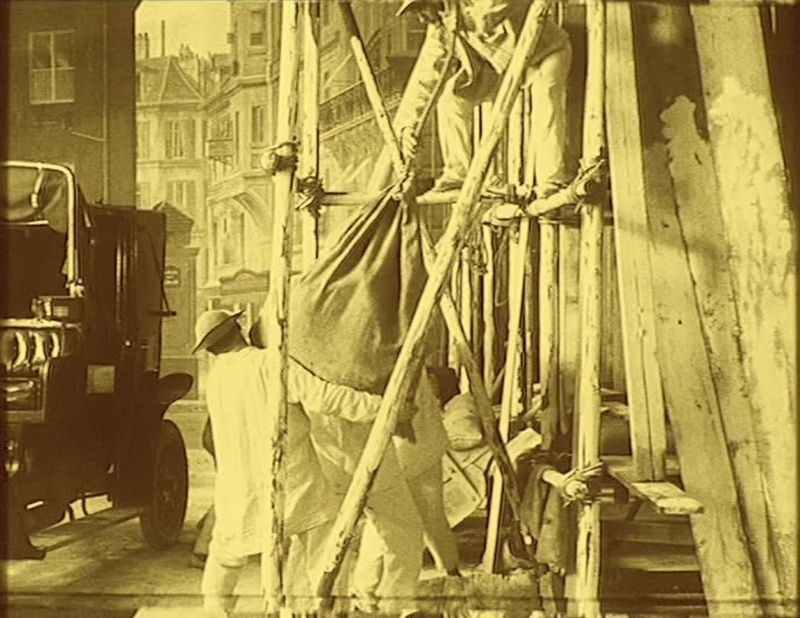 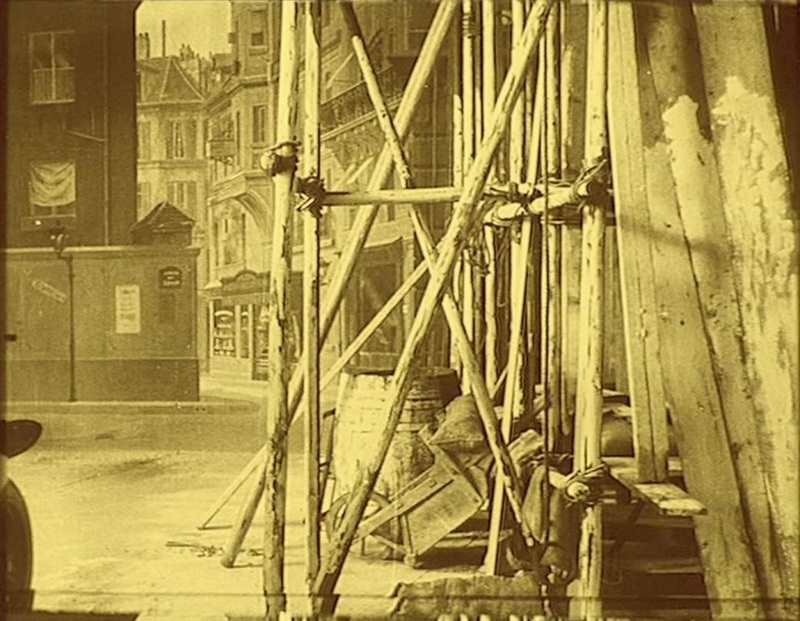 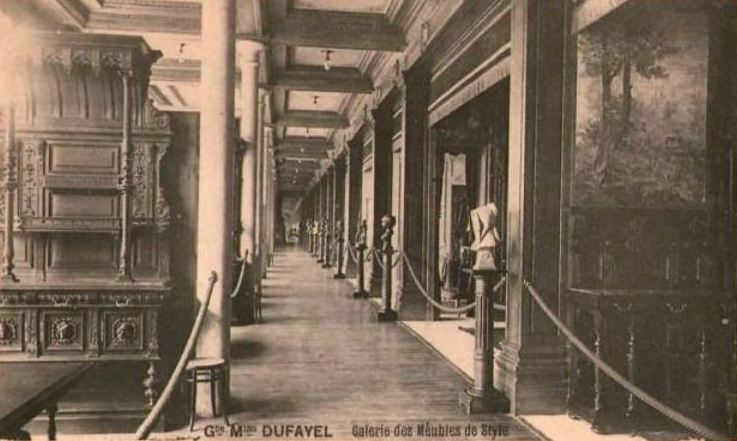 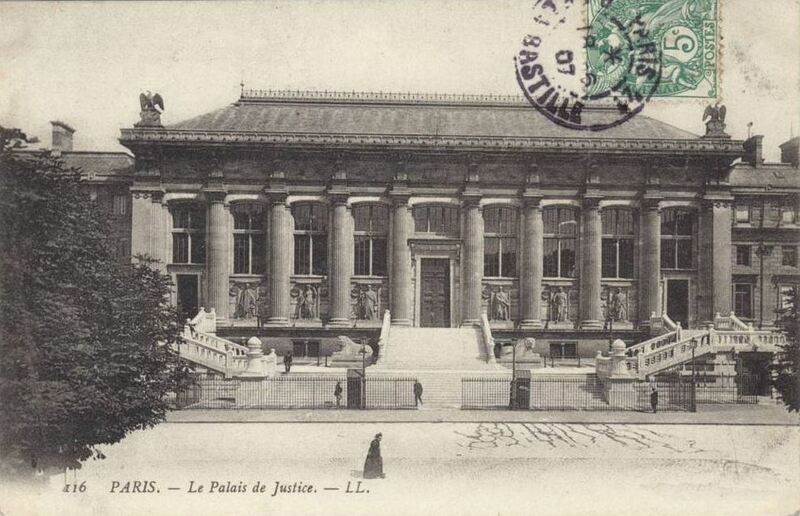 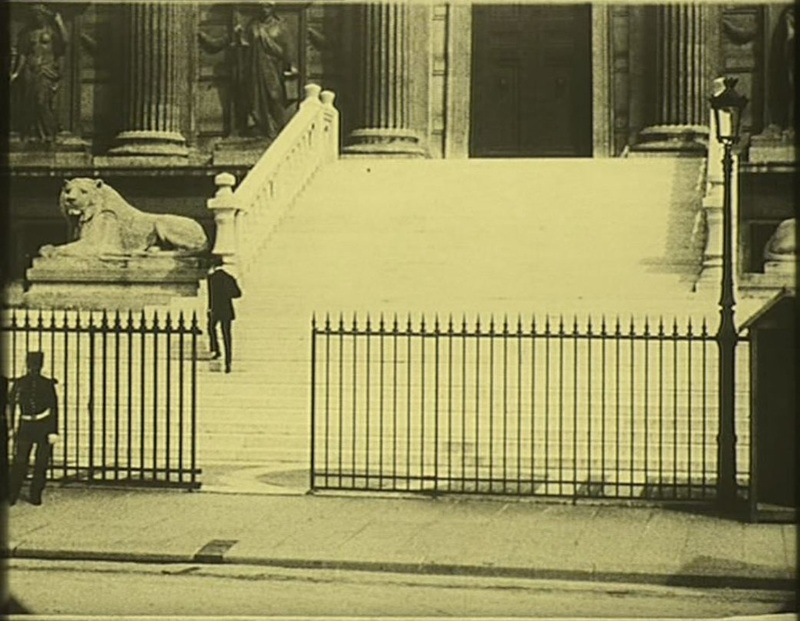 Since the building was only completed in 1914, it might still have been clad in scaffolding, but certainly it wouldn't have looked like the scaffolded Palais de Justice we have seen in Feuillade's next Fantômas film, Fantômas contre Fantômas. 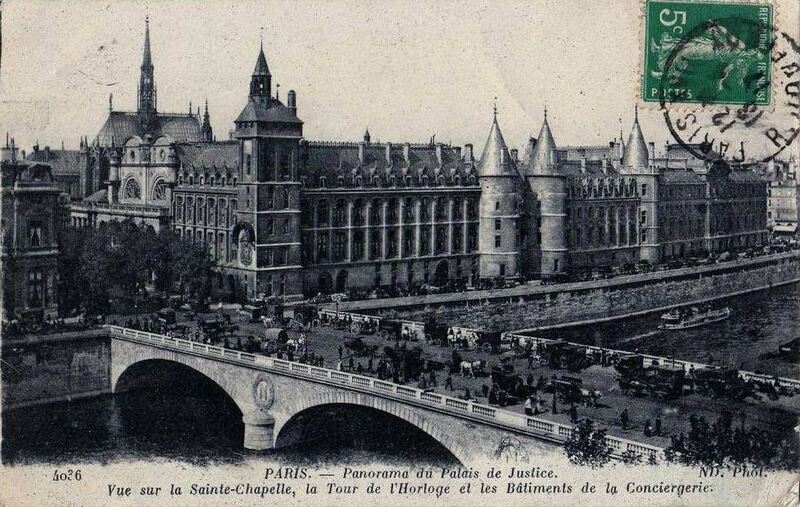 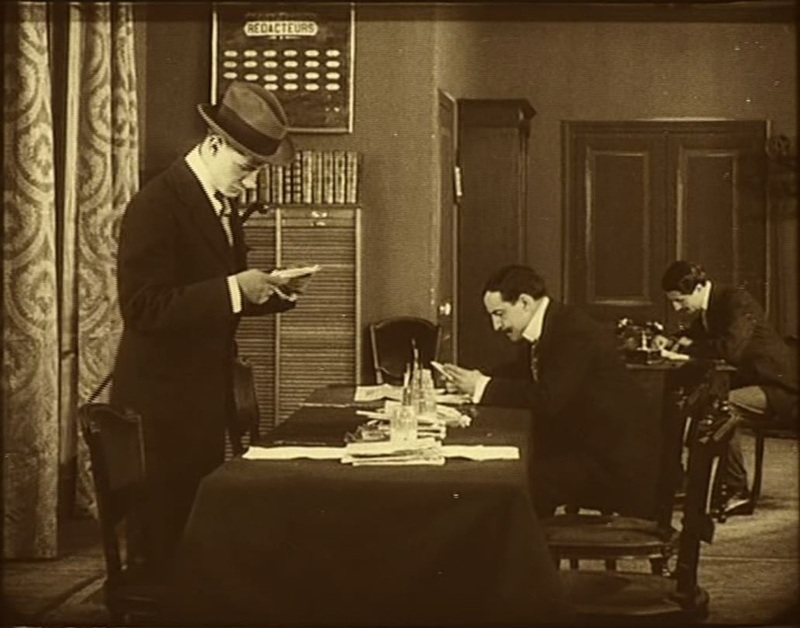 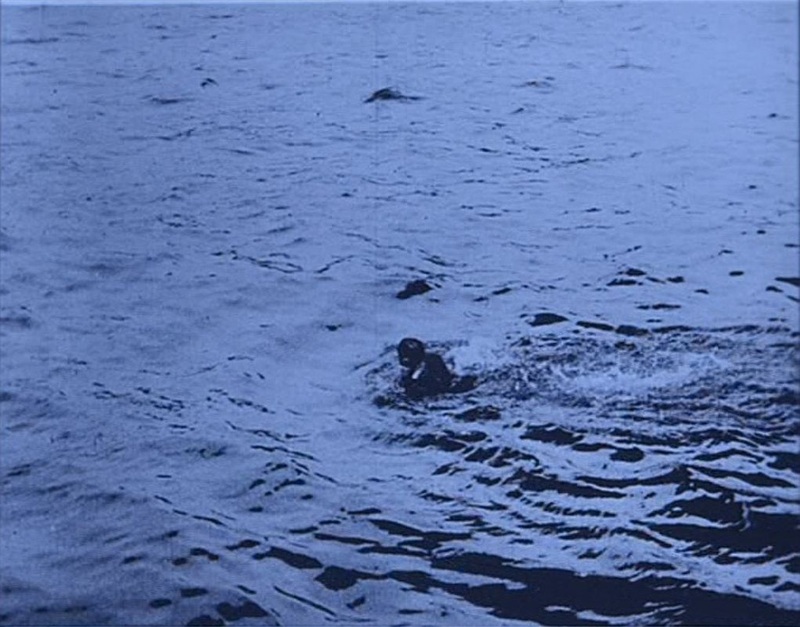 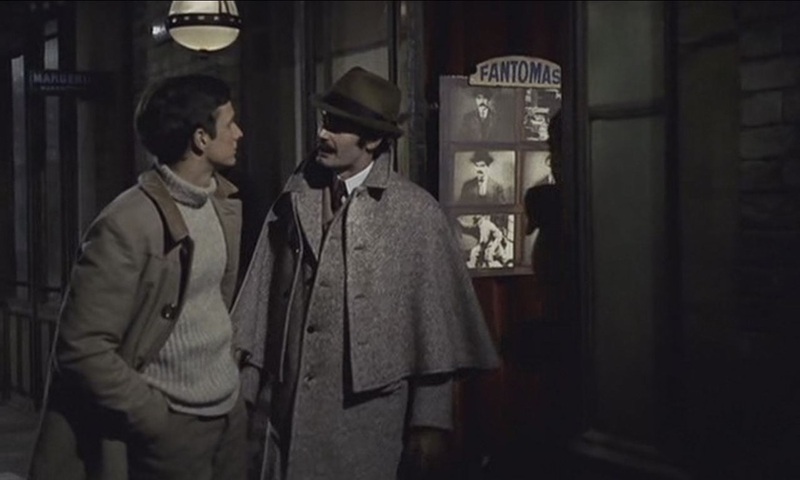 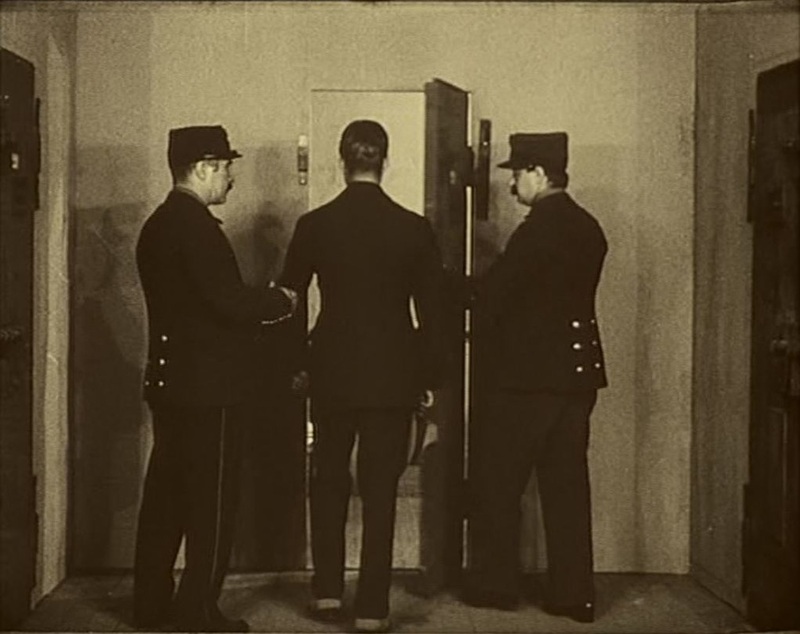 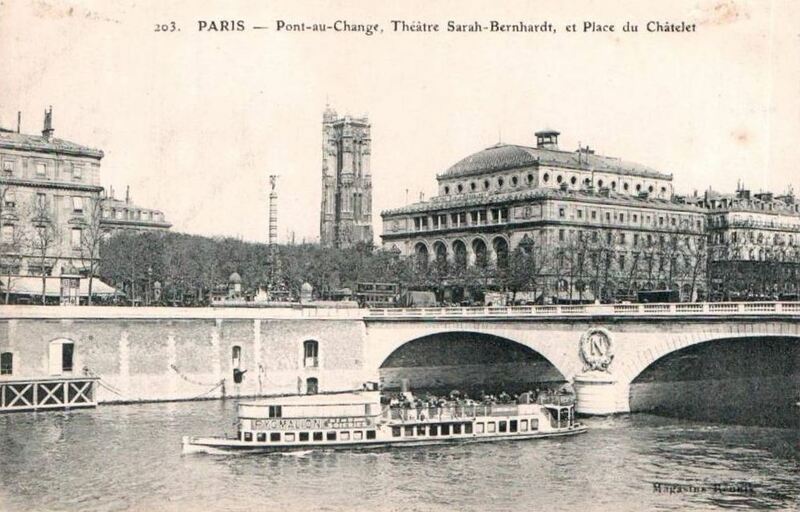 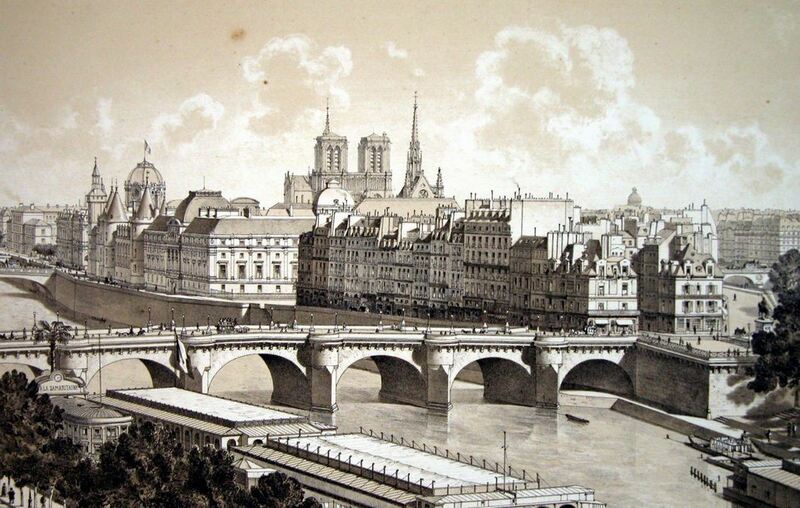 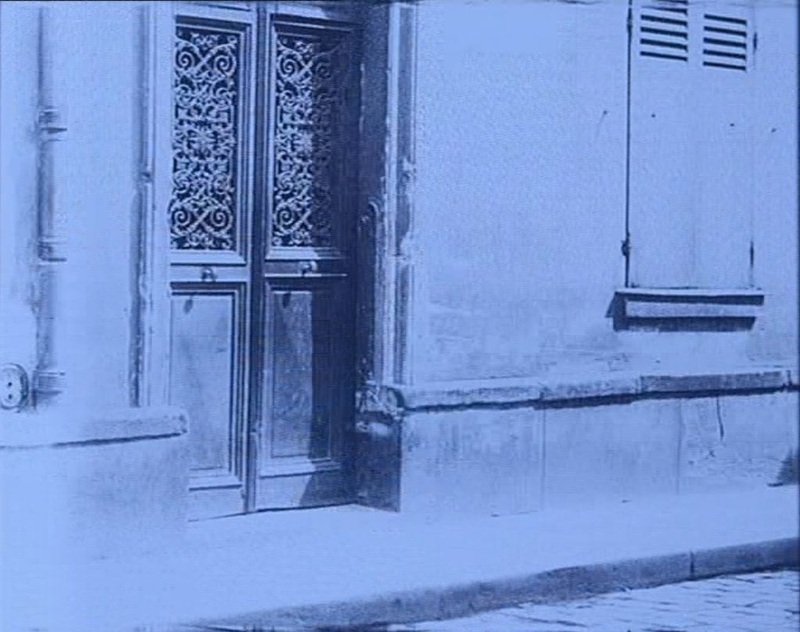 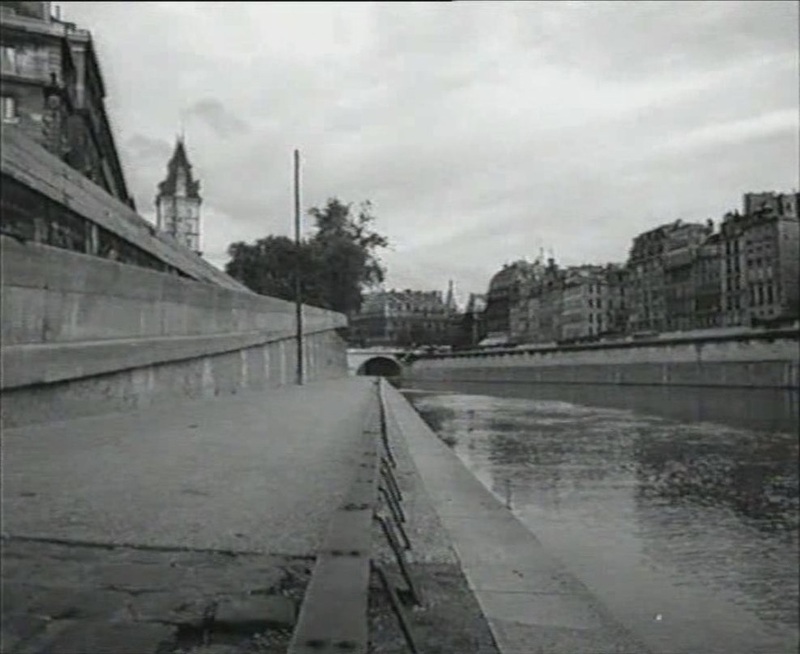 For a brief discussion of locations in Fantômas contre Fantômas see here.